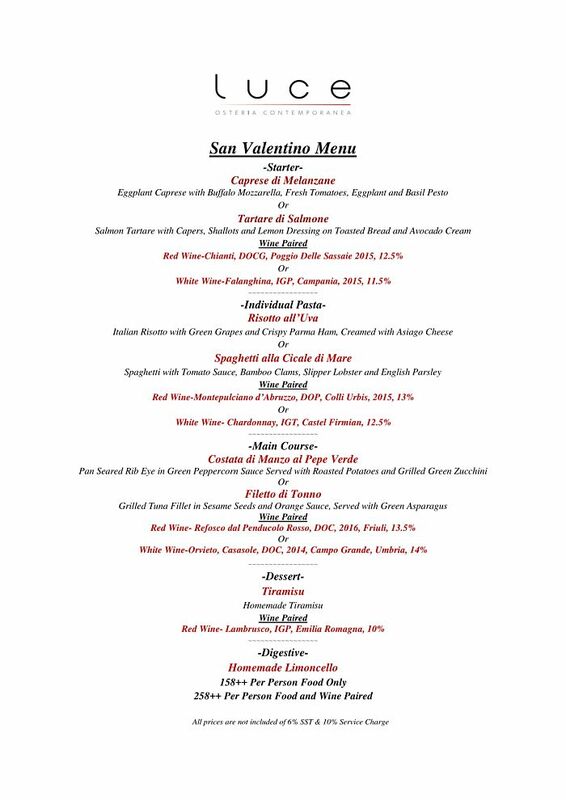 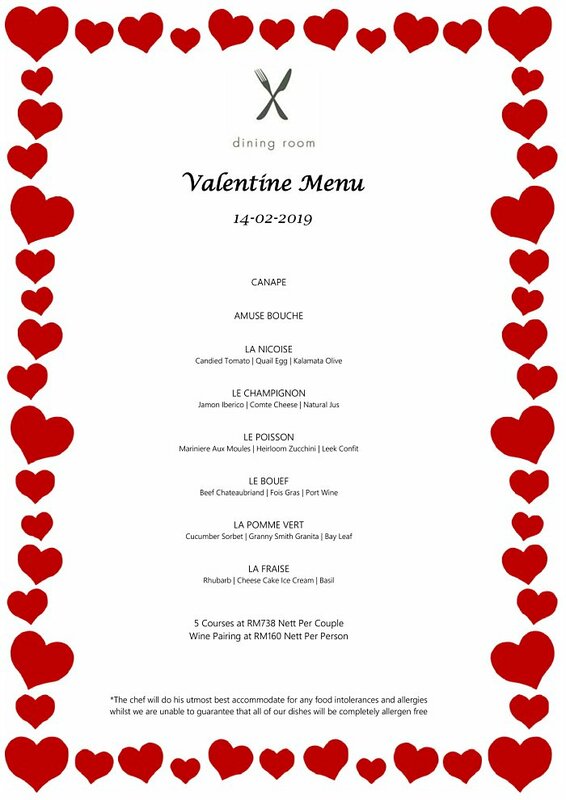 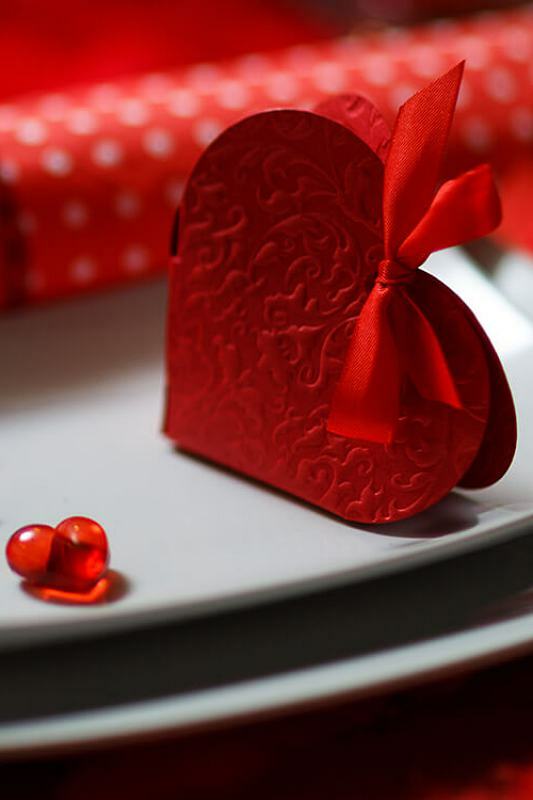 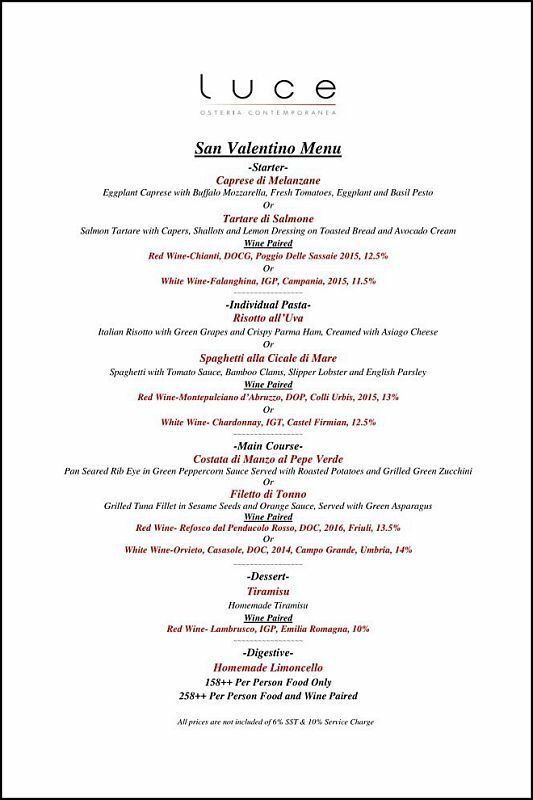 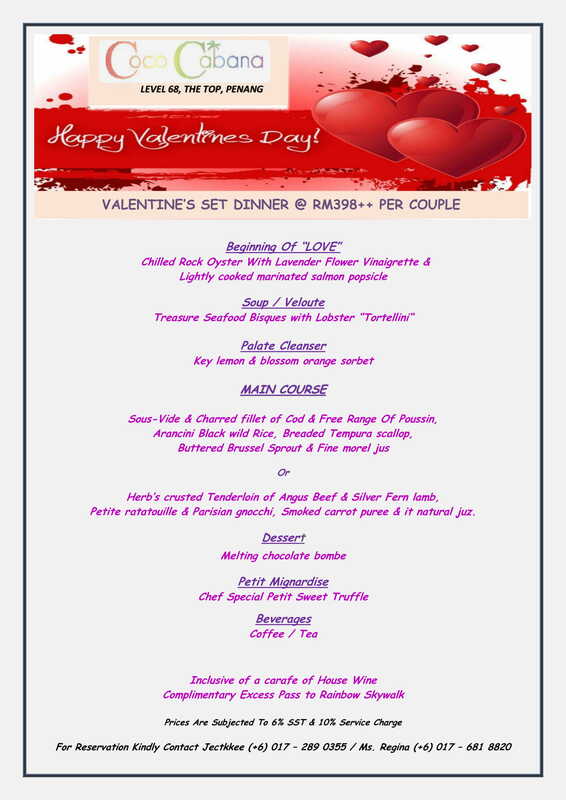 Love is in the air and it’s an opportunity to treat your loved ones to a romantic dinner. 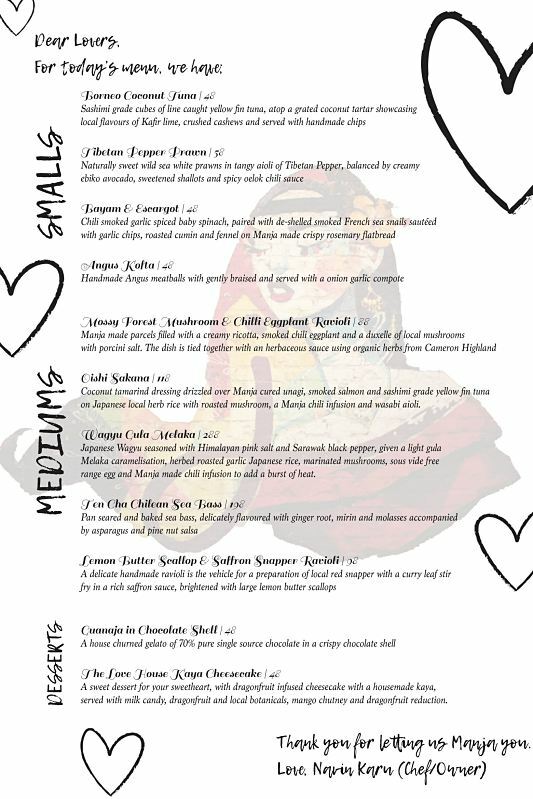 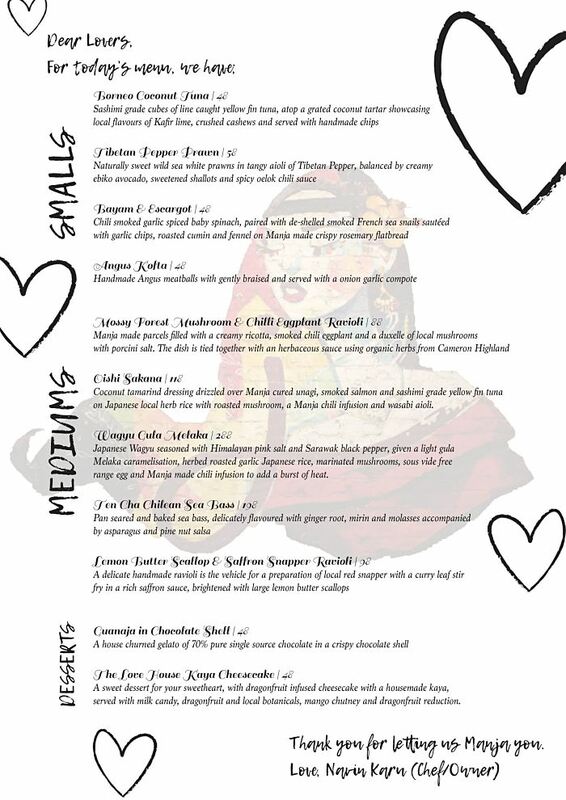 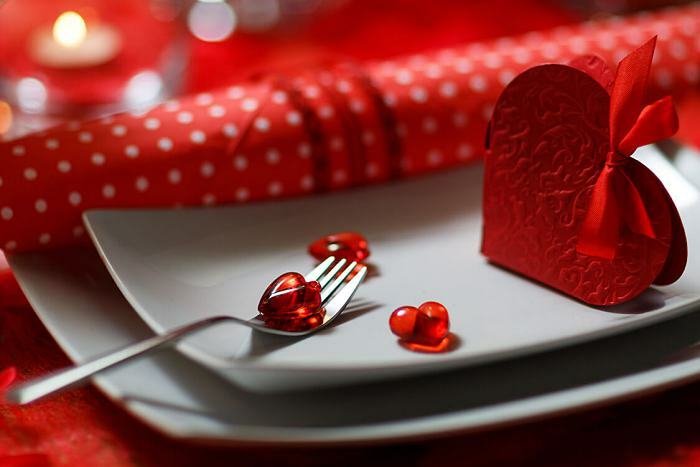 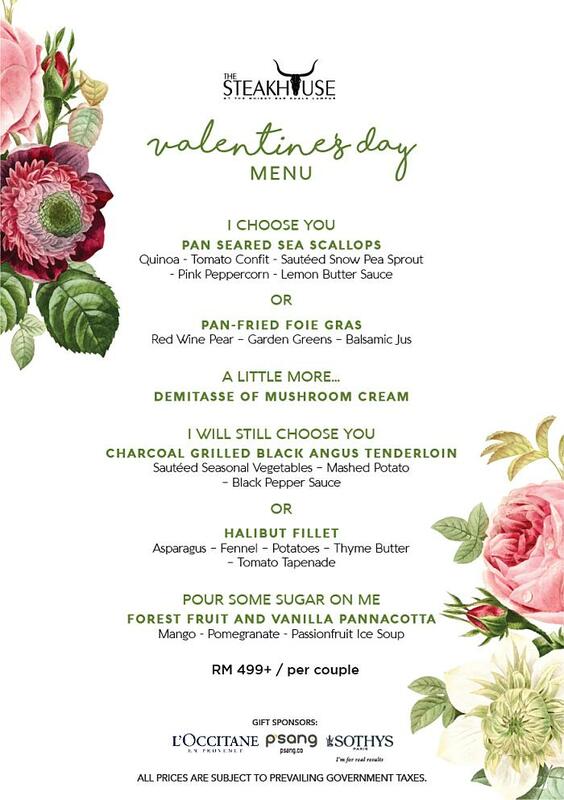 If you are wondering where to find one, here is a list of the top restaurants that serve Valentine’s menu this 2019! Highlight: Indulge in authentic Italian & Spanish food such as Focaccia bread, Manchego Cheese, Capocollo, Tuna Tartare and more in a cozy ambiance. 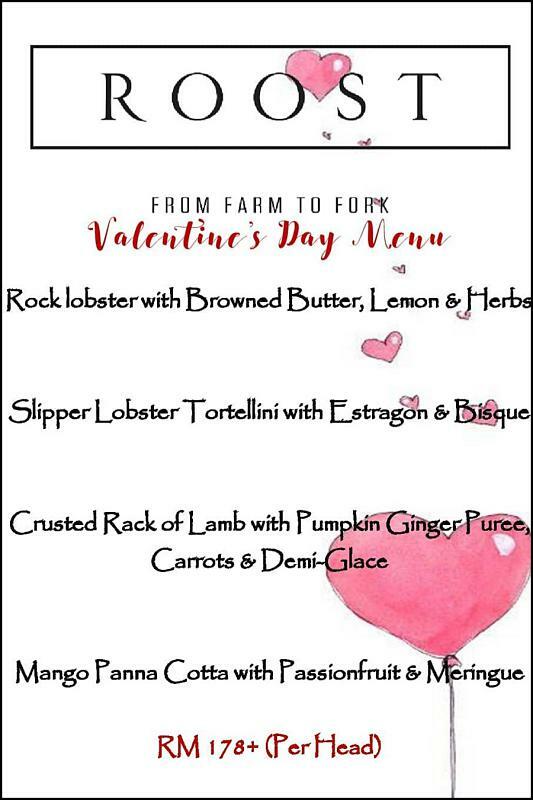 Free roses for the ladies! 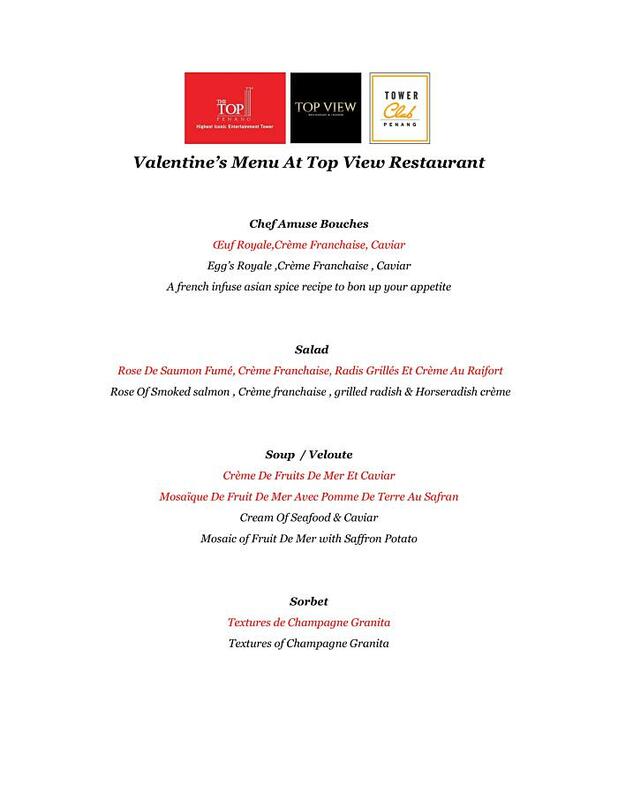 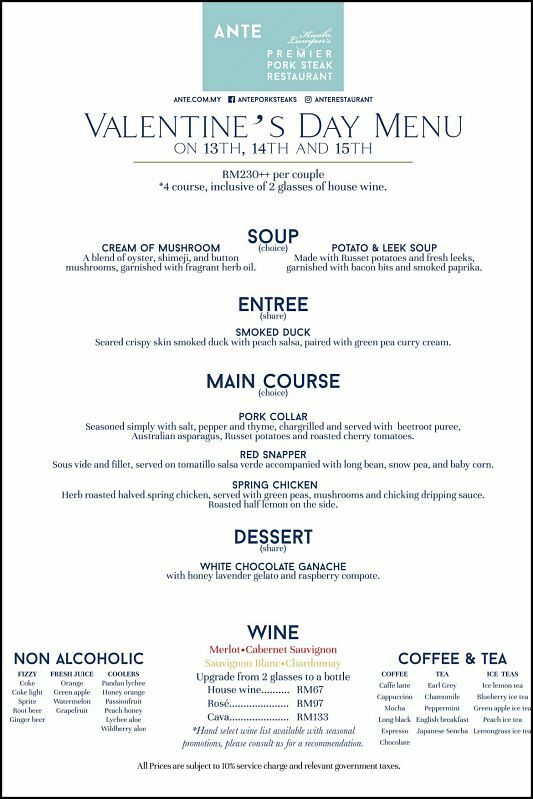 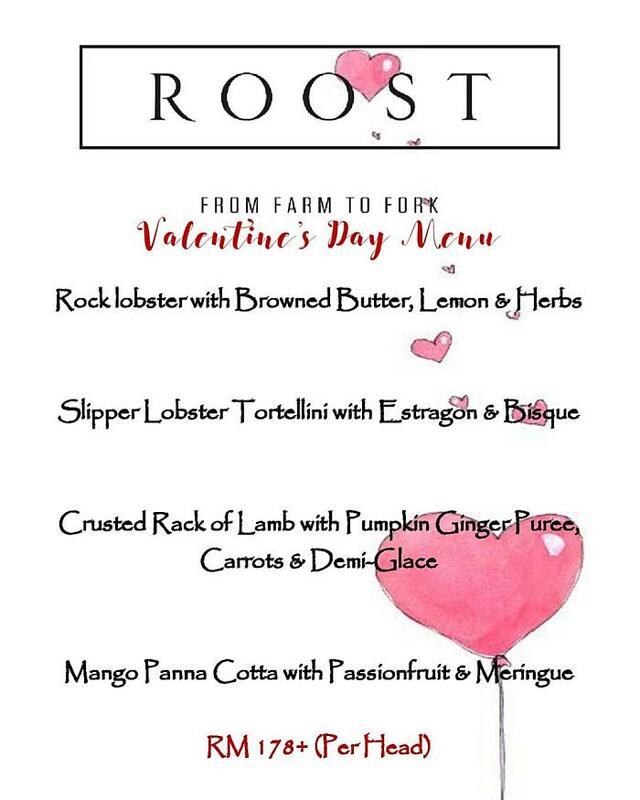 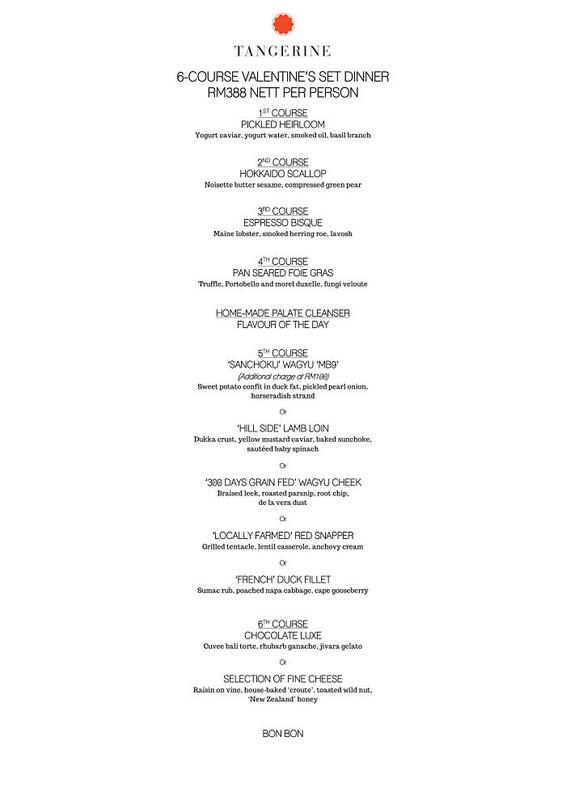 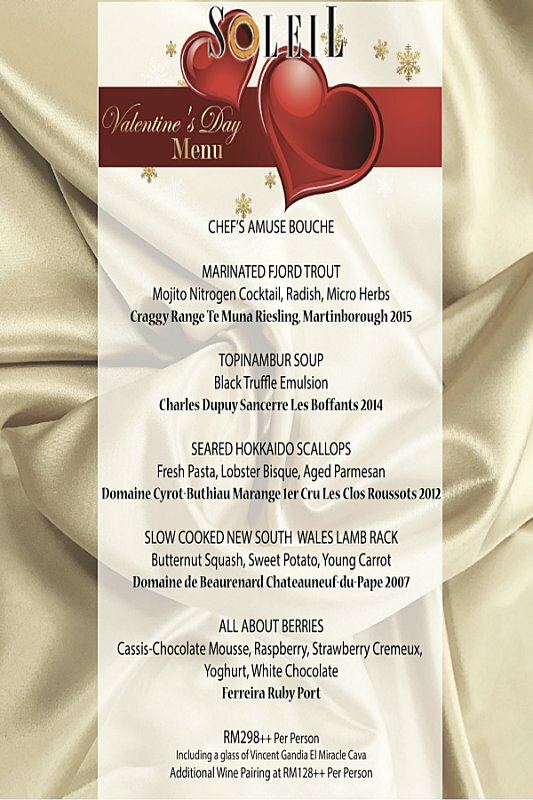 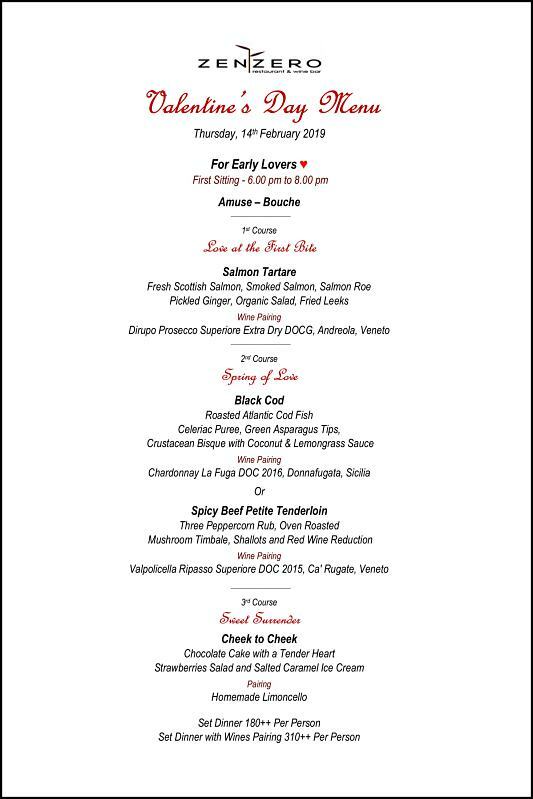 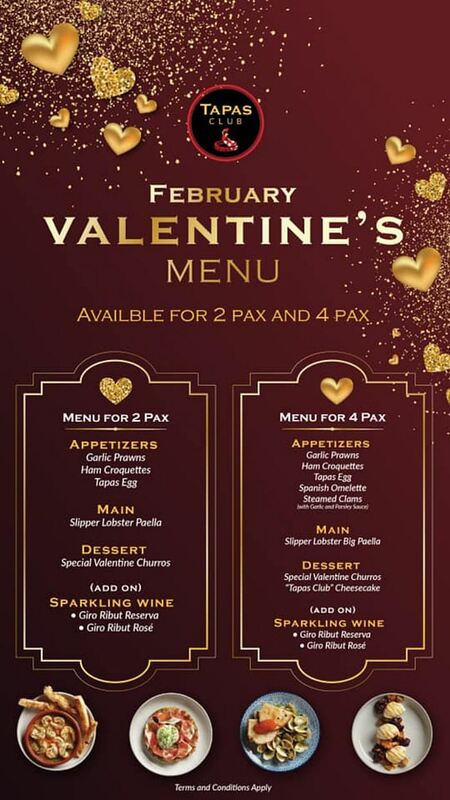 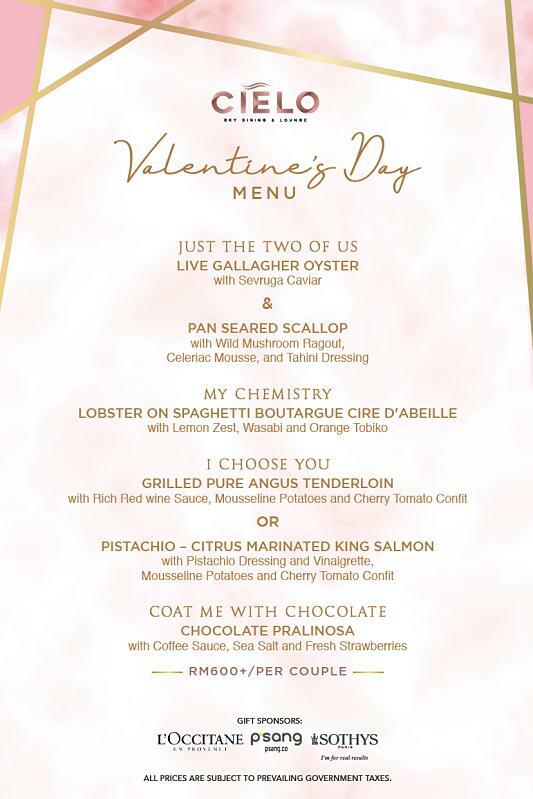 Highlight: Set heart aflutter as you and your Valentine spark romance in a fabulous dinner featuring fresh Canadian Lobster and delectable dishes from Western, Italian and Chinese menus. 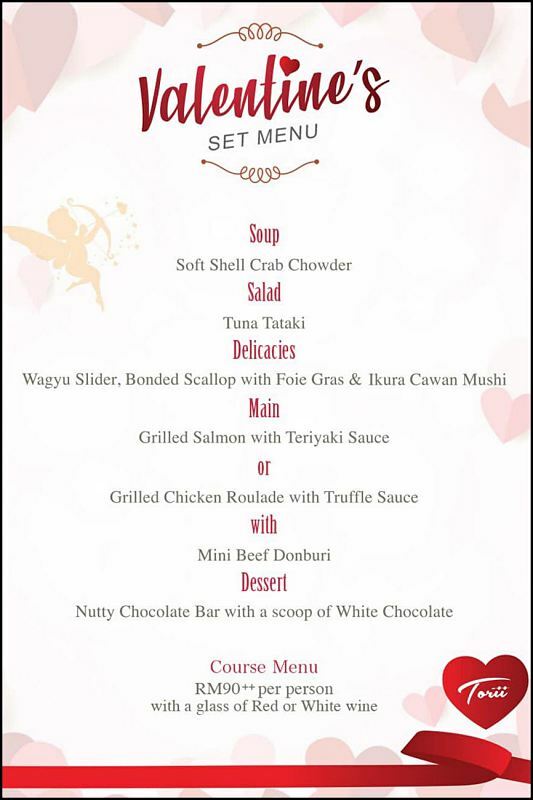 Price: From RM256 nett per couple. 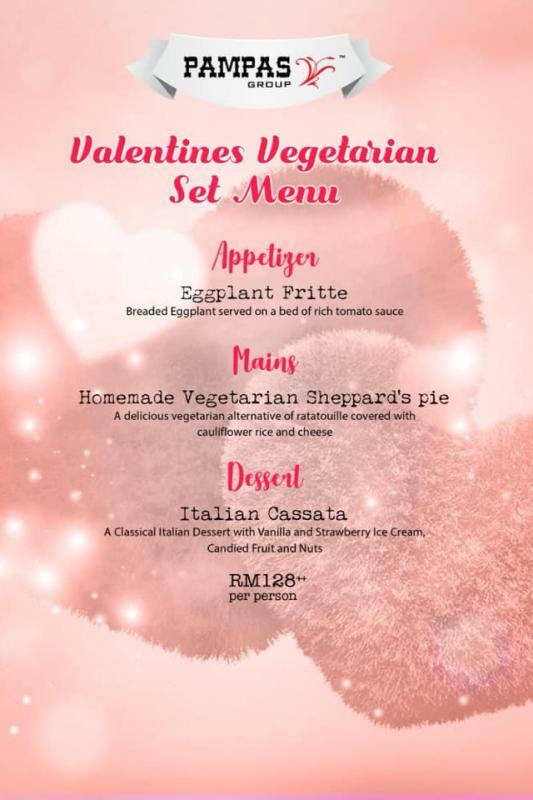 Highlight: Dine at the heritage building Old Malaya while being surrounded by a romantic atmosphere and good foods such as Eggplant Fritte, Italian Cassata, Vegetarian Sheppard’s Pie and other delights. 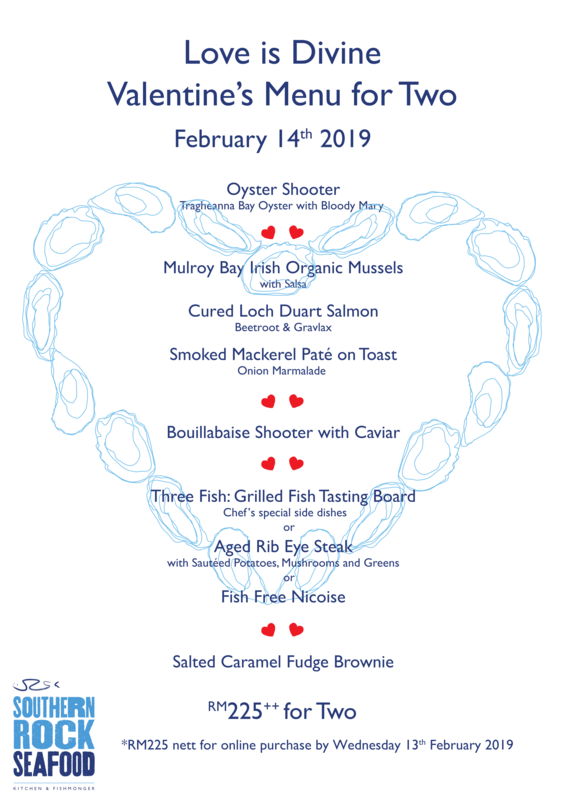 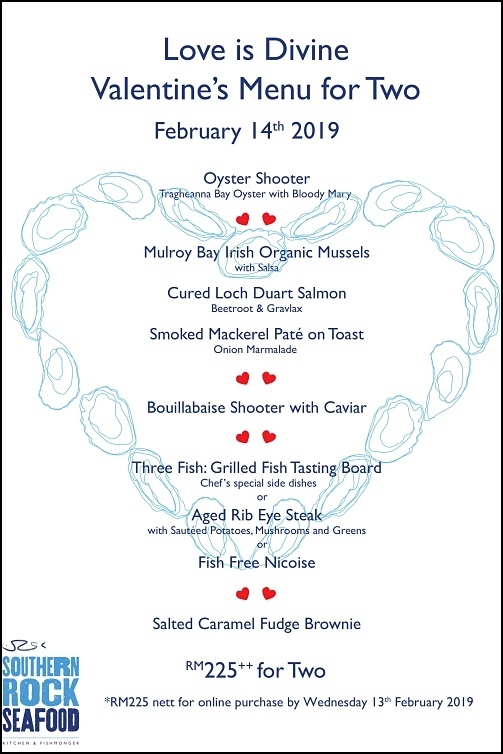 Highlight: Treat your loved one to a dinner at one of the much-loved seafood restaurants in town and revel in delights like Mulroy Bay Irish Organic Mussles, Cured Loch Duart Salmon and many more. 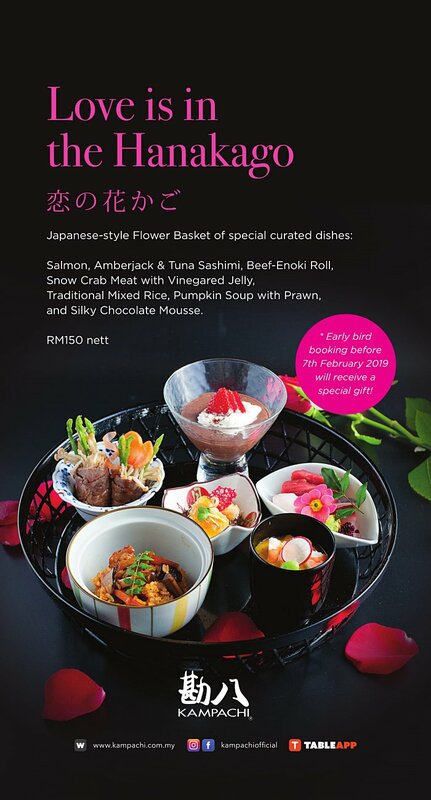 Highlight: Celebrate your Valentine’s Day with this Japanese-style Flower Basket of special curated dishes such as Premium Sashimi, Beef-Enoki Roll, Snow Crab Meat and many sumptuous delicacies. Price: RM150 nett per person. 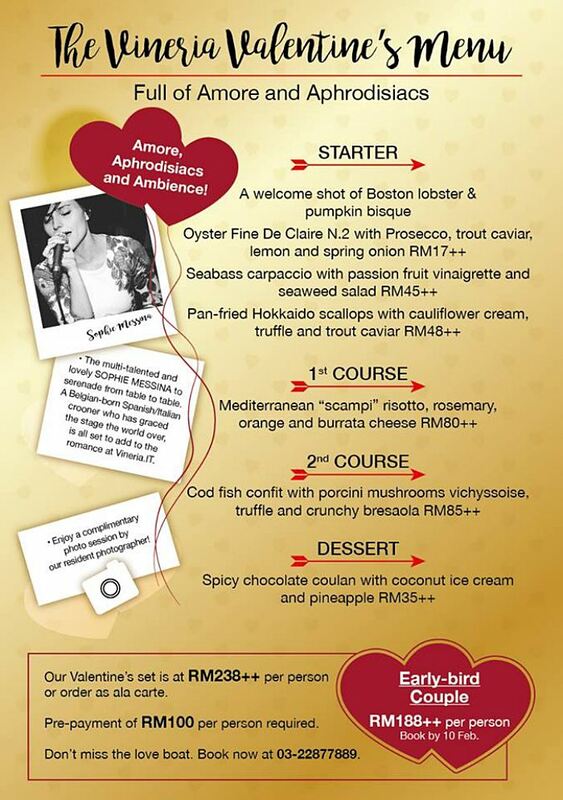 Price: RM288 nett per pair. 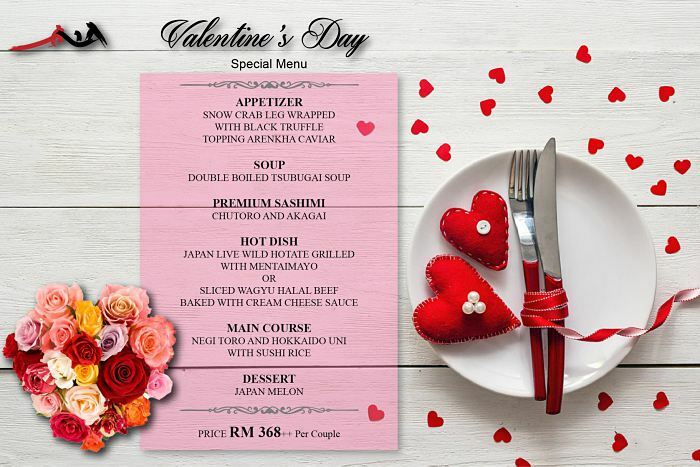 Highlight: Delve into great delicacies at this restaurant serving exquisite cuisine for this special night including Truffle Mushroom Soup, Kani Goma Salad, a choice of mains like Big ‘S’ Pork Ribs and more. 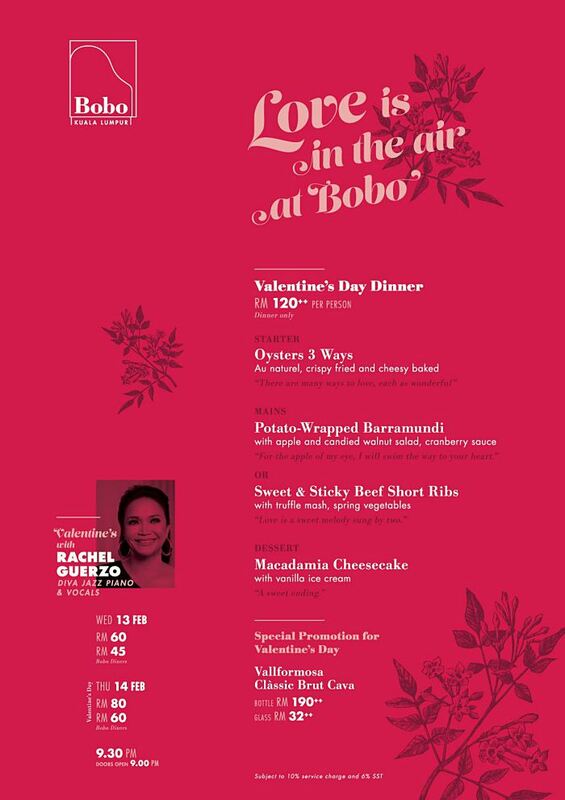 Highlight: Come to the restaurant to immerse in a night to remember with live music and great dishes like Oysters 3 Ways, Sweet & Sticky Beef Short Ribs, Macadamia Cheesecake and other great delicacies. 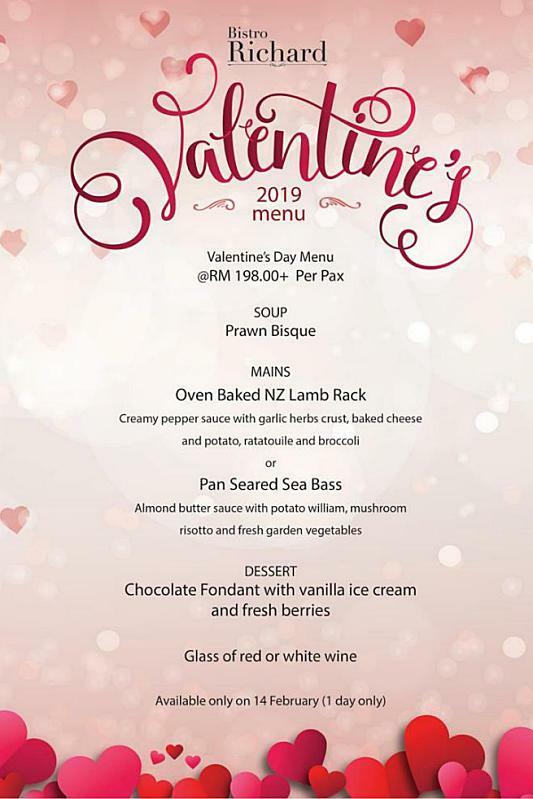 Highlight: Great delicacies are awaiting to satisfy your palate such as Seared Scallop with Chili and Ginger Dressing, Lobster Bisque, Grilled New Zealand Rack of Lamb, Baked Cod and more. 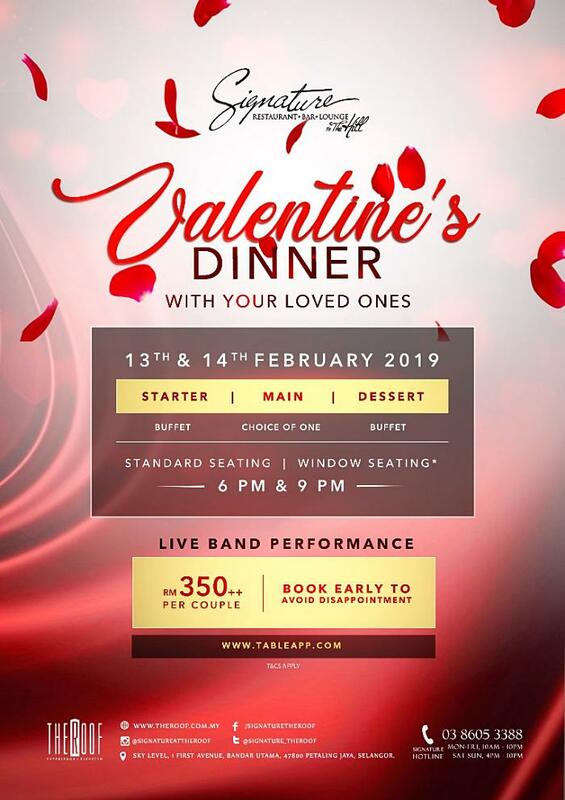 Highlight: Indulge your dearest to a memorable night to spark the romance with great dishes like Avocado Grilled Chicken Salad, Seafood Chowder, Grilled Black Angus Sirloin, Cheesecake Parfait and other delights. 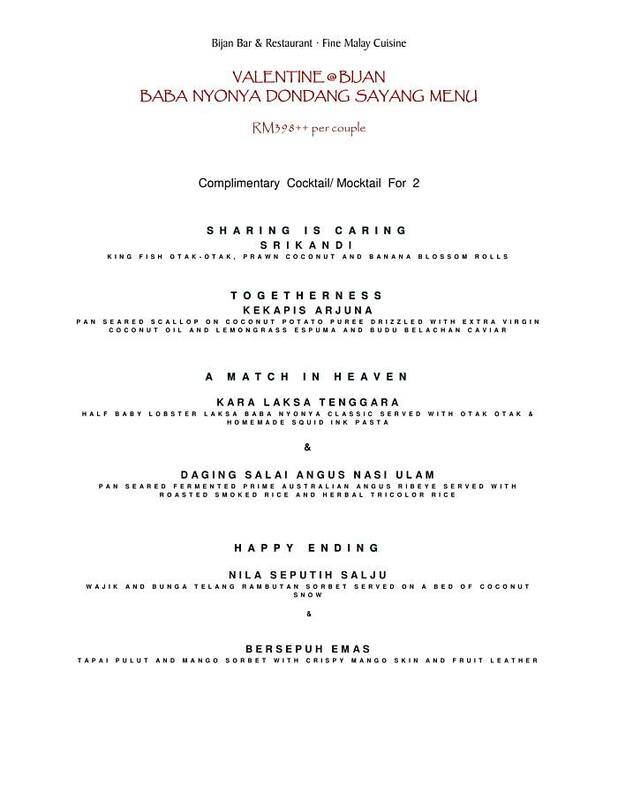 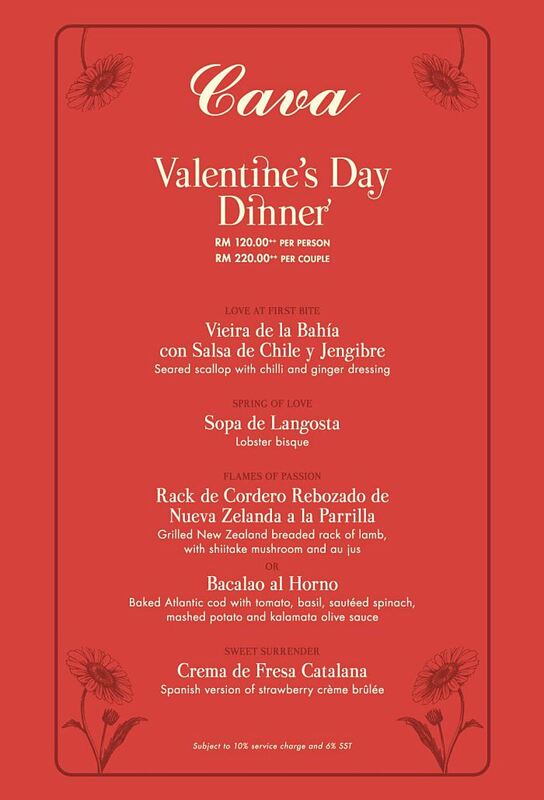 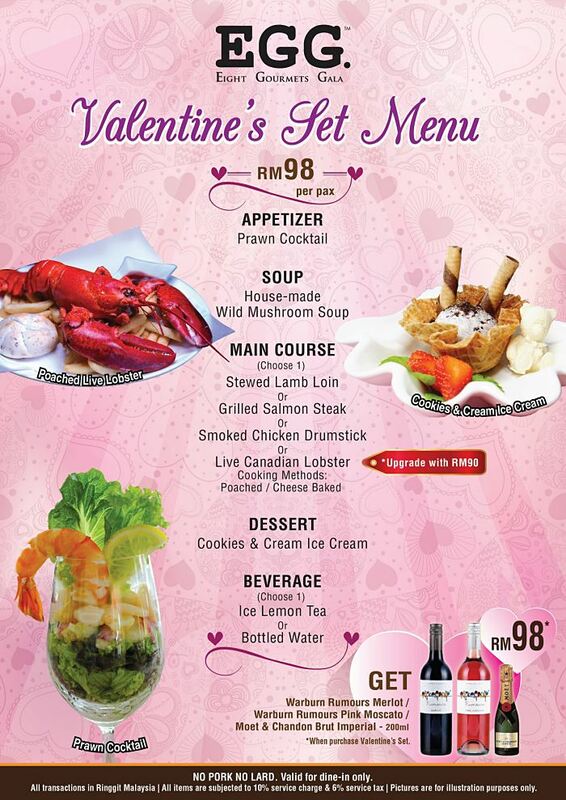 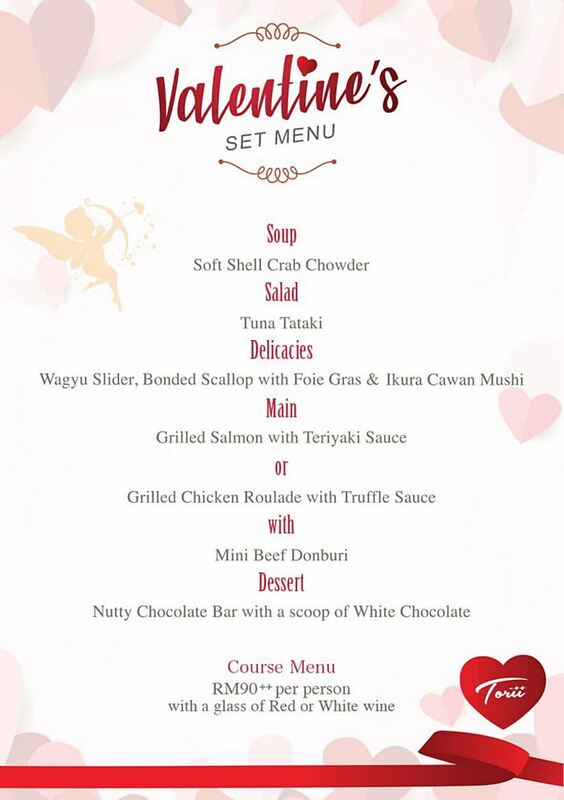 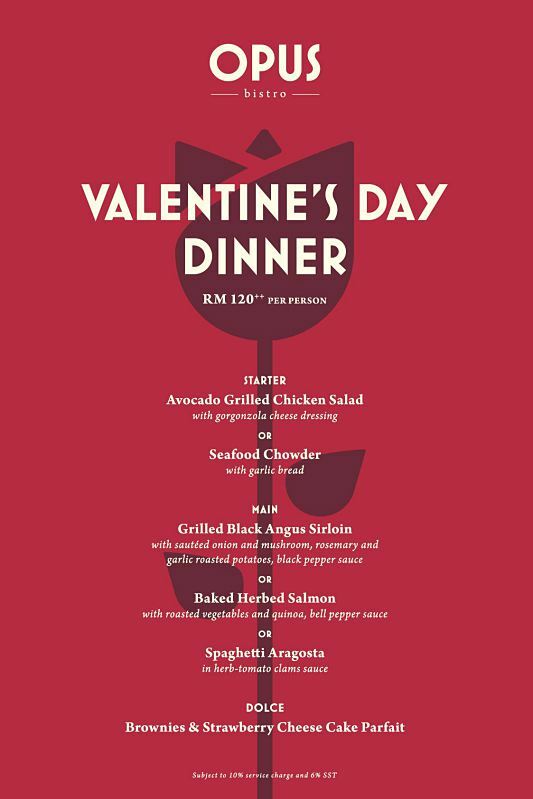 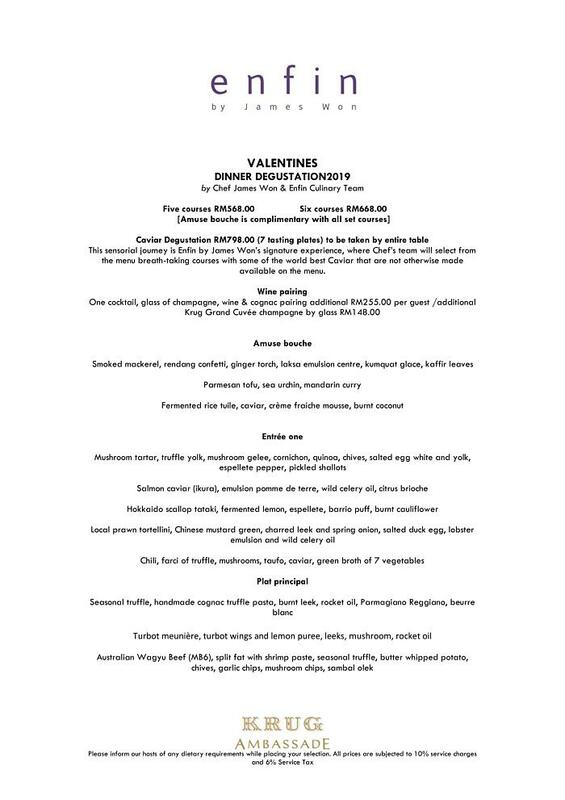 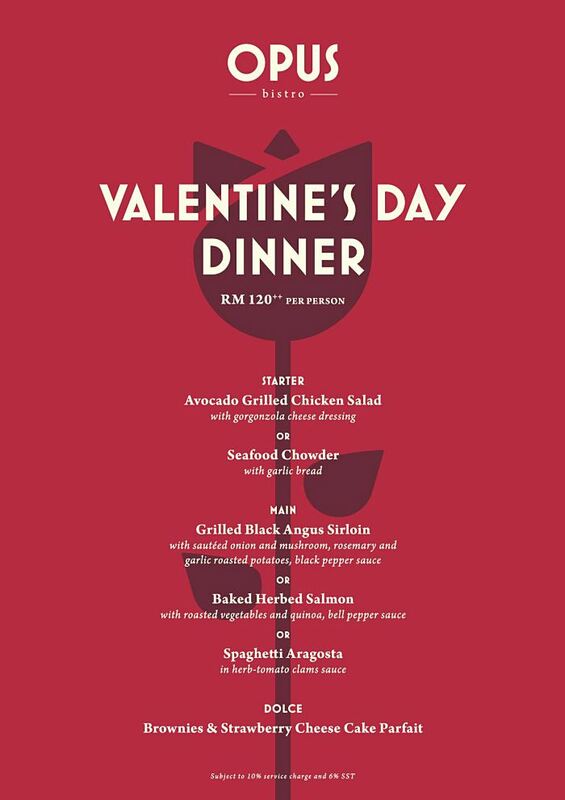 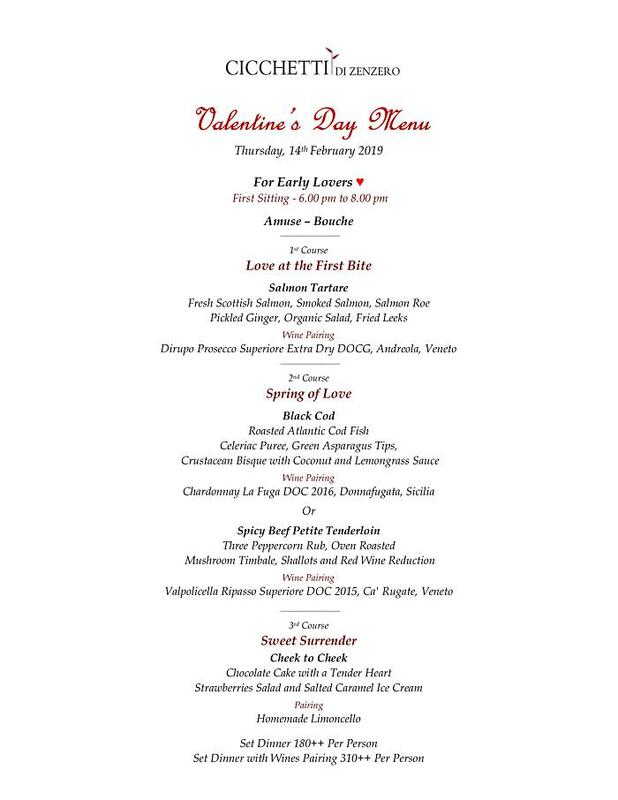 Highlight: What’s better than gratifying your loved one with special Western delights such as Prawn Cocktail, Stewed Lamb Loin, Grilled Salmon Steak, Smoked Chicken Drumstick, Live Canadian Lobster and more. 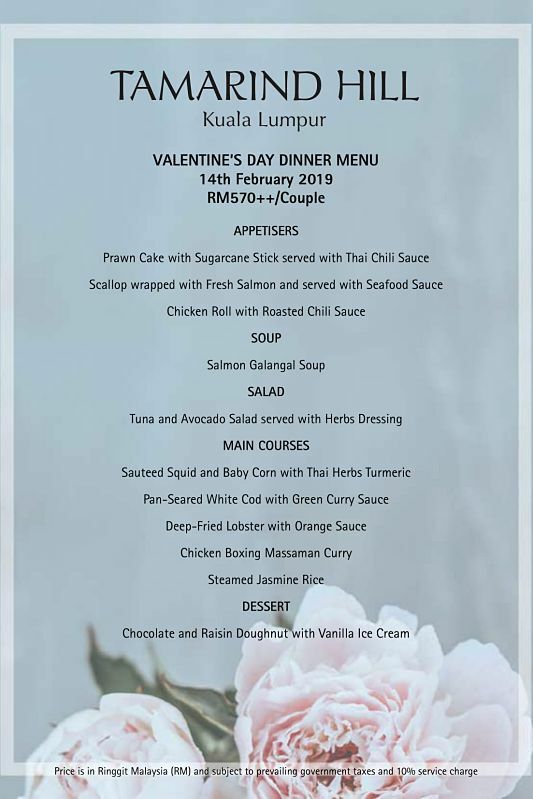 Highlight: Celebrate your love by tempting your taste buds with Asian fusion dishes that you would not want to miss out such as Salmon Queen Sushi Roll, Baked Salmon with Honey Miso Butter Sauce and more delights. 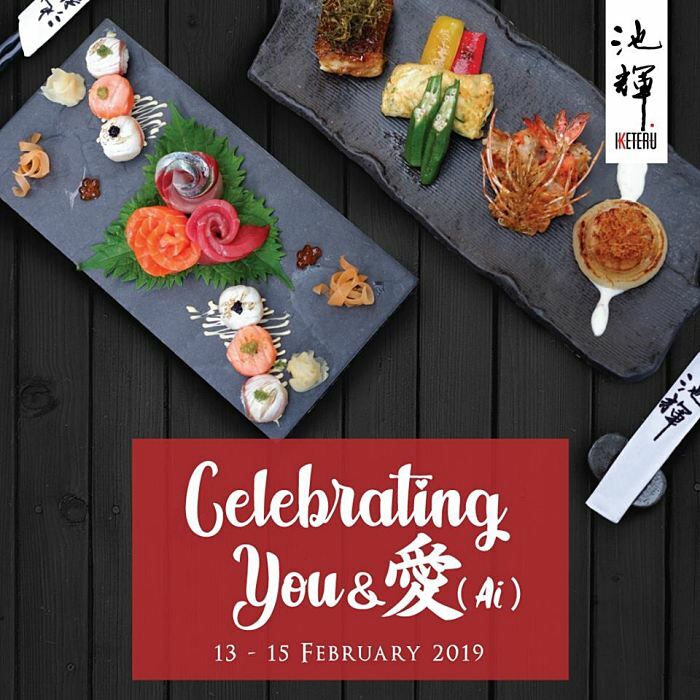 Highlight: Have a fascinating dinner at this Japanese-accented gastro-bar which will surely please your palate with dishes like Soft Shell Crab Chowder, Wagyu Slider, Grilled Chicken Roulade, Mini Beef Donburi and others. 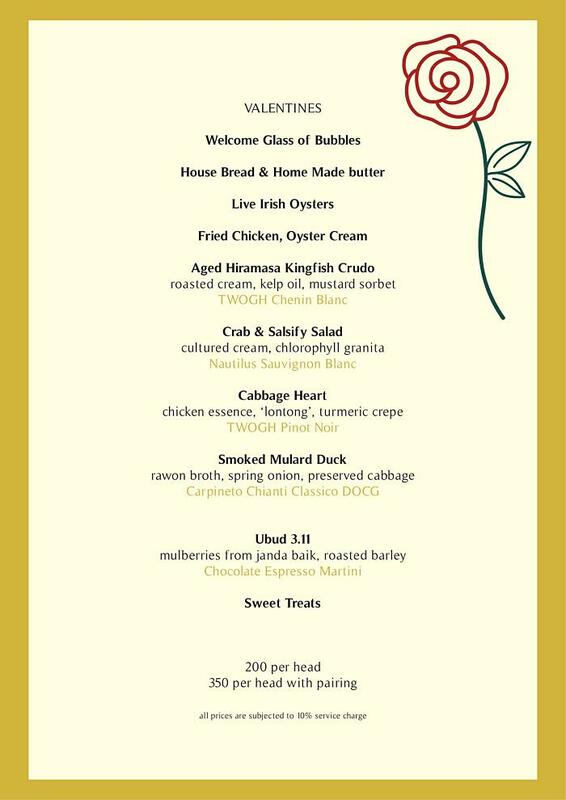 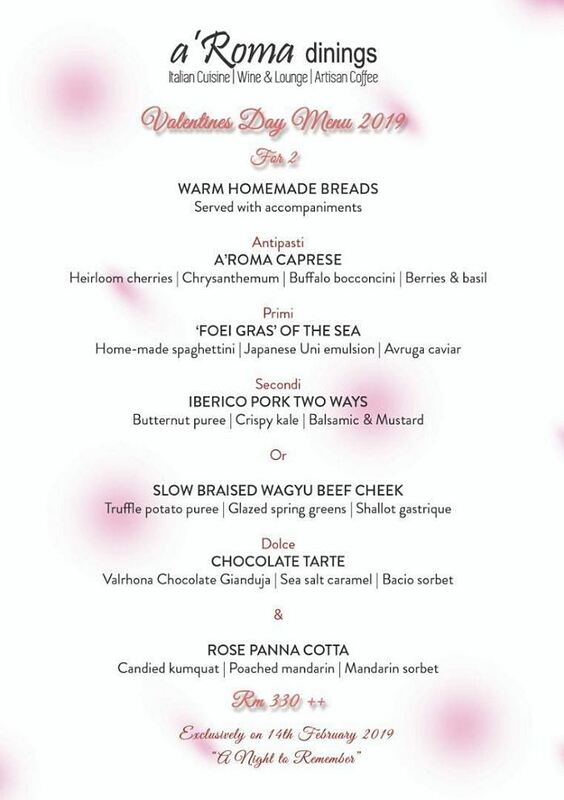 Highlight: Relish your Valentine’s celebration to its best with European fusion dishes such as Handmade Angus Meatballs, Japanese Wagyu, Tencha Chilean Sea Bass, Lemon Butter Scallop and so on. 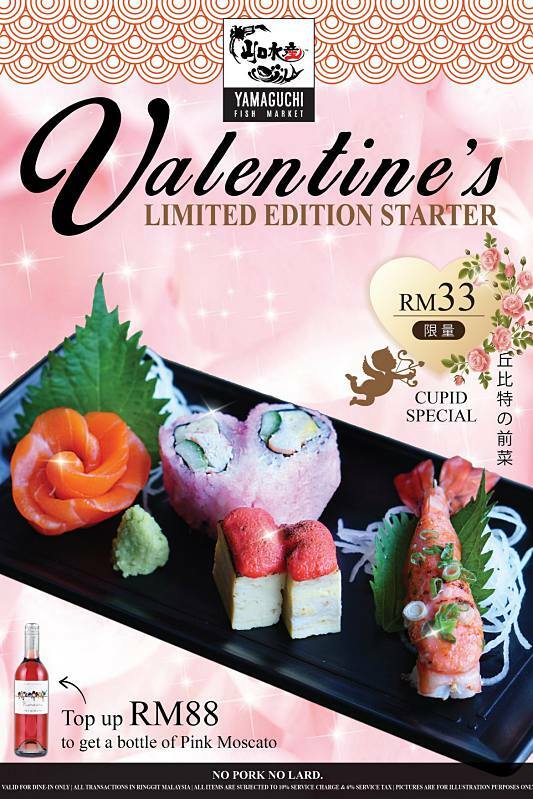 Price: From RM48 per item. 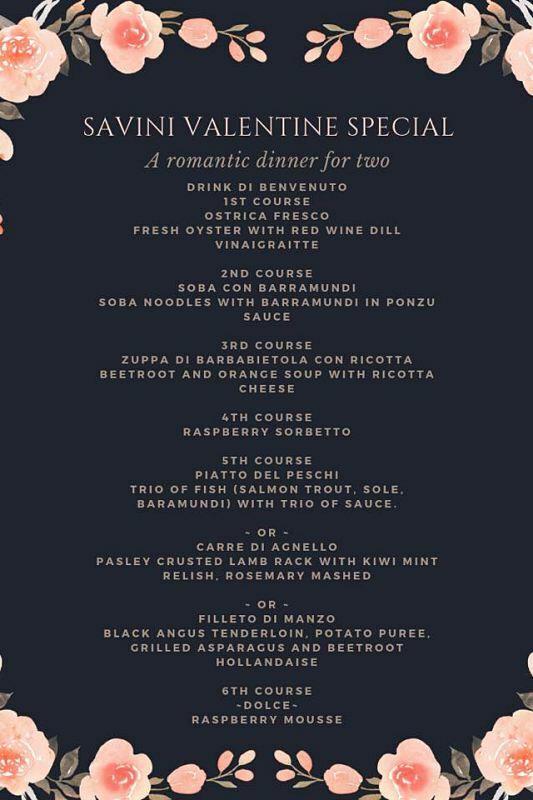 Highlight: Have a romantic dinner for two at this fine dining Italian restaurant with great dishes like Fresh Oyster, Soba Noodles, Raspberry Sorbetto, Pasley Crusted Lamb Rack, Black Angus Tenderloin and more. 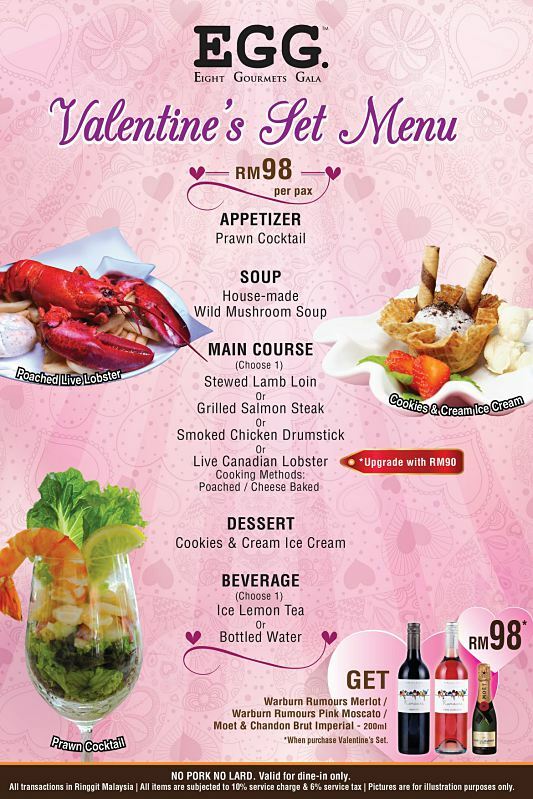 Price: RM268 nett per couple. 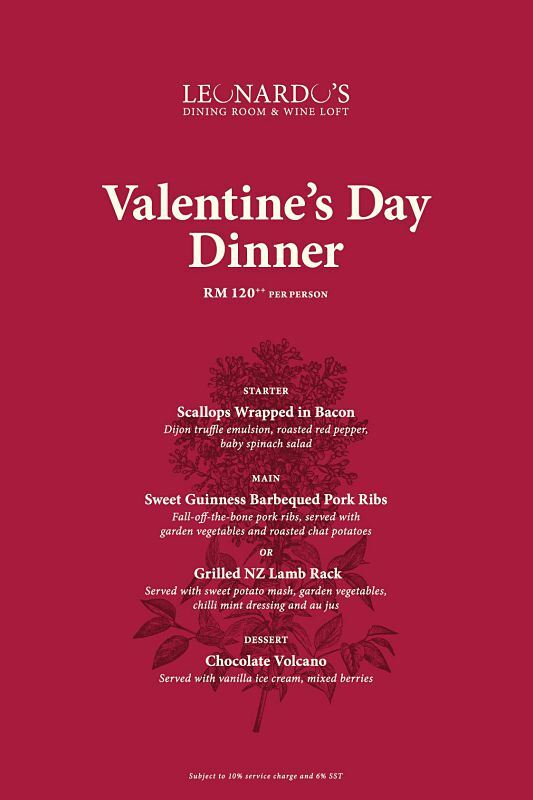 Highlight: Immerse in a special dinner with fascinating delights of international flavors including Scallops Wrapped in Bacon, Sweet Guinness Barbequed Pork Ribs or Grilled NZ Lamb Rack and Chocolate Volcano. 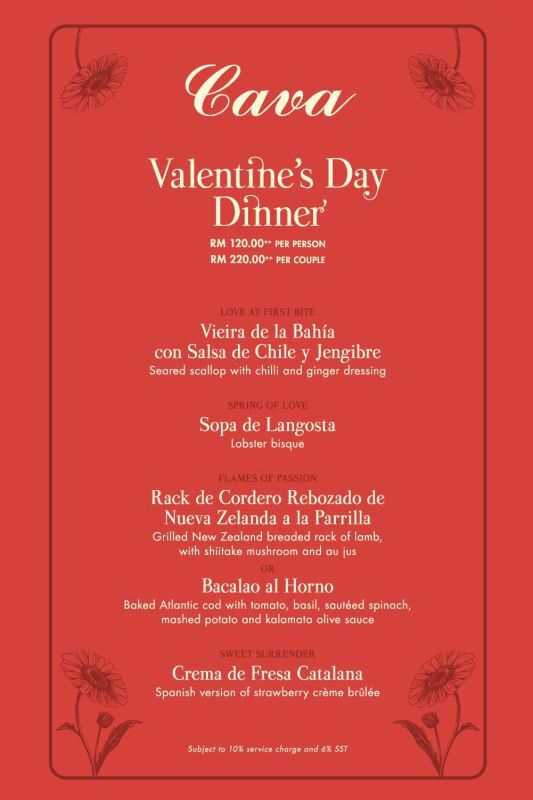 Highlight: Your great chance to please your taste buds with incredible delights featuring Ensalada de Jicana y Mango, Fish Taco Grande, Costilla Asada – Beef Ribs, Special Dessert and Love Potion Mocktail. 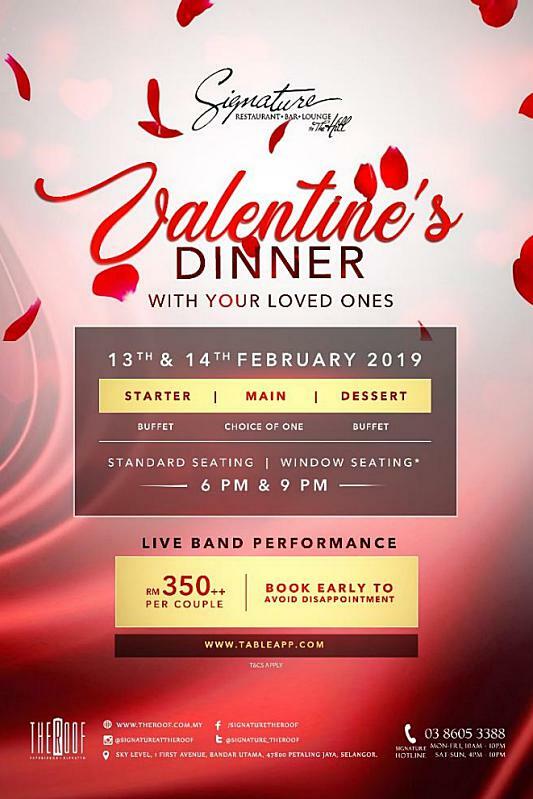 Highlight: Immerse in a night to remember surrounded by exquisite decorations and pamper your palate with Tenderloin Angus Beef & Lobster Roulade, Pan Seared Red Snapper, Crusted Lamb Loin and more. 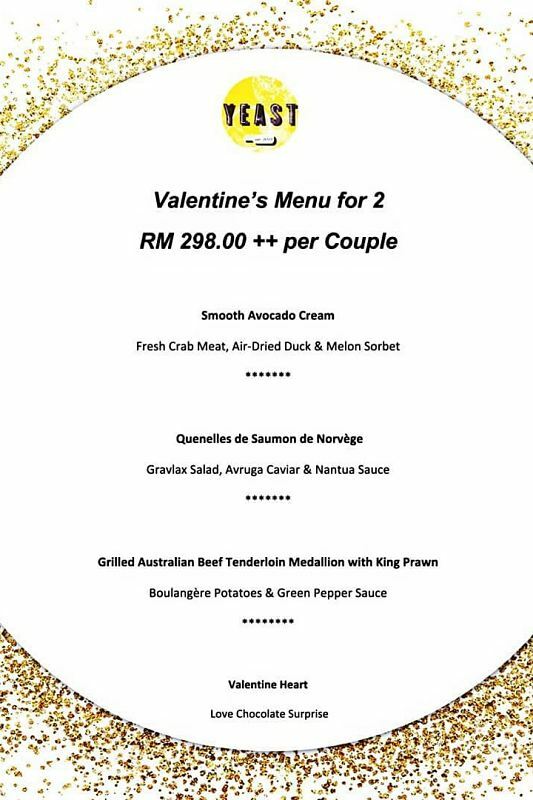 Price: RM260 nett per couple. 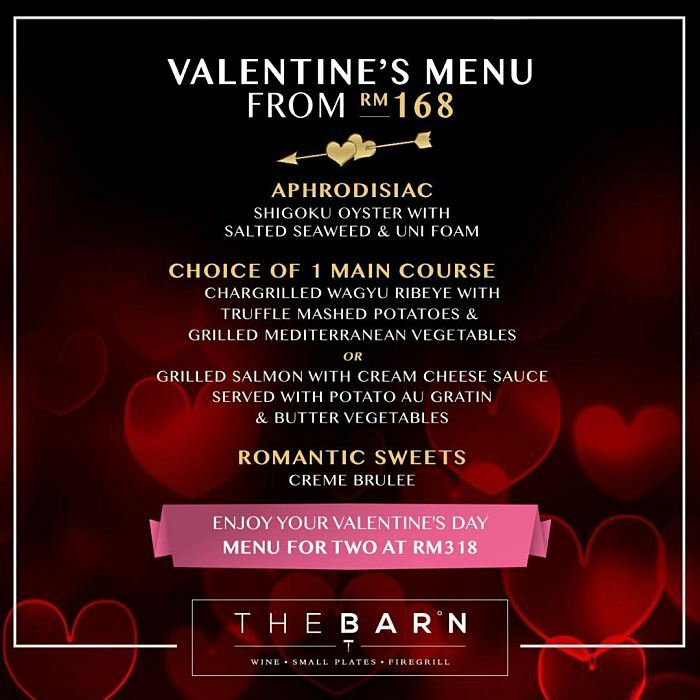 Highlight: Delight your taste buds in this gourmet restaurant with delectable Western dishes featuring Broccoli & Cauliflower Soup and a BBQ Platter with Ribeye, Spring Chicken, Baramundi Sausages and so on. 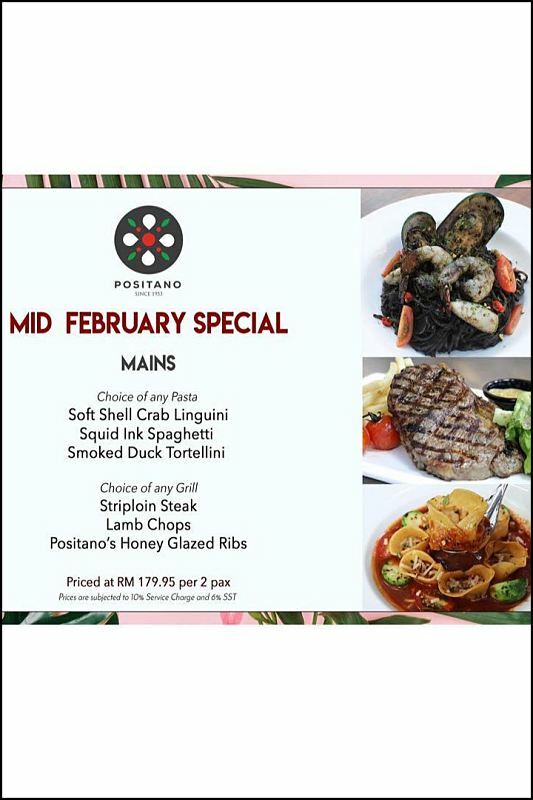 Highlight: Treat him/her to Singapore’s #1 Italian, Halal and Authentic Pizza Restaurant to enjoy delicious Pasta such as Smoked Duck Tortellini or a choice of Grill like Striploin Steak, Lamb Chops and other delights. 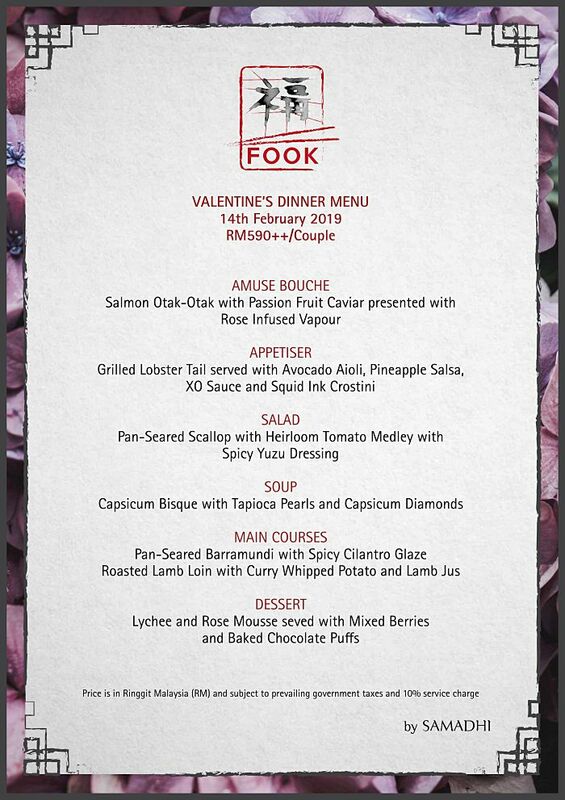 Highlight: Tuck into a one-of-a-kind Valentine’s dinner featuring international dishes and live cooking session. 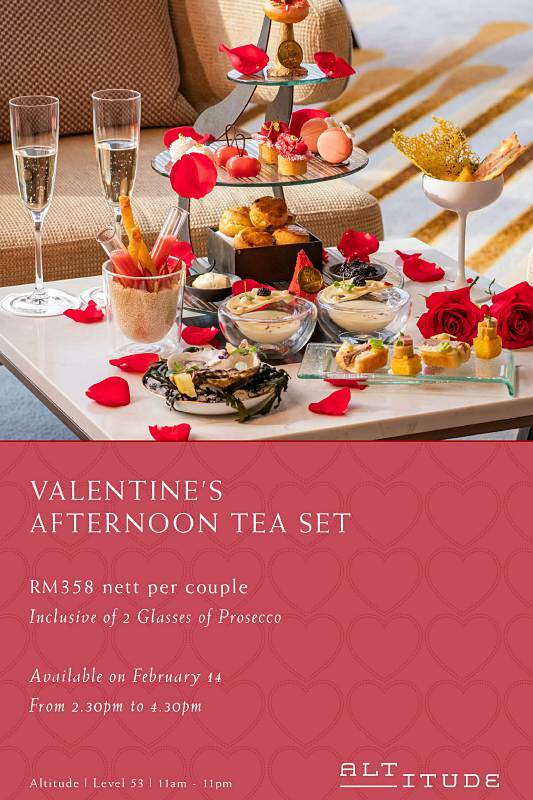 Get 2 complimentary glasses of sparkling wine for couples and chocolate praline for ladies. 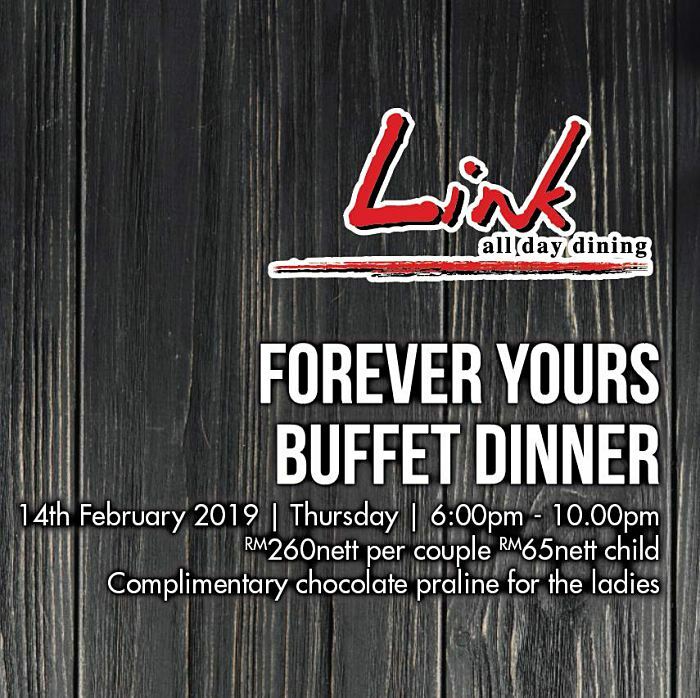 Highlight: Revel in a special 4-course dinner at this porkylicious restaurant with dishes like Pork Collar, Smoked Duck, Spring Chicken, White Chocolate Ganache and so on! 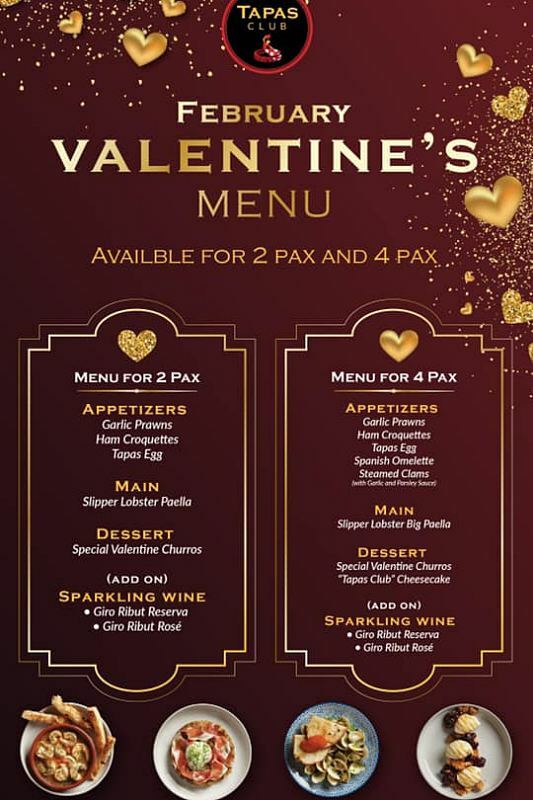 Complimentary 2 glasses of house wine! 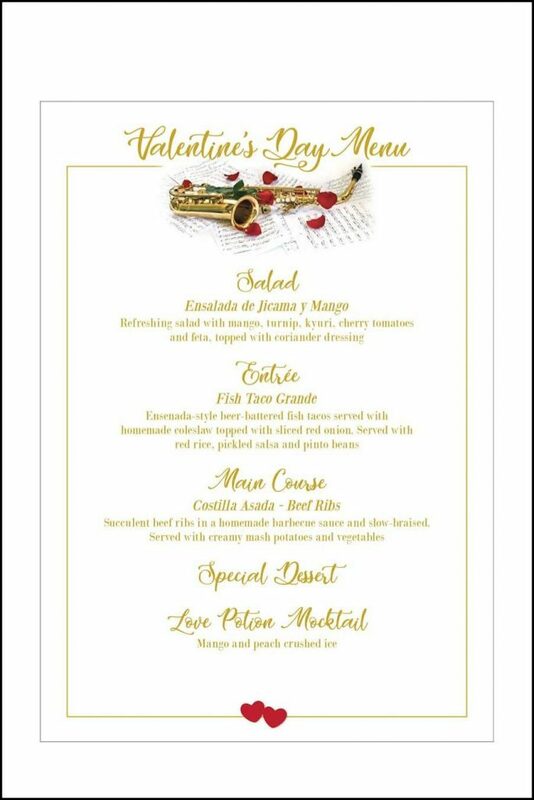 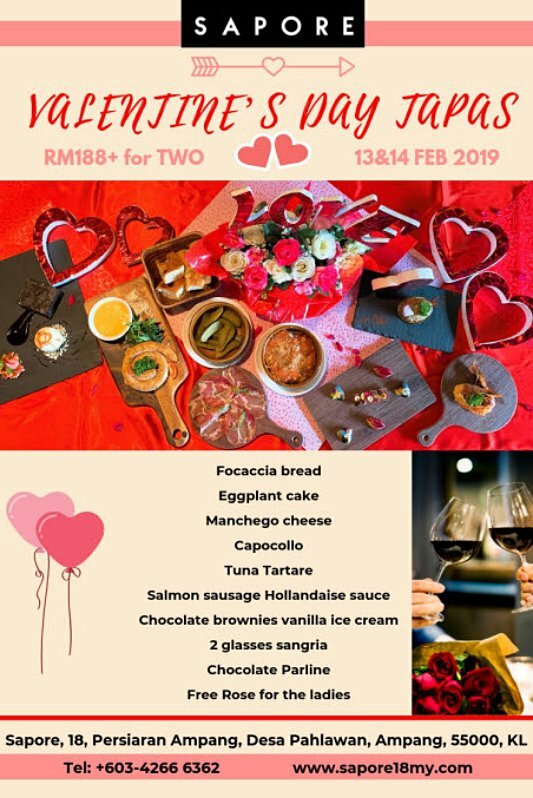 Highlight: Have a night to remember with sumptuous classic Tapas and specialties such as Garlic Prawns Ham Croquettes, Tapas Egg, Slipper Lobster Paella, Special Valentine Churros and other delicacies. 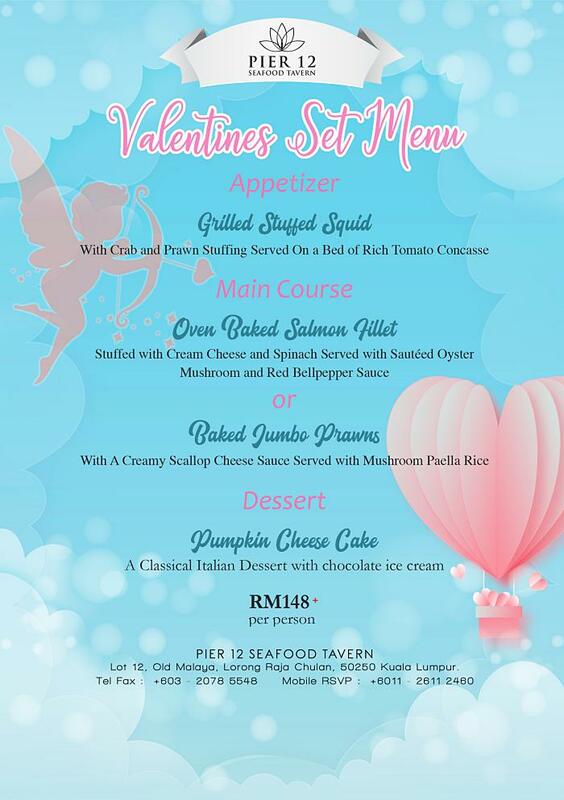 Price: From RM150 per couple. 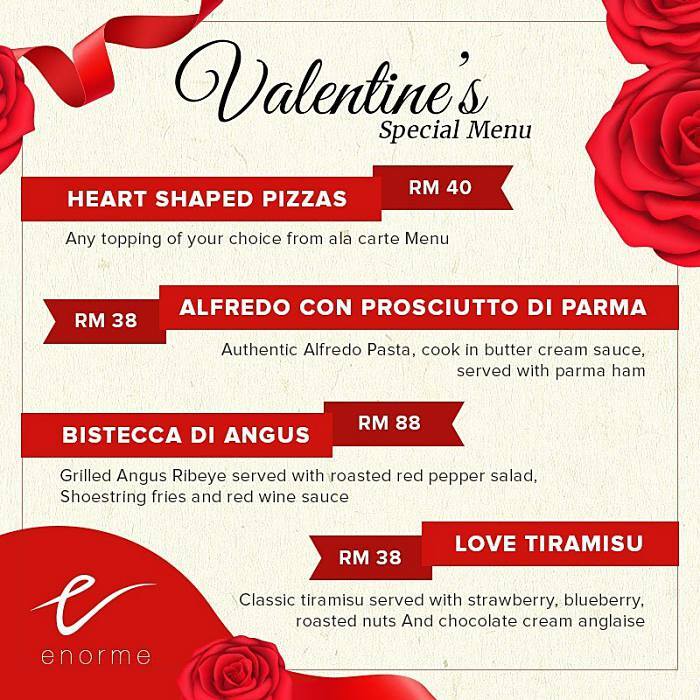 Highlight: Delight your taste buds with Malaysian-bred Italian cuisine and international flavors including Heart Shaped Pizzas, Alfredo Con Prosciutto Di Parma, Bistecca Di Angus and Love Timarisu. 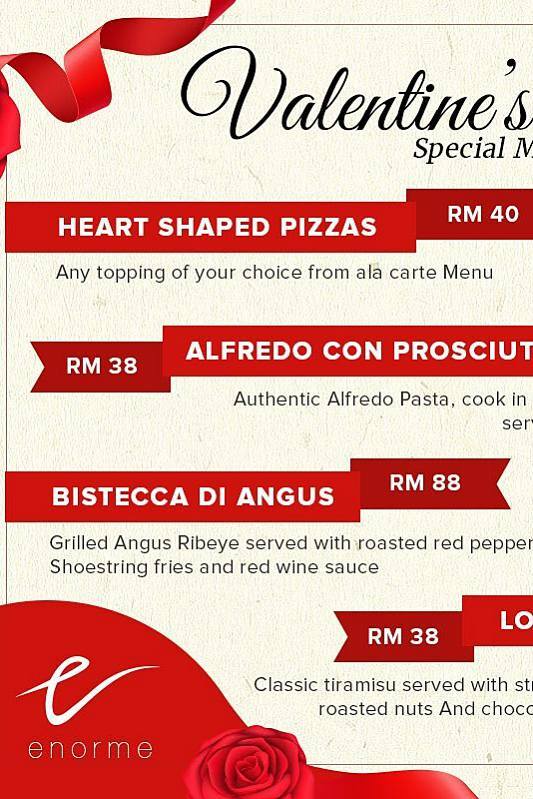 Price: From RM38 per item. 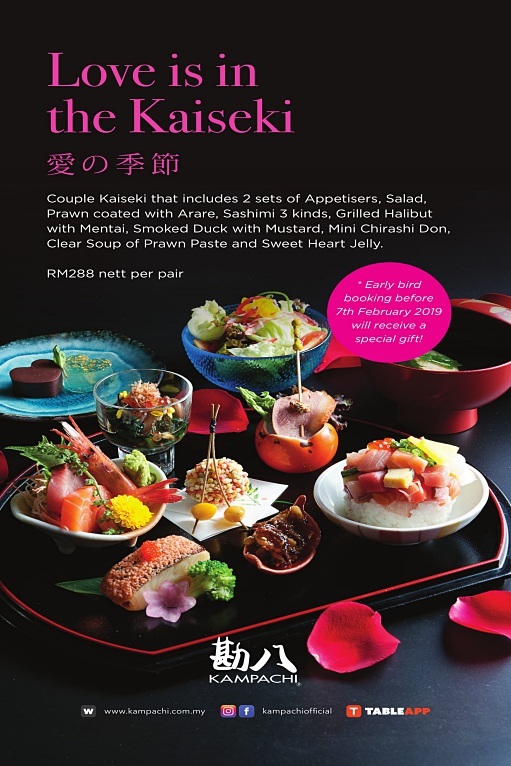 Highlight: Immerse in a menu inspired by a love affair with Thai and Japanese cuisine with a twist of presentation such as Grilled Oyster Chawanmushi, a choice of Tuna Sushi Roll, Tempura Sushi Roll, Salmon Steak and so on. 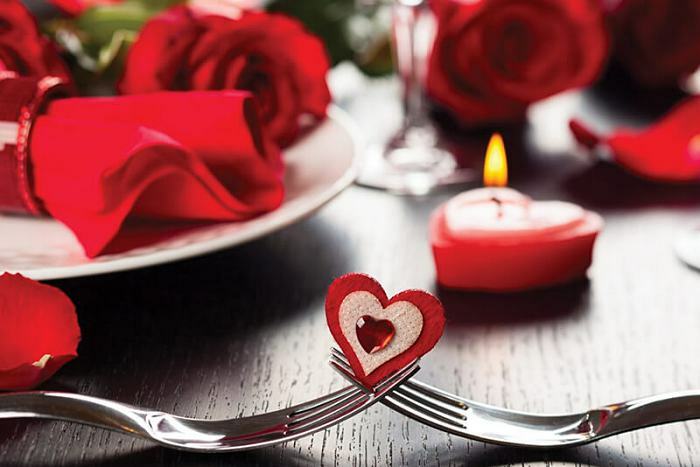 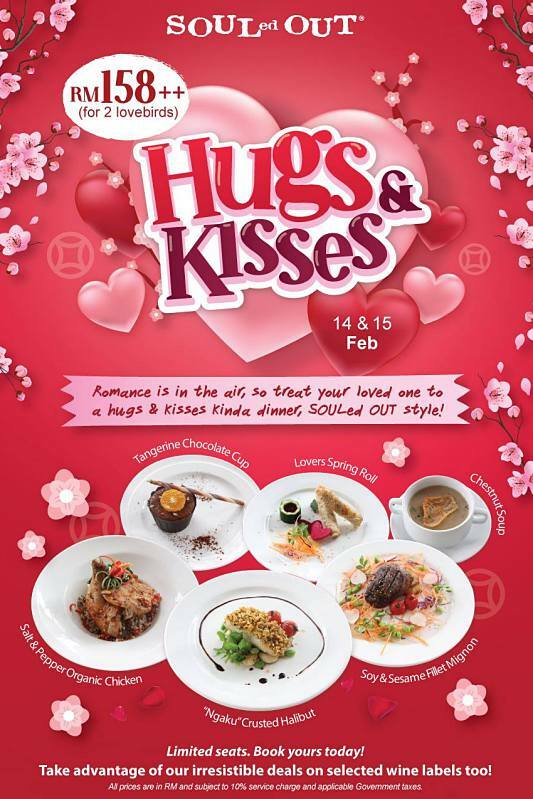 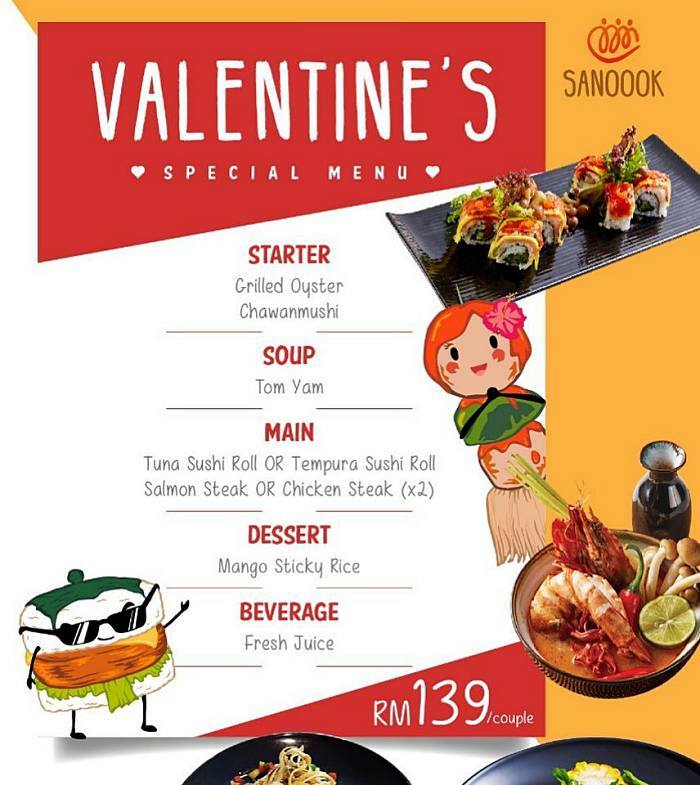 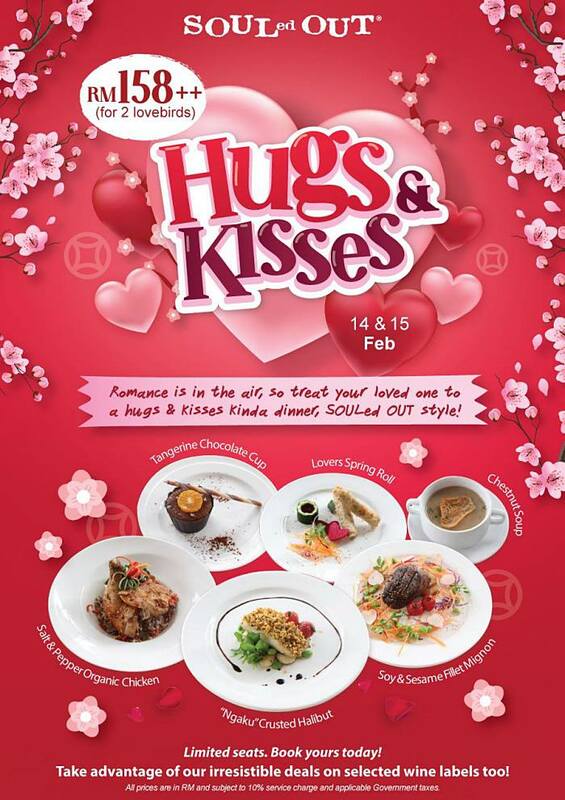 Highlight: Romance is in the air so treat your loved one to a dinner with specialties such as Salt & Pepper Organic Kitchen, Lovers Spring Roll, Soy & Sesame Fillet Mignon, Tangerine Chocolate Cup and others. 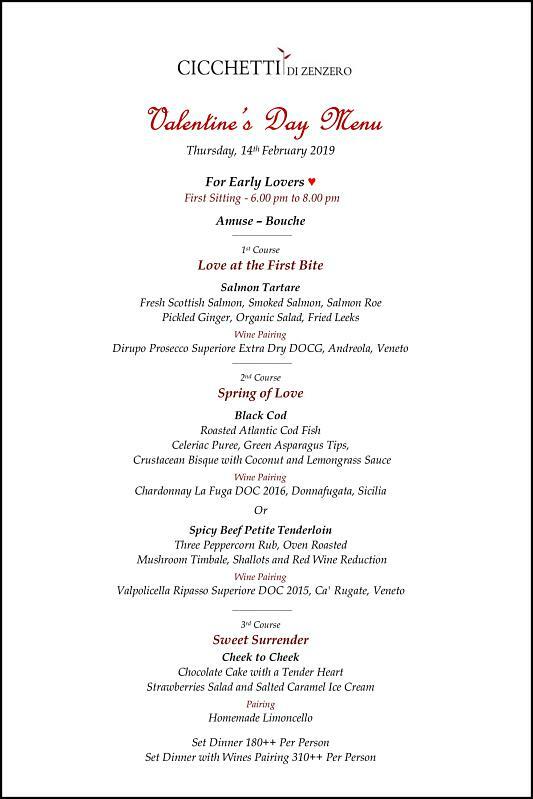 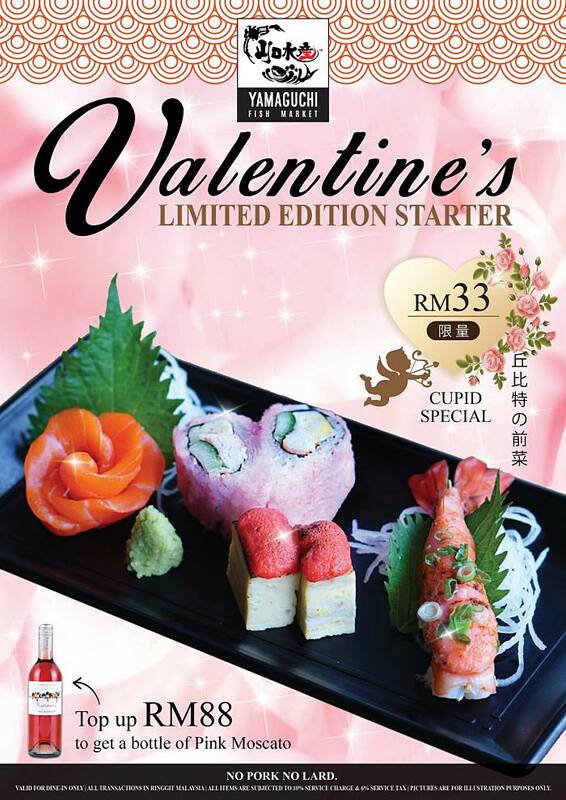 Highlight: A one-of-a-kind chance to relish this limited edition starter only on Valentine’s Day! 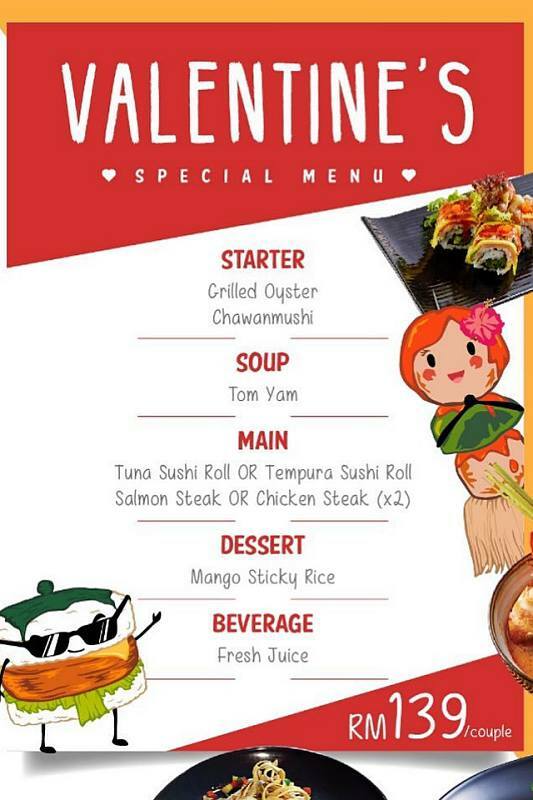 Savor Fresh Cut Salmon, Love-Shaped Maki, Spicy Mayo Tamago and Fresh Ebi of the freshest catches of the day. 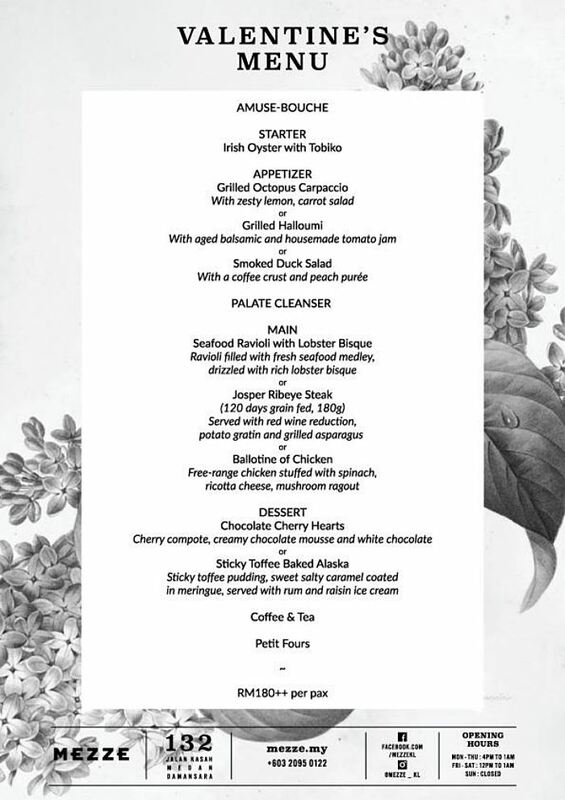 Highlight: Relish a 4-course menu featuring Fresh Sydney Rock Oysters, Lobster Bisque, Grilled French Sea Bass & more at this modern European restaurant. 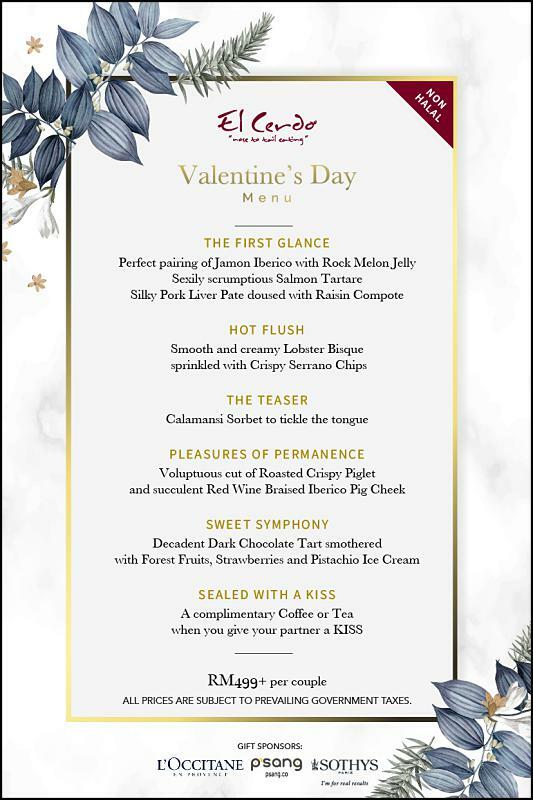 Complimentary roses and chocolate! 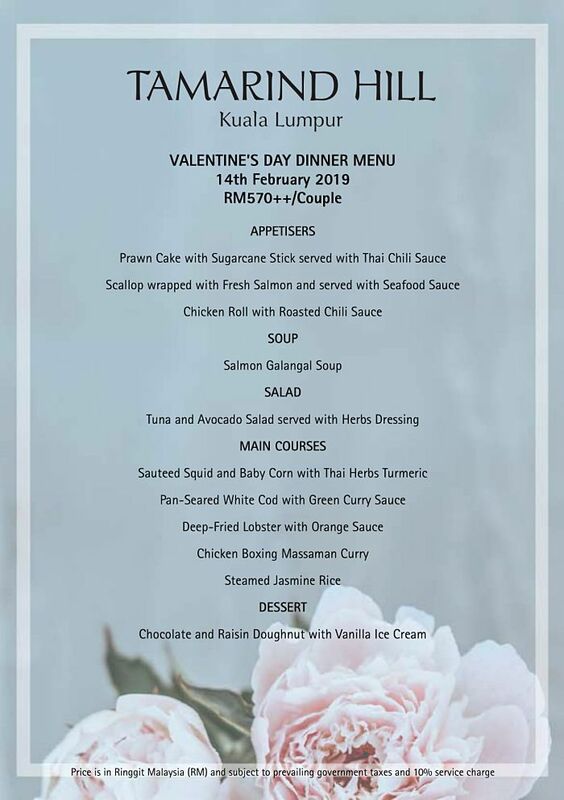 Price: From RM440 nett per couple. 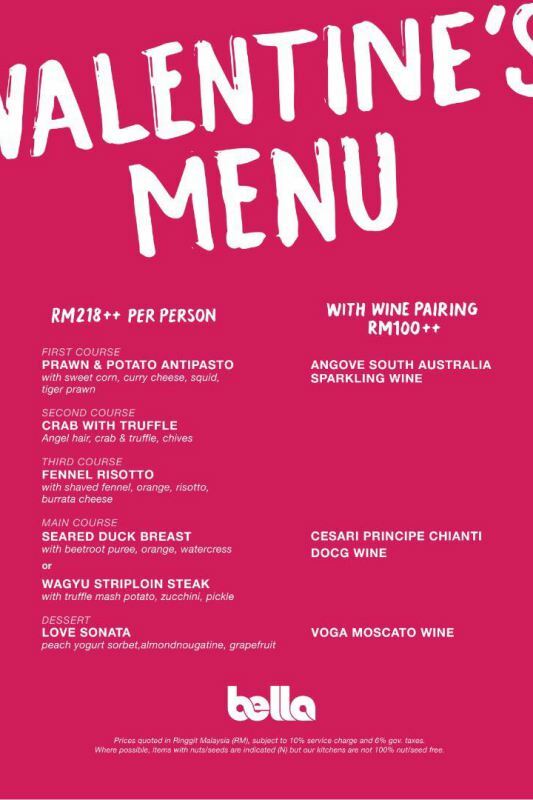 Highlight: Revel in a 5-course classic Italian dinner with Risotto all’Uva, Feletto di Tonno, Spaghetti alla Cicale di Mare, Homemade Limoncello while taking in the majestic culinary hub of Old Malaya. 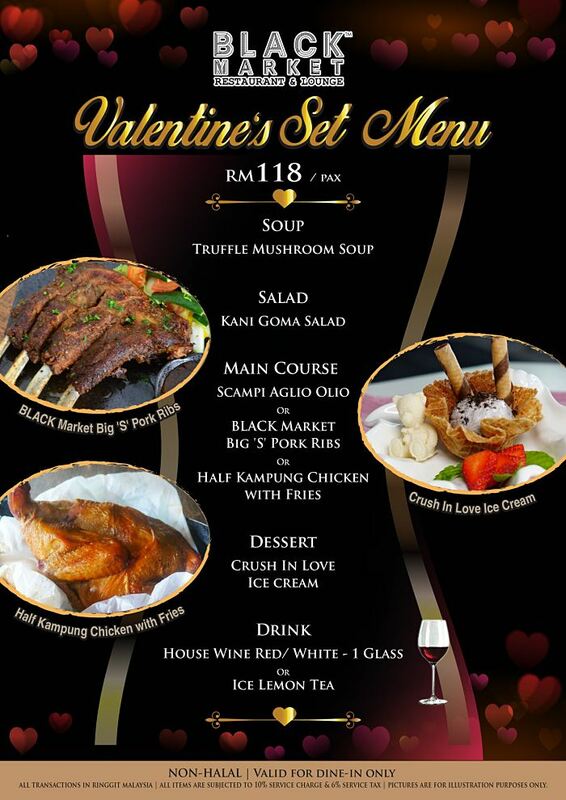 Price: From RM316++ per couple. 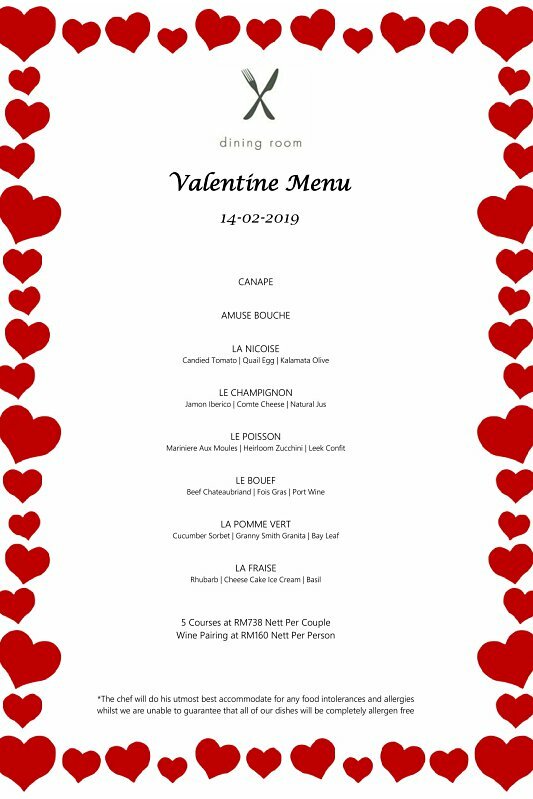 Highlight: Indulge your dearest in the “adaptive French” cuisine such as Avruga Caviar Cold Pasta, Panseared Cod, Handmade Strozzapreti Soft Egg Noodle, Lamb Loin and many great delicacies. 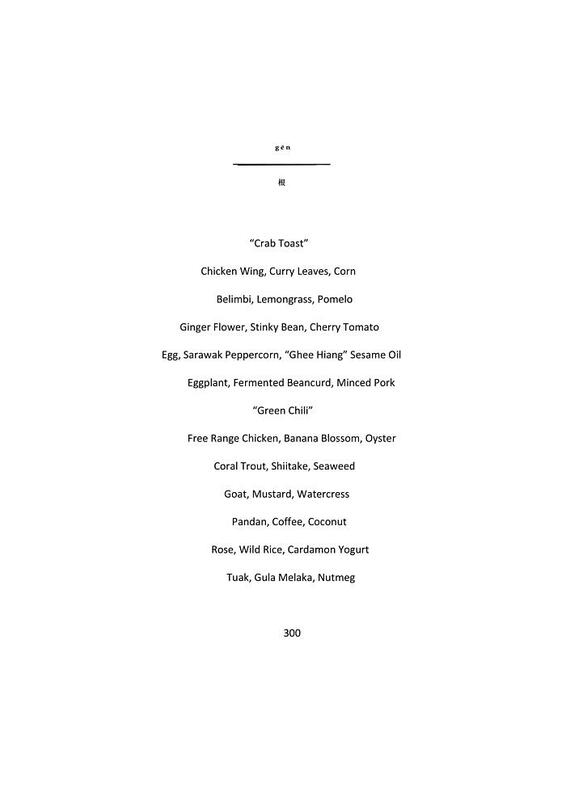 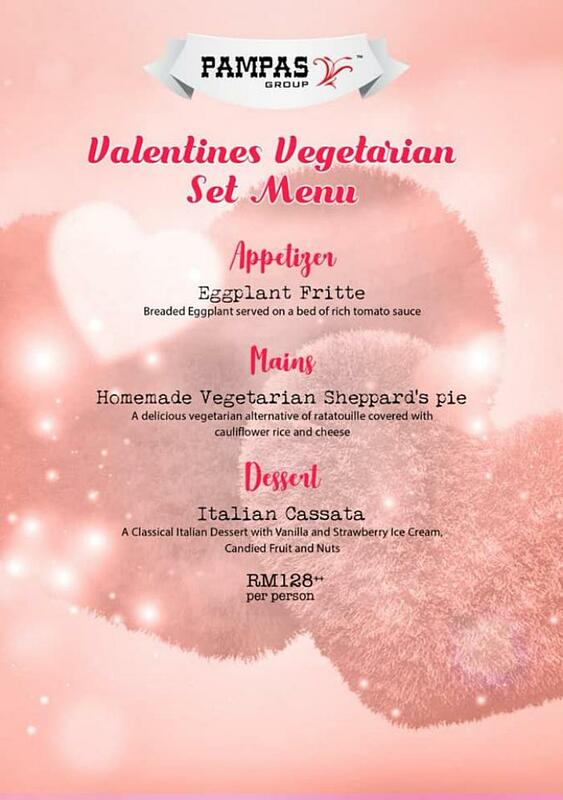 Vegetarian menu is available. 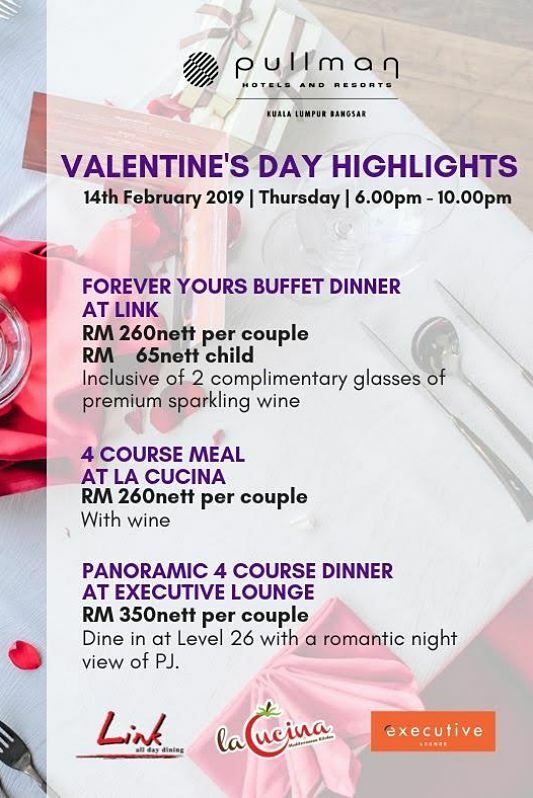 Highlight: Take in the breathtaking view while having Asian fusion delights with buffet of starters, desserts and one main including Grilled Lobster, Wagyu Ribeye and more. 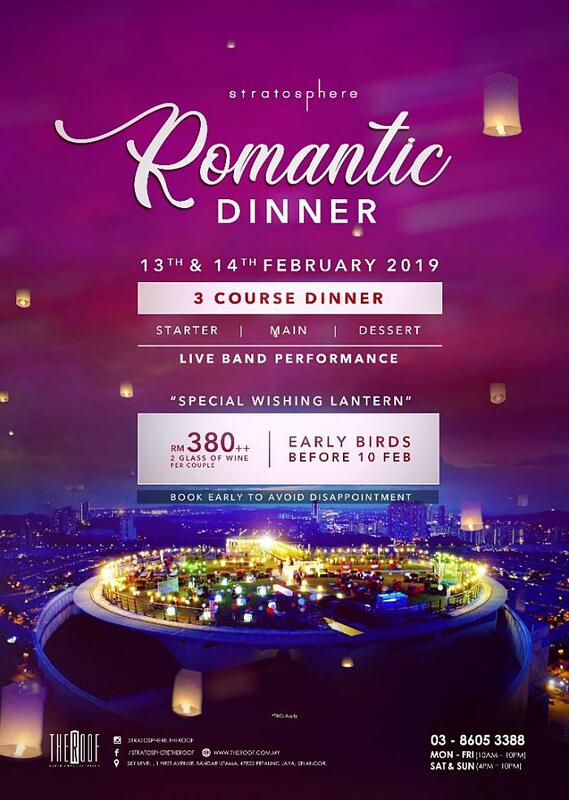 Highlight: Be surrounded by 360-degree panoramic view of Klang Valley and indulge in a 3-course set dinner with live band performance, special wishing lantern and 2 glasses of wine. 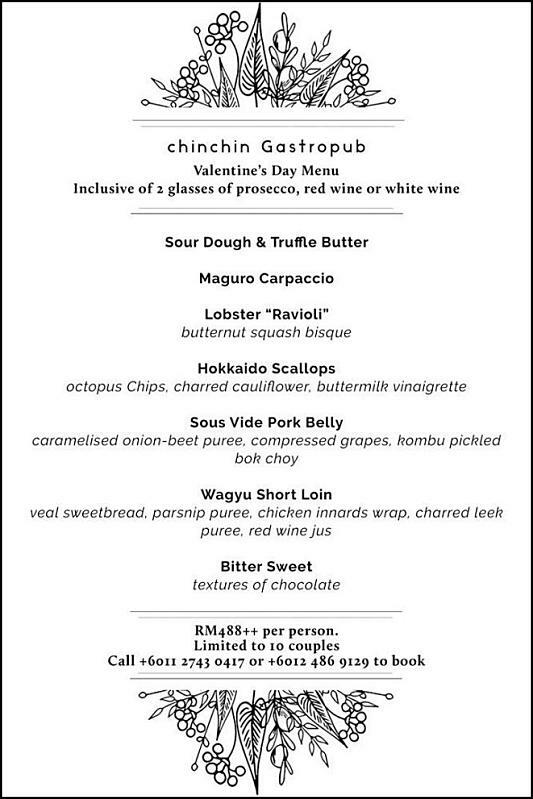 Highlight: Get delighted by sophisticated Italian delights such as Salmon Tartare, Black Cod, Spicy Beef Petite Tenderloin, Chocolate Cake in a modern and cozy atmosphere. 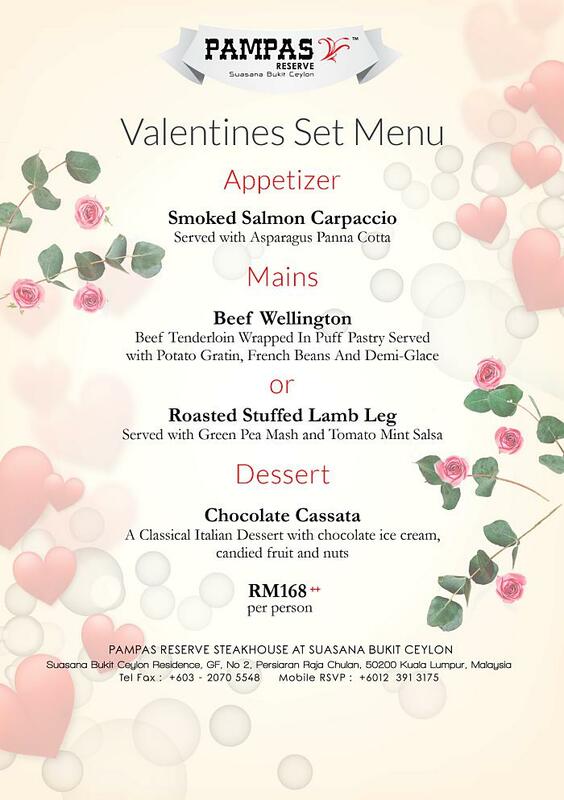 Price: From RM360++ per couple. 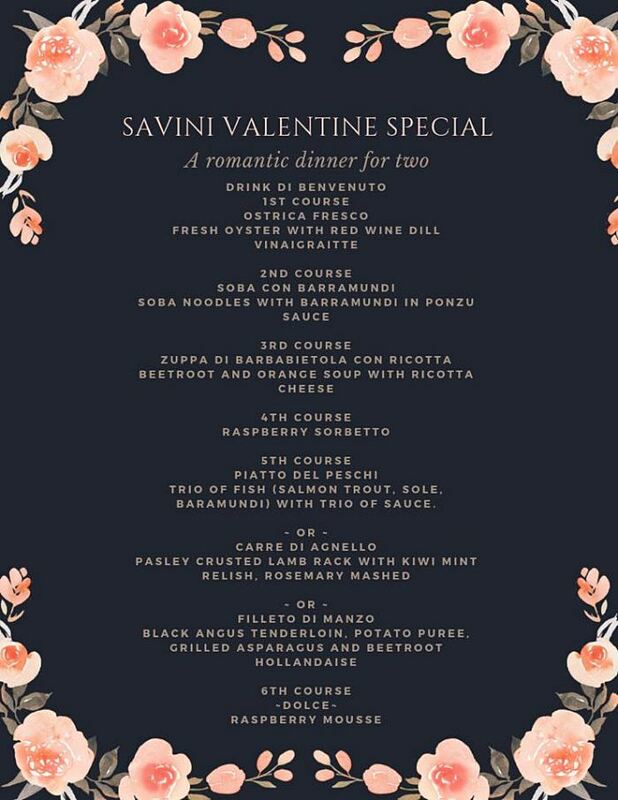 Highlight: Enjoy a romantic dinner and savor exquisite Italian dishes such as Fresh Scottish Salmon, Roasted Atlantic Cod Fish, Three Peppercorn Rub, Homemade Limoncello and many other delights. 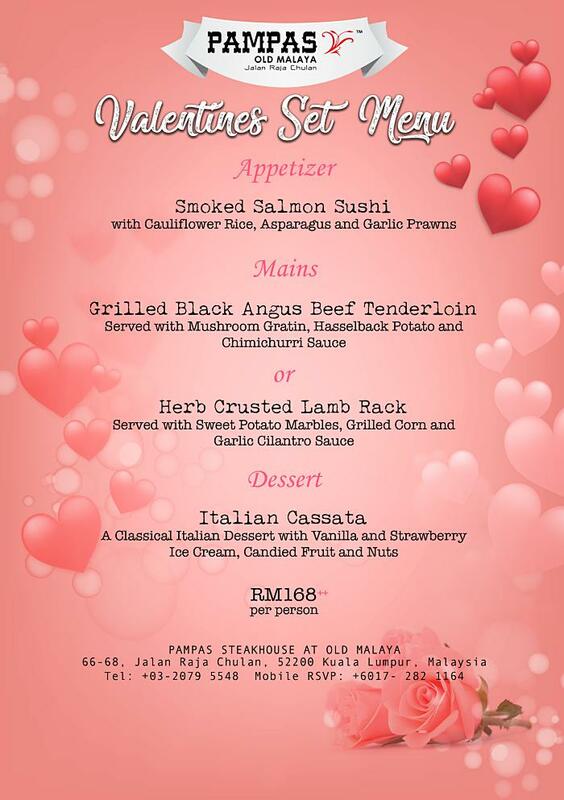 Highlight: Celebrate your Valentine’s Day at one of the most beautiful heritage buildings in KL and relish Smoked Salmon Sushi, Grilled Black Angus Beef Tenderloin, Lamb Rack, Italian Cassata and more! 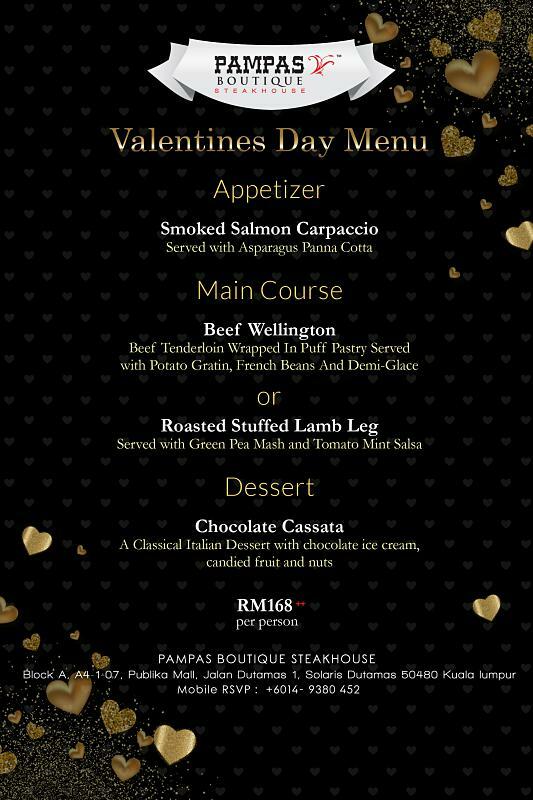 Highlight: Enjoy an intimate dining experience at one of the much-loved steakhouses in town with Smoked Salmon Carpaccio, Beef Wellington, Roasted Stuffed Lamb Leg, Chocolate Cassata and other delicaces. 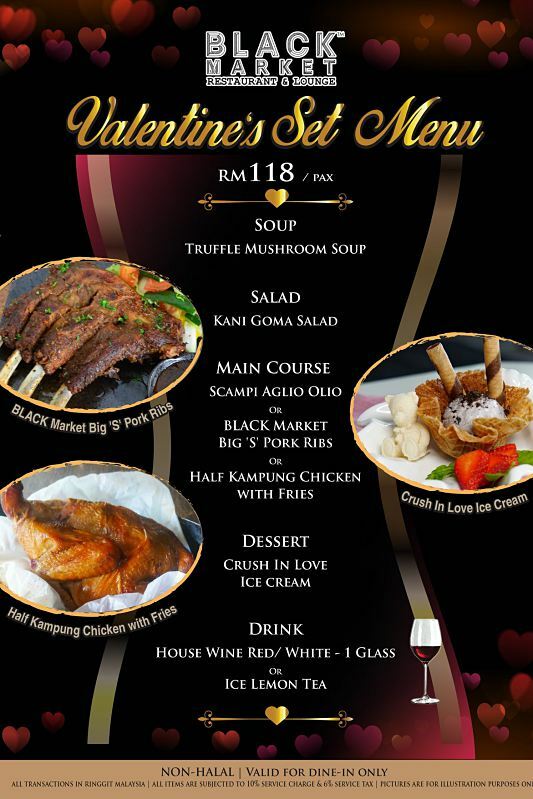 Price: From RM336++ per couple. 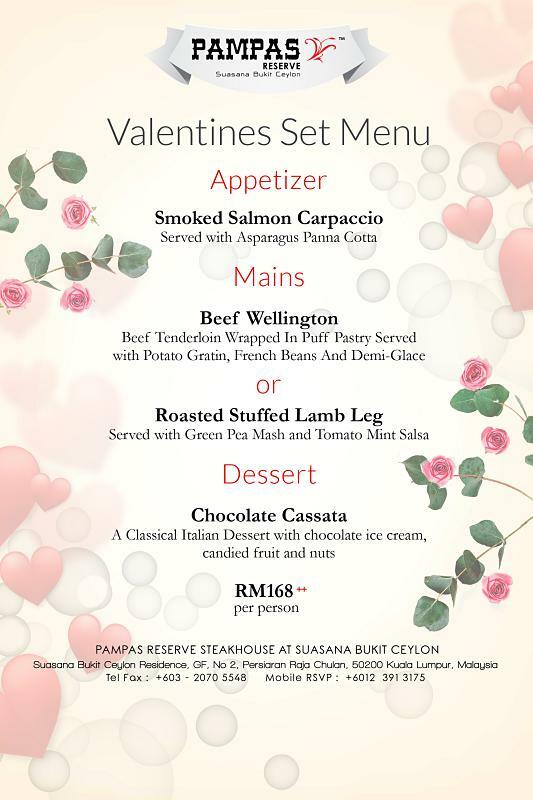 Highlight: Revel in seasonal ingredients with intense flavors that will surely excite the taste buds including Smoked Salmon Carpaccio, Beef Wellington, Chocolate Cassata and other delicacies. 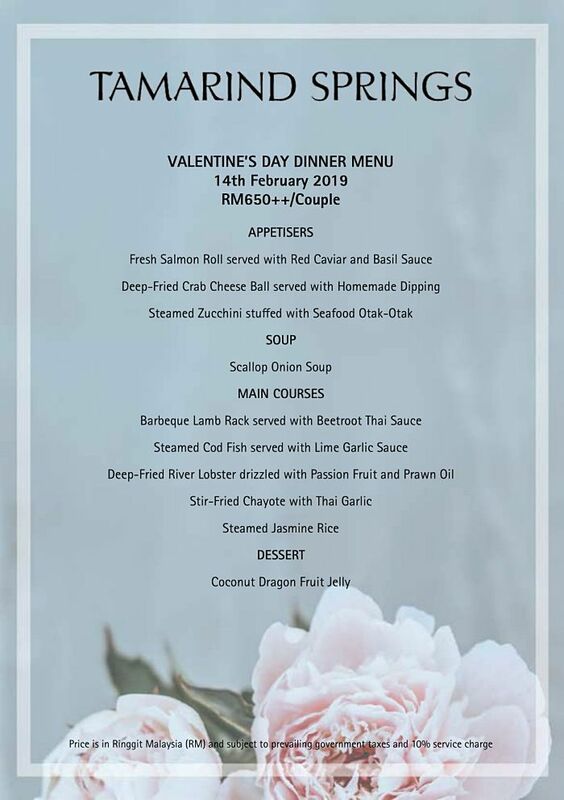 Highlight: Dine at the heritage building Old Malaya while being surrounded by a romantic atmosphere and good foods such as Oven Baked Salmon Fillet, Baked Jumbo Prawns and other delights. 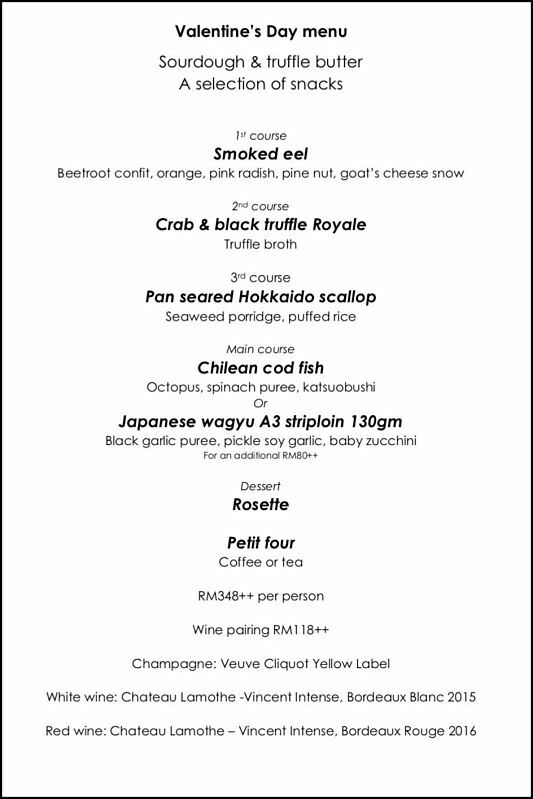 Highlight: Immerse in a familiar yet adventurous dinner with redefined South-East-Asian dishes like Smoked Mulard Duck, Crab & Salsify Salad, Aged Hiramasa Kingfish Crudo and more. 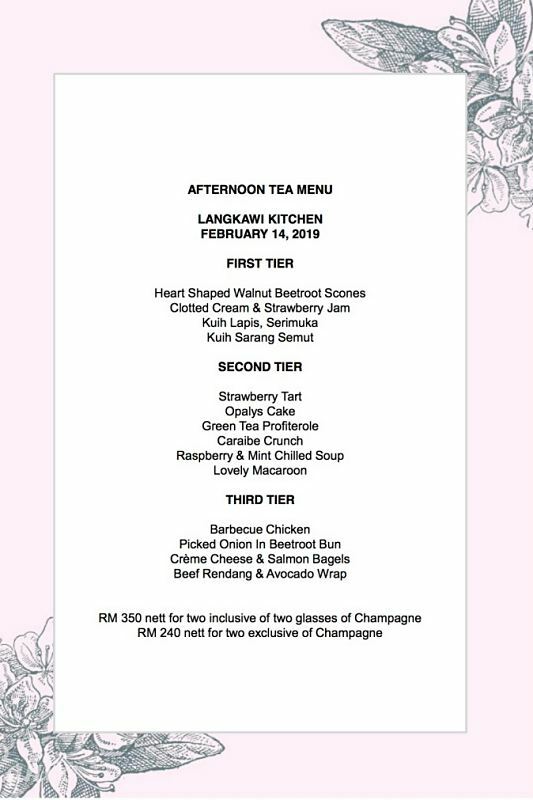 Price: From RM400 per couple. 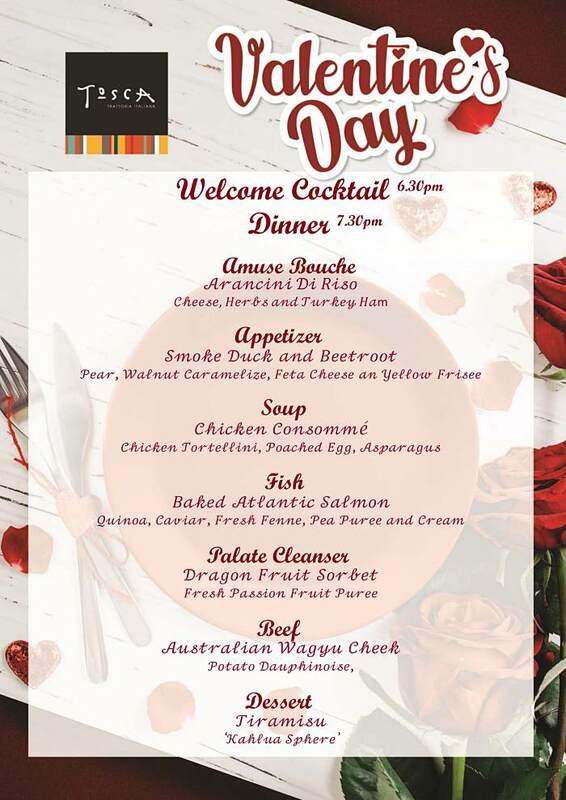 Highlight: Relish your Valentine’s dinner to its best at this European bistro nestled in a lush, tropical garden setting. 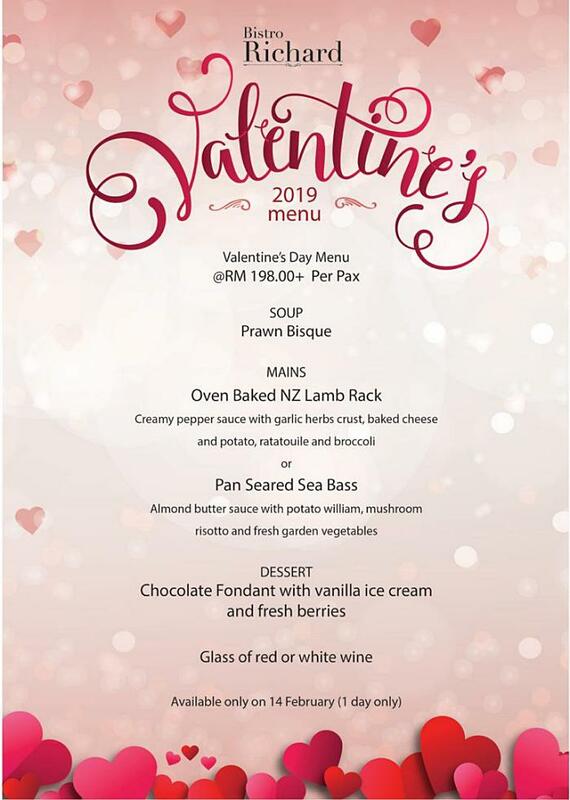 Savor Oven Baked New Zealand Lamb Rack or Pan Seared Sea Bass and other delicacies. 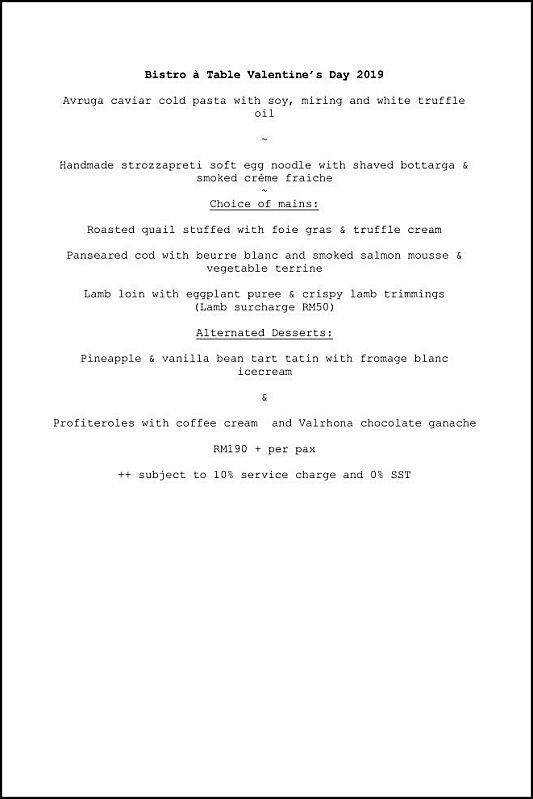 Highlight: Delve into a dinner at this French classic bistro with delicacies like Scottish Salmon, Lobster & Saffron Bisque, Pan Roasted Wild Cod Fish, Aged Wagyu Striploin and many more. Highlight: Enjoy an ultimate dining experience with a farm to fork menu featuring Rock Lobster, Crusted Rack of Lamb, Slipper Lobster Tortellini, Mango Panna Cotta and other delights. 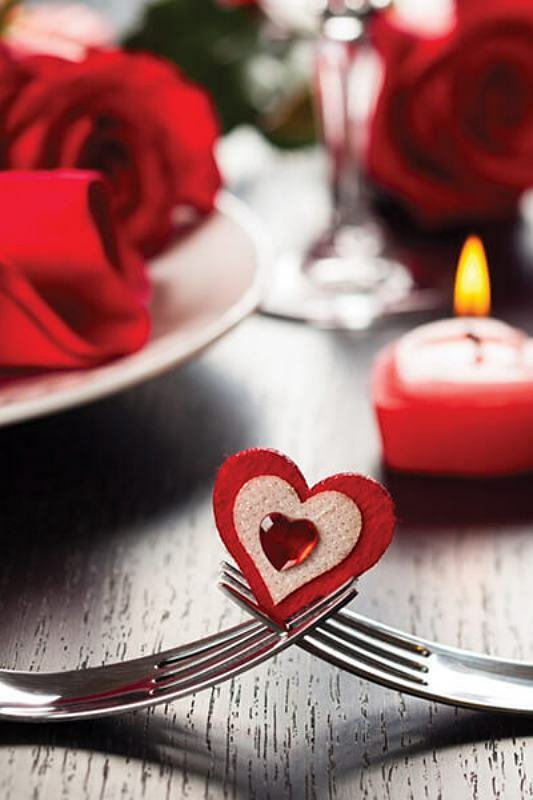 Highlight: Indulge your dearest in a night to remember surrounded by an old Shanghai ambiance. 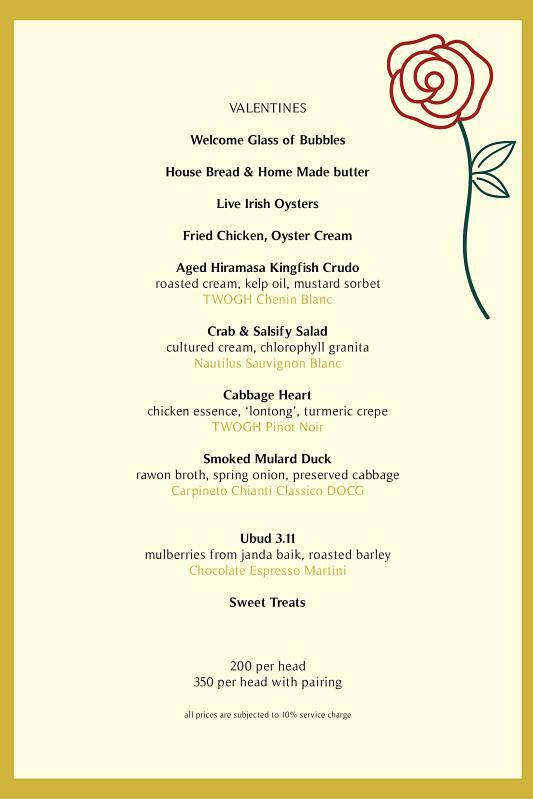 Savor Soya Ginger Glazed Scallops, Steamed Halibut, Lychee and Wild Berries Panna Cotta and more delights. 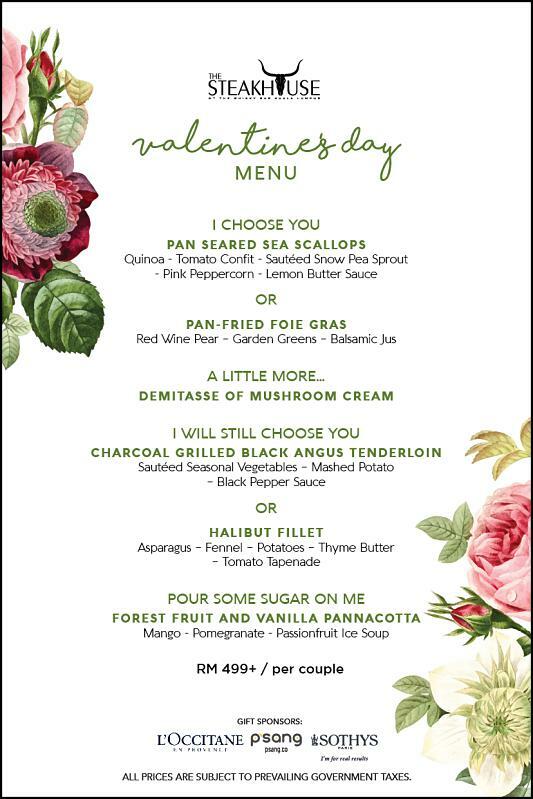 Highlight: Have a lasting memory with your Valentine with a menu that pays homage to Malay & Chinese cultural marriage featuring Budu Belachan Caviar, Prime Australian Angus Beef and more. 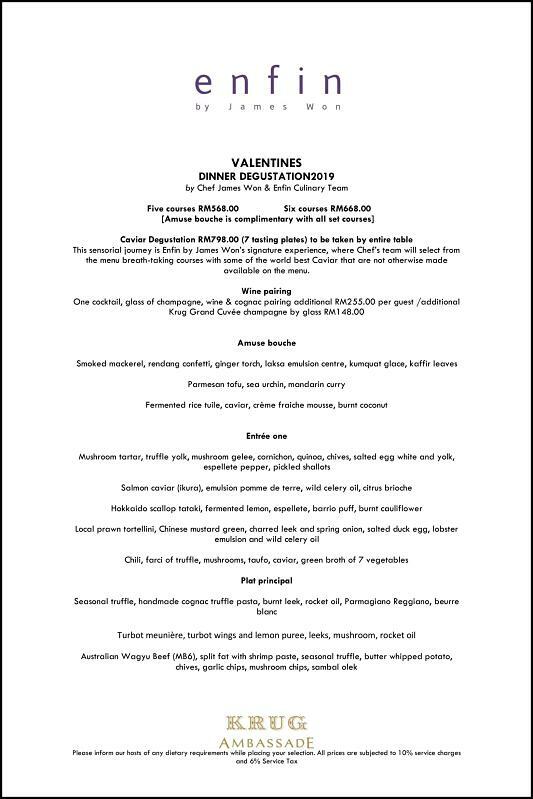 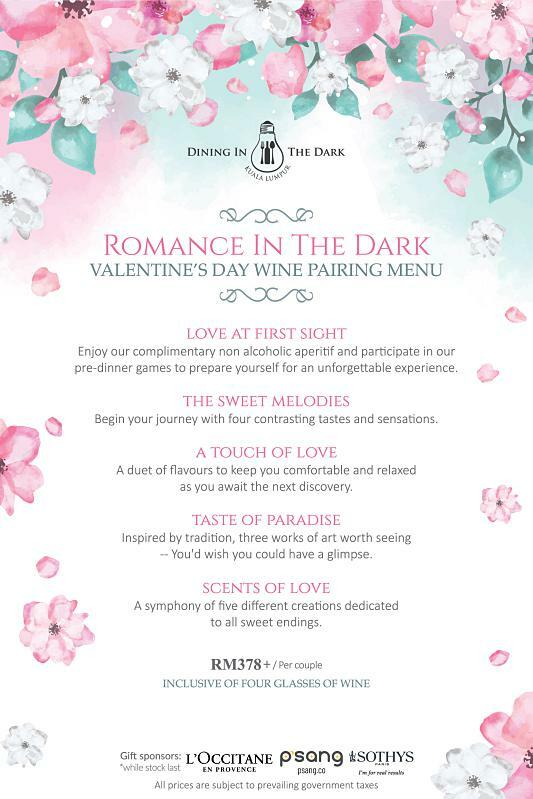 Highlight: Treat your dearest to a night to remember as both of you will be showered by a sensory experience in the dark of a gastronomic journey to excite your taste buds and fill your heart with love. 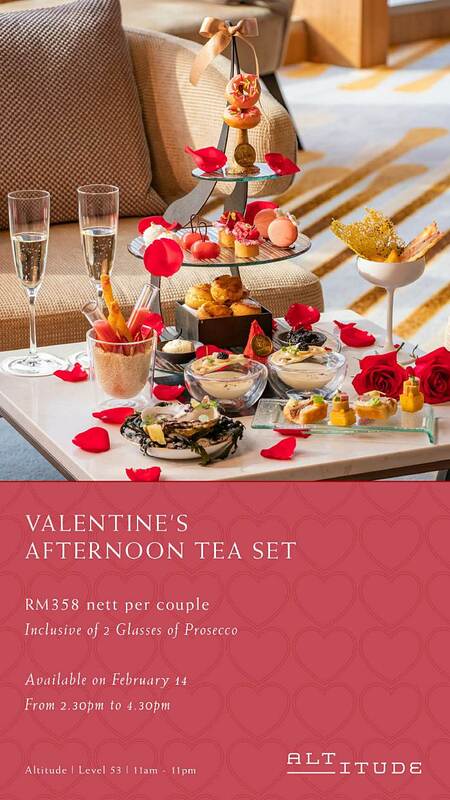 Highlight: An extraordinary afternoon with the sweetest delights for couples! 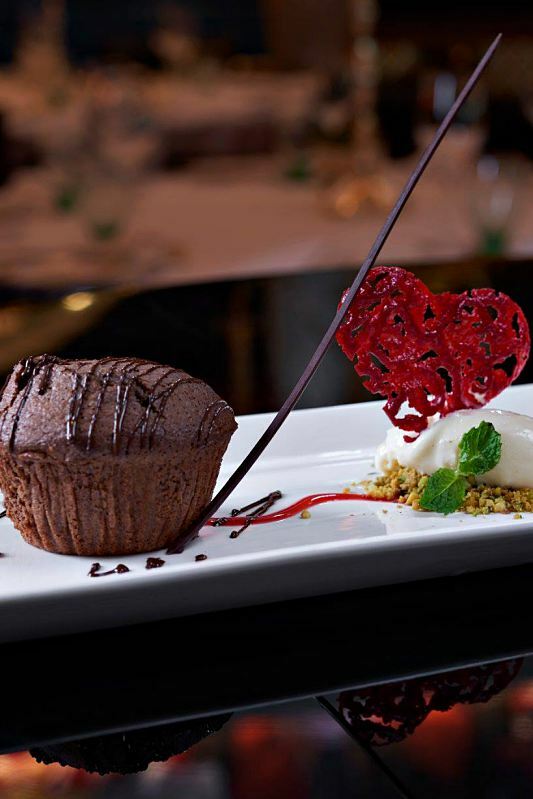 Dining on the 53rd floor to take in the beautiful of the city while reveling in a number of meticulously hand-picked delicacies. 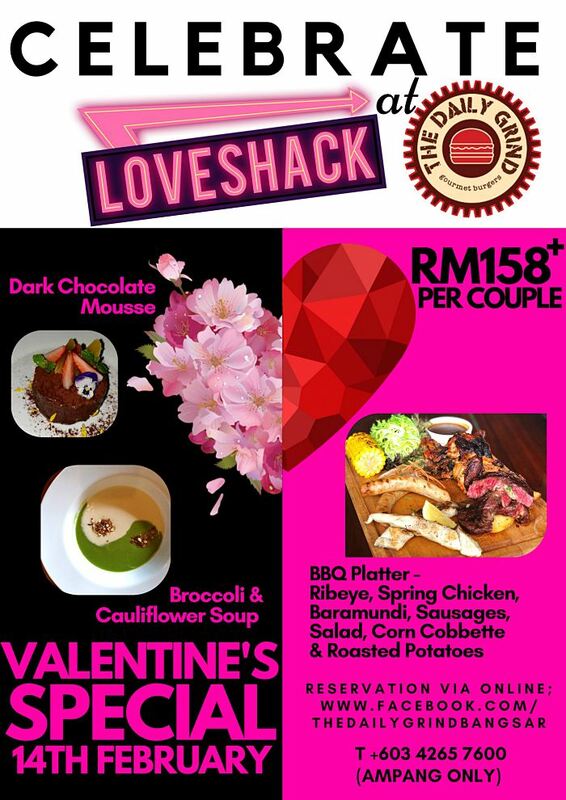 Price: RM358 nett per couple. 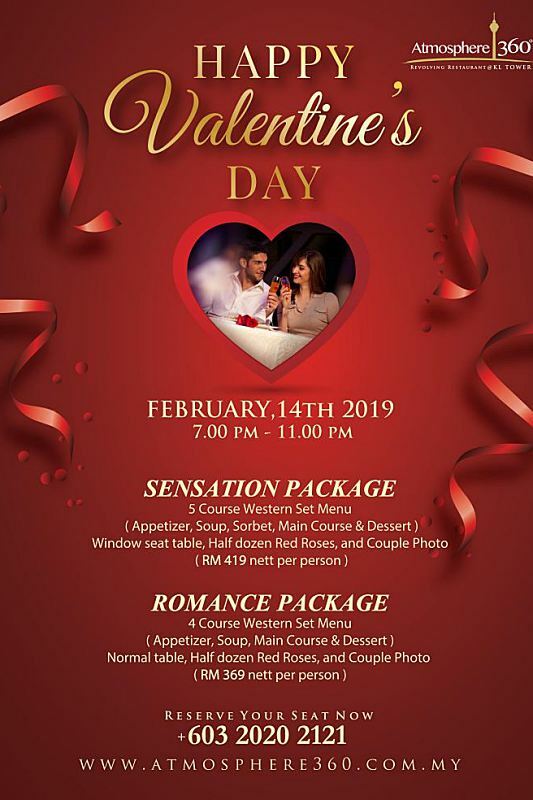 Highlight: Delight your taste buds and indulge your loved one in a 6-course set dinner of delectable delights featuring a fusion of Japanese flavors and cultures in an intimate and cozy setting. 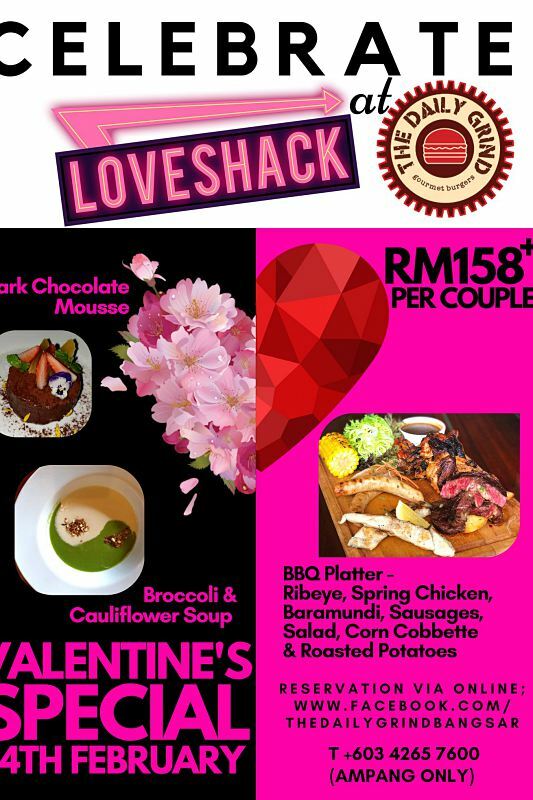 Price: RM420 nett per couple. 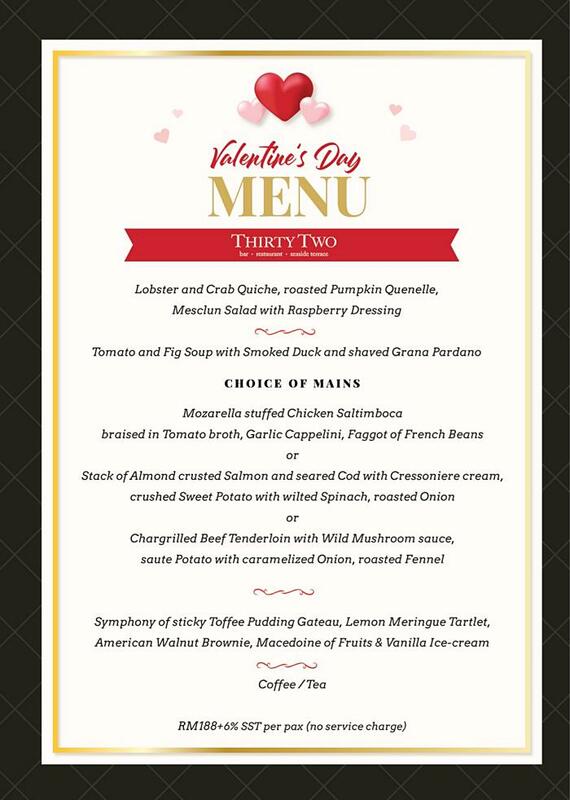 Highlight: Together with your loved one revel in a special night for 2 at this first-of-its-kind French bistro serving great delights such as Air-Dried Duck, Avruga Caviar, Grilled Australian Beef Tenderloin and more. 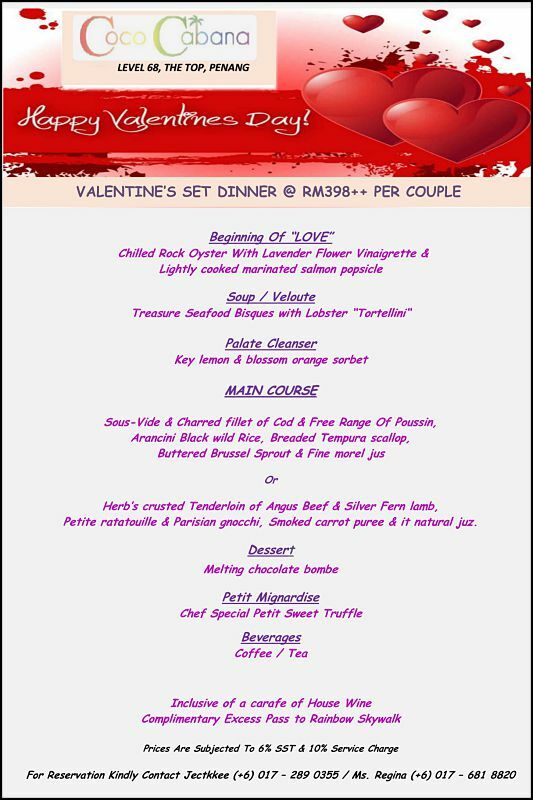 Price: RM345.68 nett per couple. 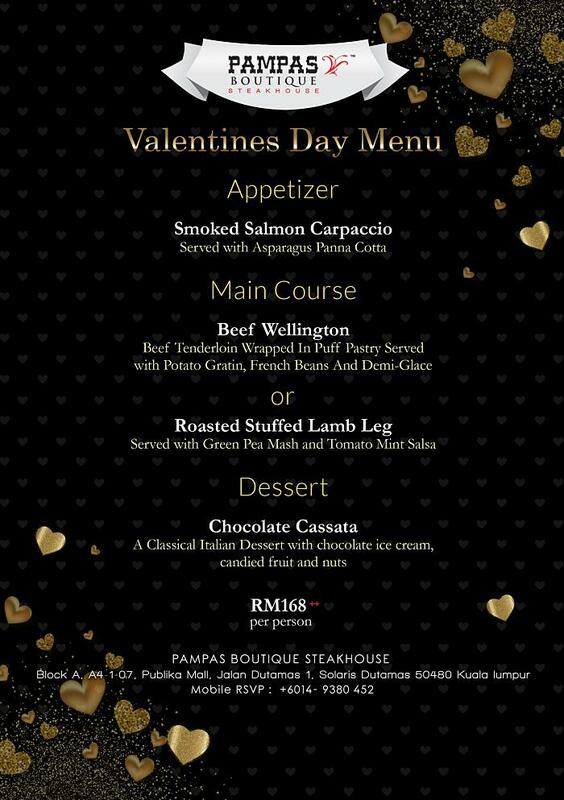 Highlight: Indulge your loved one in the sumptuous 4-course Italian dinner such as Smoked Salmon Cheese Cake, Spanish Cappellacci, Braised Beef Cheeks with Baby Lobster Risotto and many great delicacies. 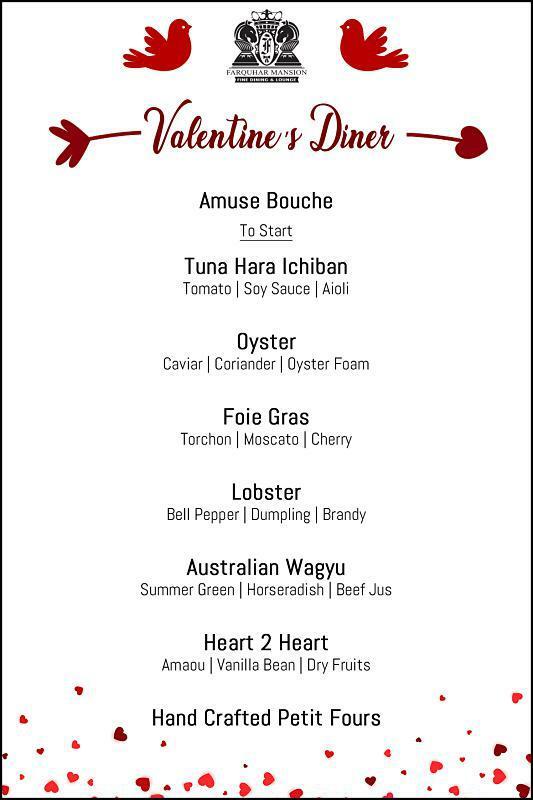 Highlight: Spark romance with a night to remember at this steakhouse by savoring Smoked Eel, Crab & Black Truffle Royale, Pan Seared Hokkaido Scallop, Chilean Cod Fish and other dishes. 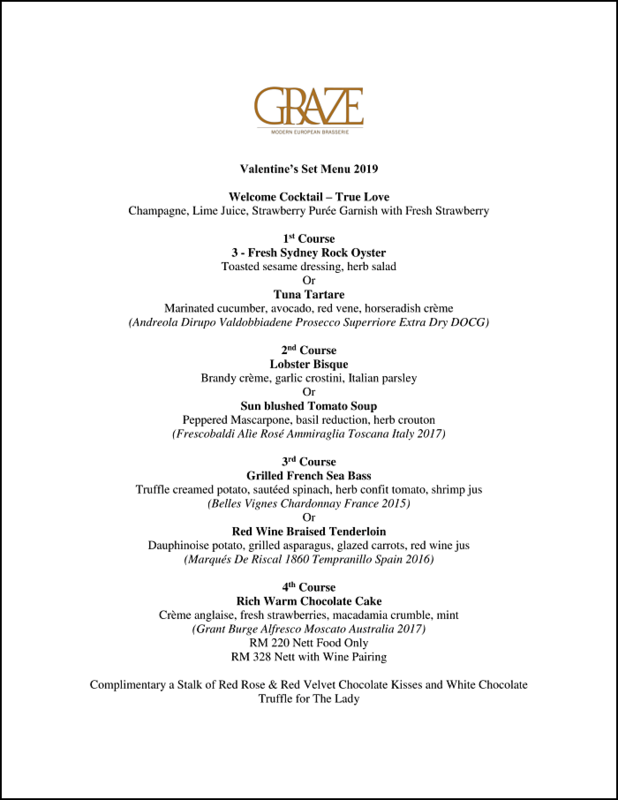 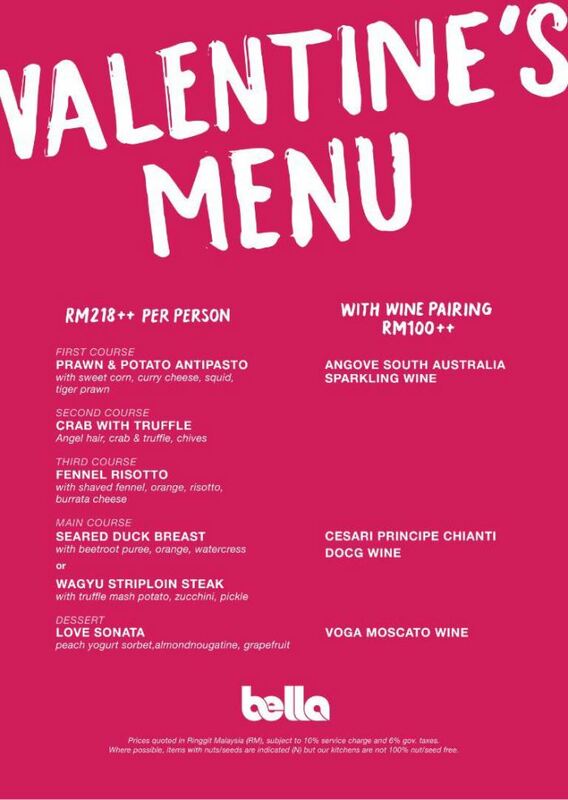 Highlight: Get gratified this Valentine’s by enjoying delectable Italian dishes such as Prawn & Potato Antipasto, Crab with Truffle, Love Sonata, Seared Duck Breast, Wagyu Striploin Steak and more! 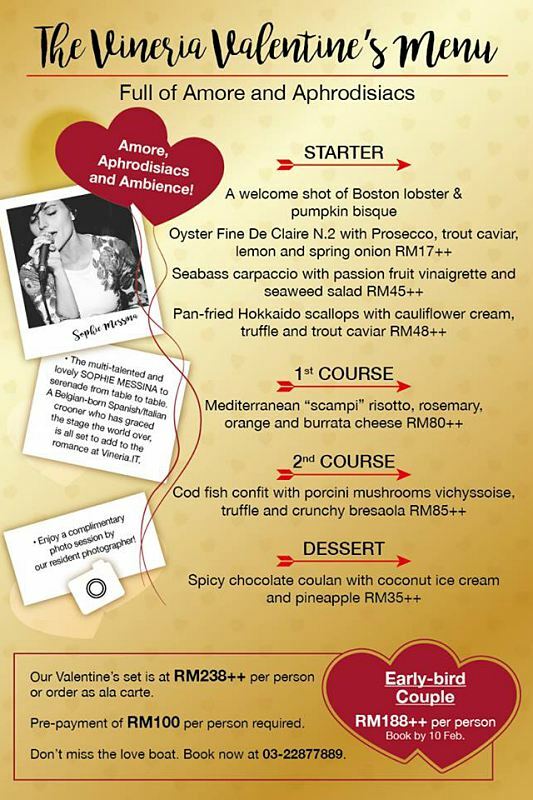 Highlight: Ready for a night full of amore, aphrodisiacs and ambience! 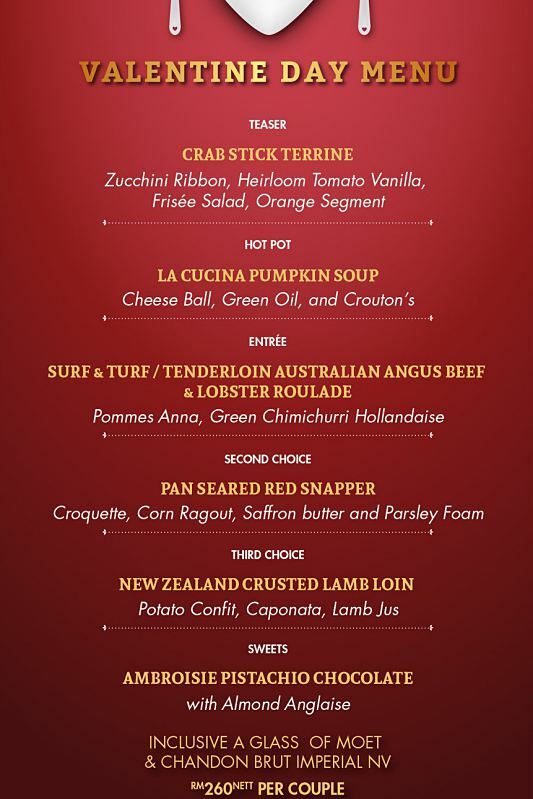 Enjoy music, get complimentary photo and savor delights like Boston Lobster Pumpkin Bisque, Pan-Fried Hokkaido Scallop and more. 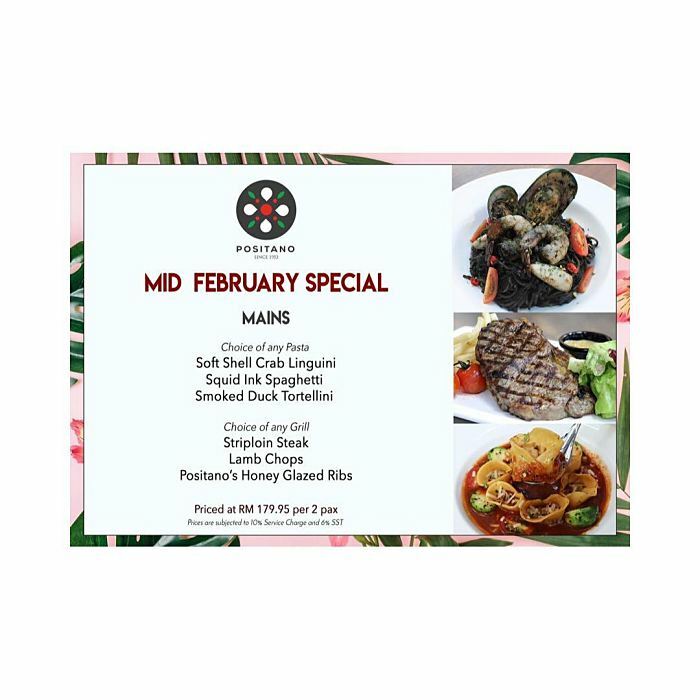 Highlight: Have a night to remember at this much-loved restaurant savoring delights such as Irish Oyster, Grilled Octopus, Seafood Ravioli, Josper Ribeye Steak, Sticky Toffee Baked Alaska and other specialties. 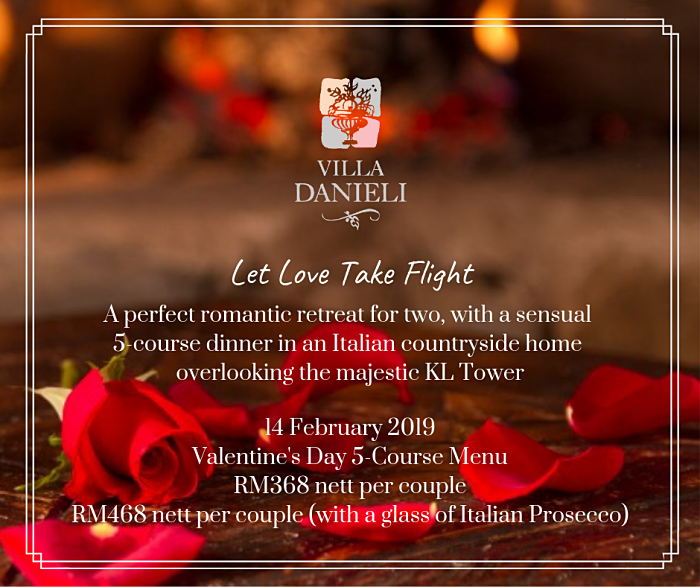 Highlight: A perfect romantic retreat is awaiting to please your palate and warm your heart and soul with a sensual 5-course set menu in an Italian countryside home setting overlooking the majestic KL tower. 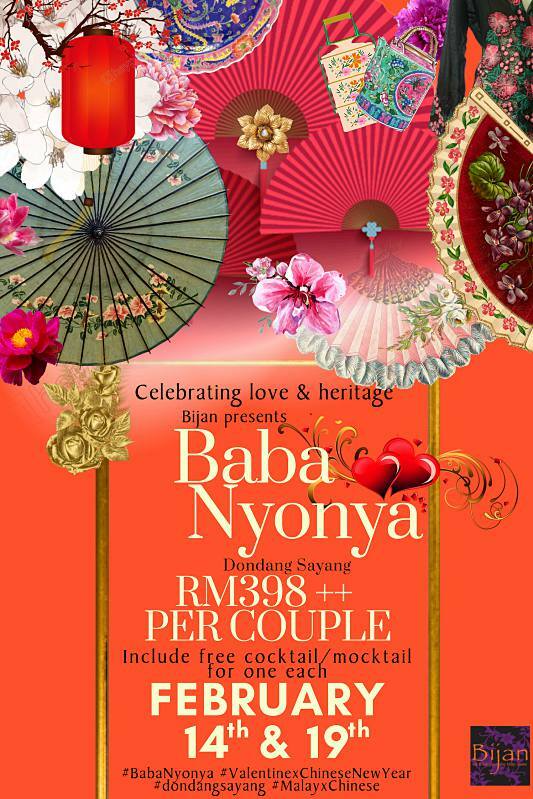 Price: From RM368 nett per couple. 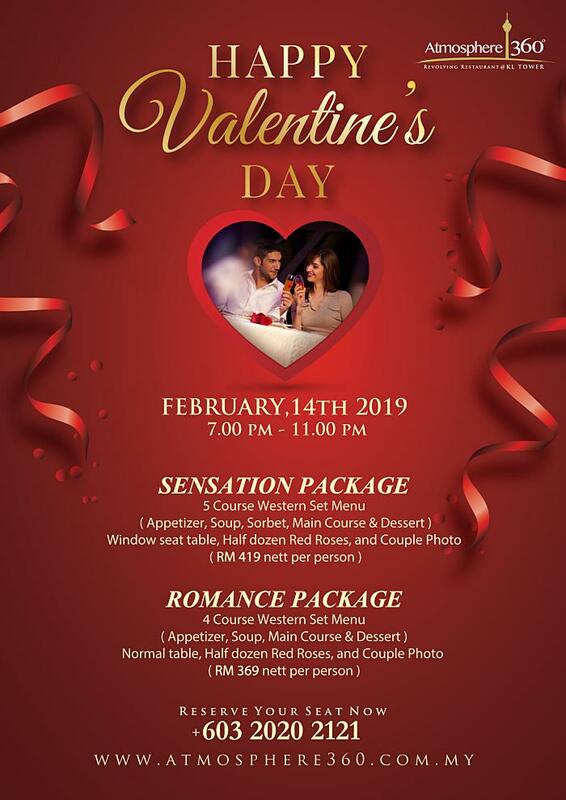 Highlight: Have a hearty dinner of 4-course Western Set menu with half dozen red roses, complimentary couple photo while reveling in the breathtaking view of the majestic Kuala Lumpur by night. 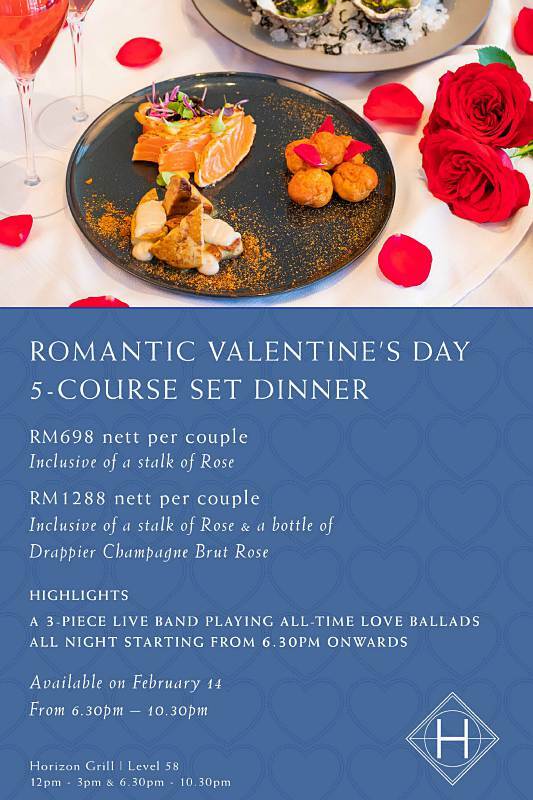 Price: From RM369 nett per couple. 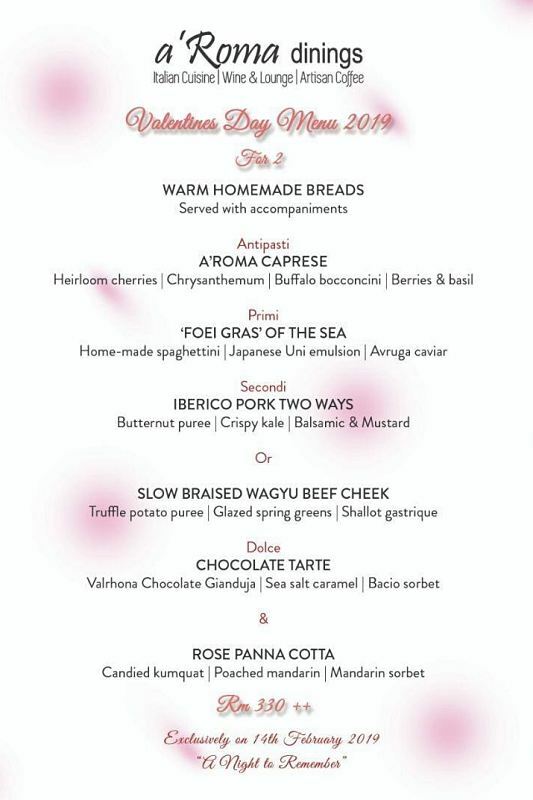 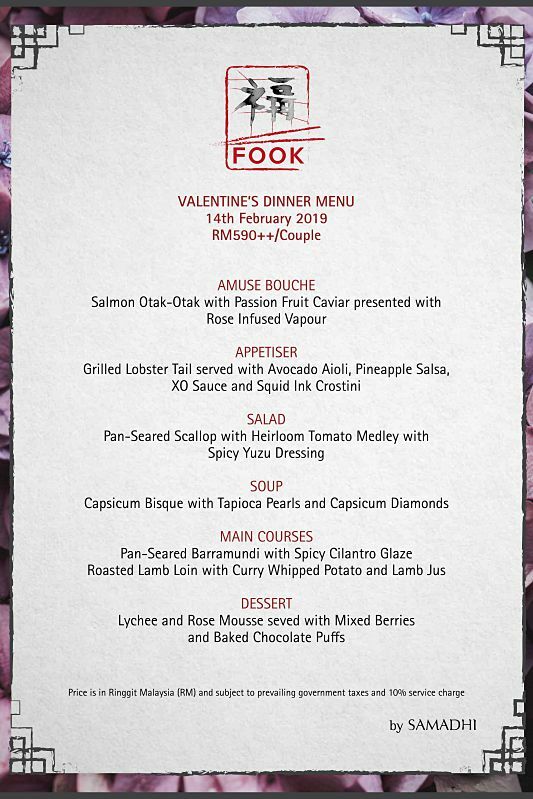 Highlight: Treat your other half to a romantic dinner featuring premium Italian cuisine including ‘Foie Gras’ Of The Sea, Iberico Pork Two Ways, Slow Braised Wagyu Beef Cheek, Chocolate Tarte and Rose Panna Cotta. 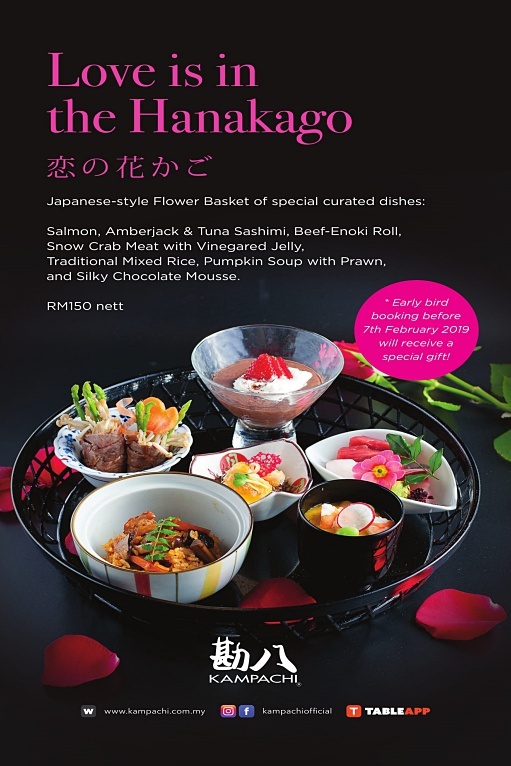 Highlight: Pamper your loved one to a sumptuous Japanese dining experience with dishes like Premium Sashimi, Sliced Wagyu Hala Beef, Negi Toro and Hokkaido Uni with Sushi Rice, Black Truffle and so on. 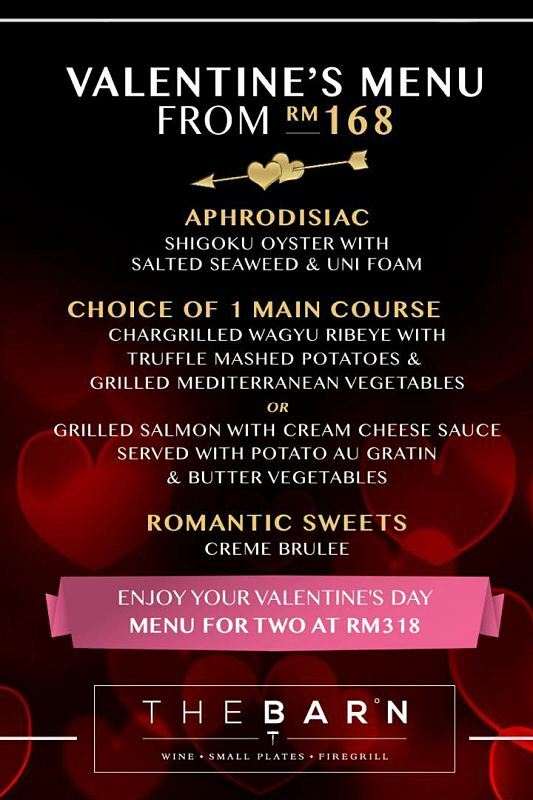 Highlight: Warm your heart and soul with exquisite Western cuisine featuring Shigoku Oyster, Chargrilled Wagyu Ribeye with Truffle Mashed Potato or Grilled Salmon Served With Potato Au Gratin and Creme Brulee. 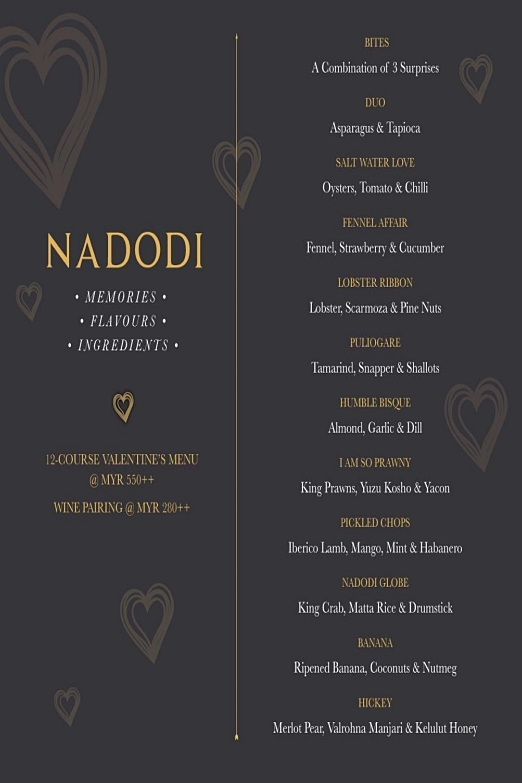 Highlight: Make memories that last with a 7-course dinner specially curated including Braised Abalone, Roasted Crispy Pigeon, Baked Boston Lobster in a nostalgic ambiance that resembles Shanghai. 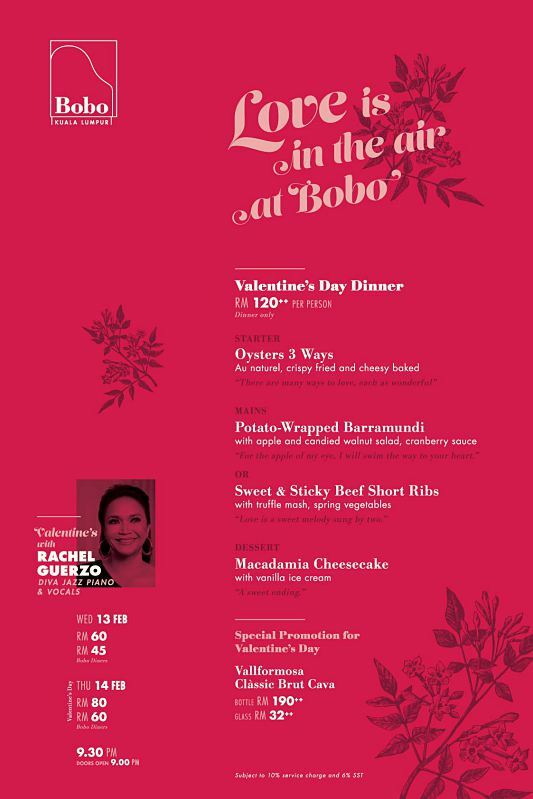 Highlight: A tantalizing dinner is awaiting with home-cooked pork dishes like Roasted Crispy Piglet, Jamon Iberico or Seafood like Lobster Bisque, Dark Chocolate Tart, Calamari Sorbet and more. 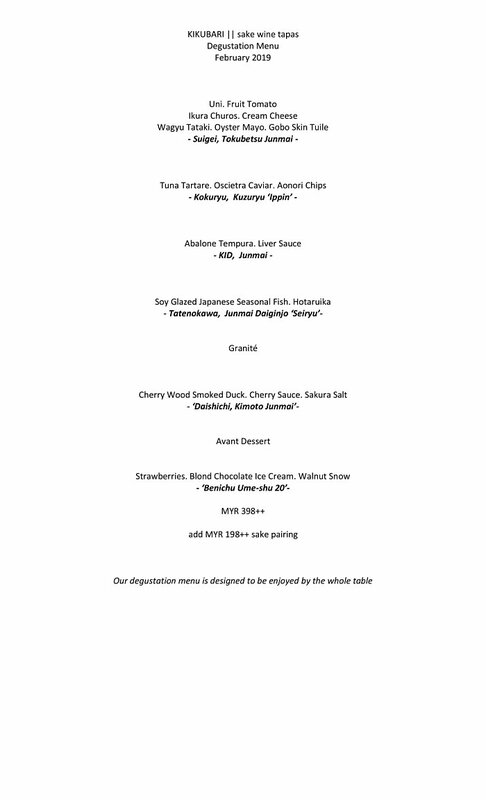 Highlight: Revel in a journey of all the senses with creative flair using modern techniques. 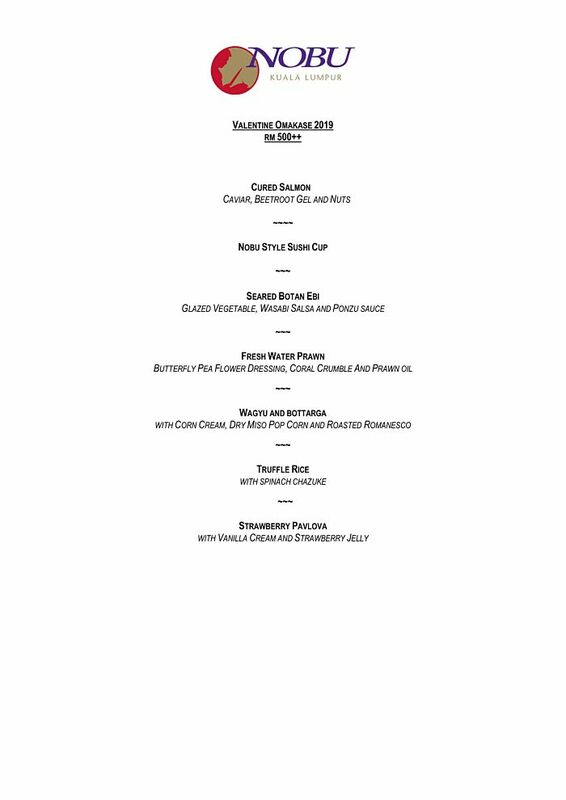 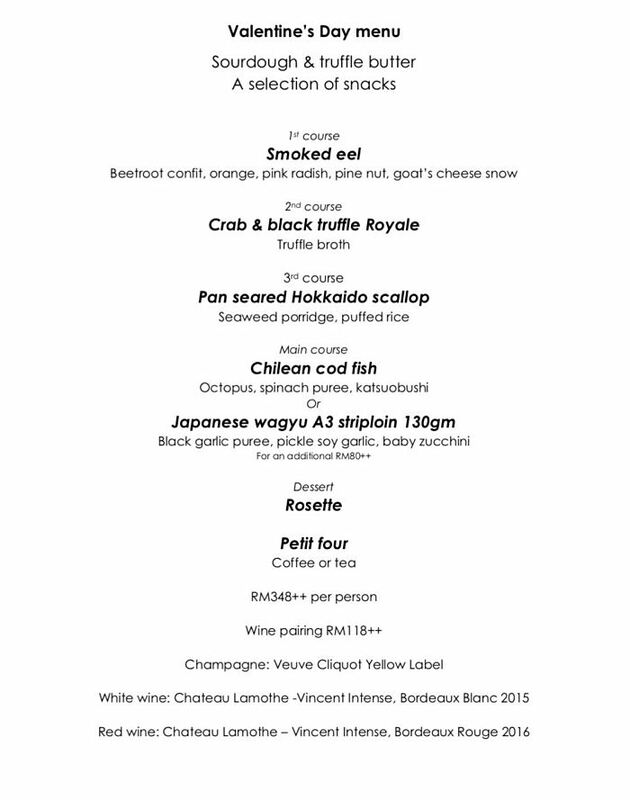 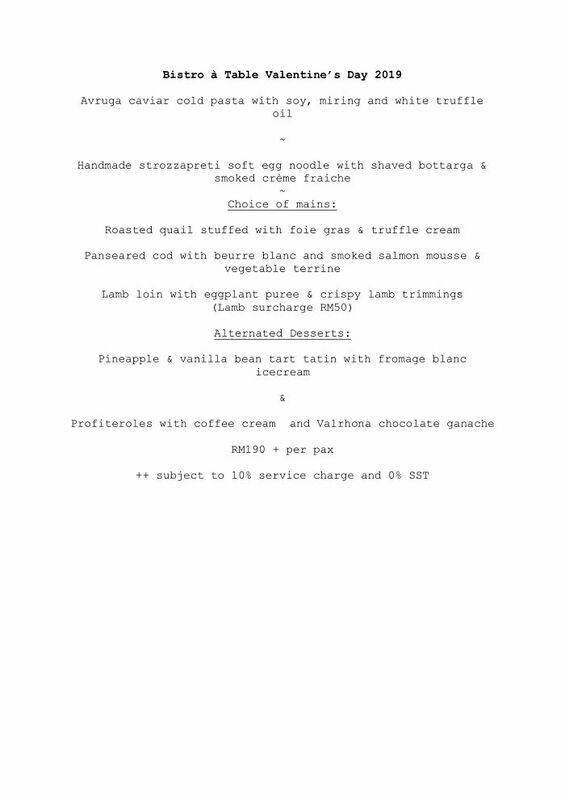 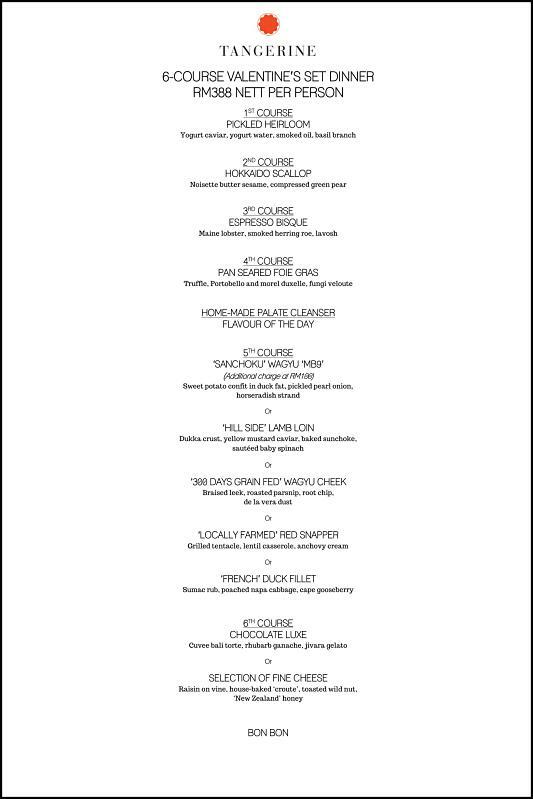 Get ready to savor Lobster Tagliatelle, Charred Snapper, Local King Prawn, Jaffina Crab Curry, Iberico Lamb and more. 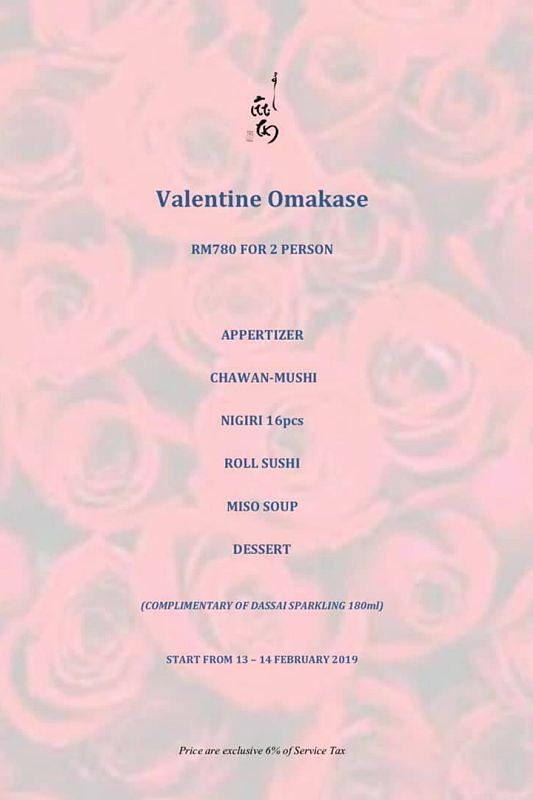 Highlight: Treat your other half to top-notch service and special Omakase curated by the head chefs here with delights like Cured Salmon, Seared Botan Ebi, Fresh Water Prawn, Truffle Rice and many others. 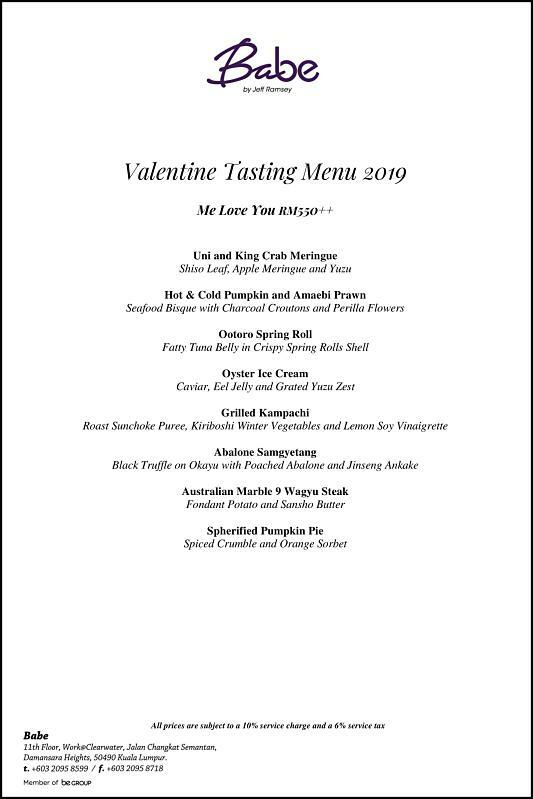 Highlight: Indulge in an authentic and sophisticated European fine dining with Black Truffle Emulsion, Seared Hokkaido Scallops, Slow Cooked New South Wales Lamb Rack and other great delights. 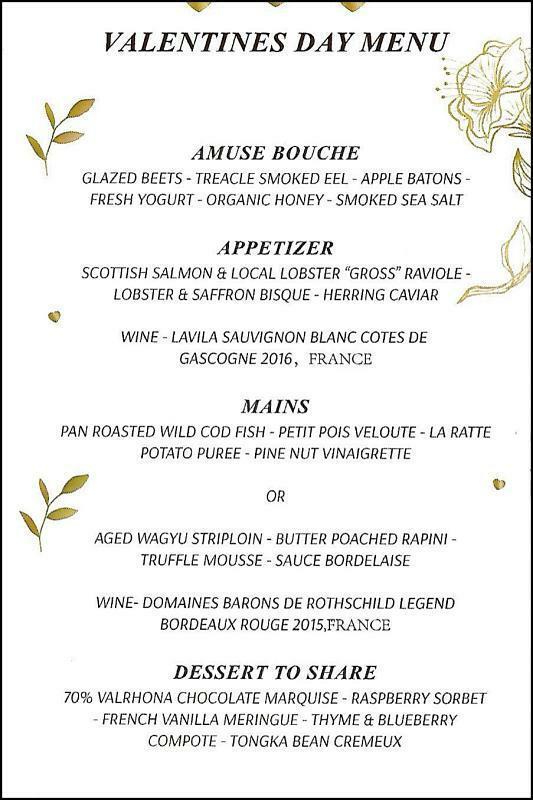 Highlight: Get delighted by contemporary French cuisine featuring Caviar Degustation, Fermented Rice Tuille, Mushroom Tartar, Seasonal Truffle, Australian Wagyu Beef and many delicacies. 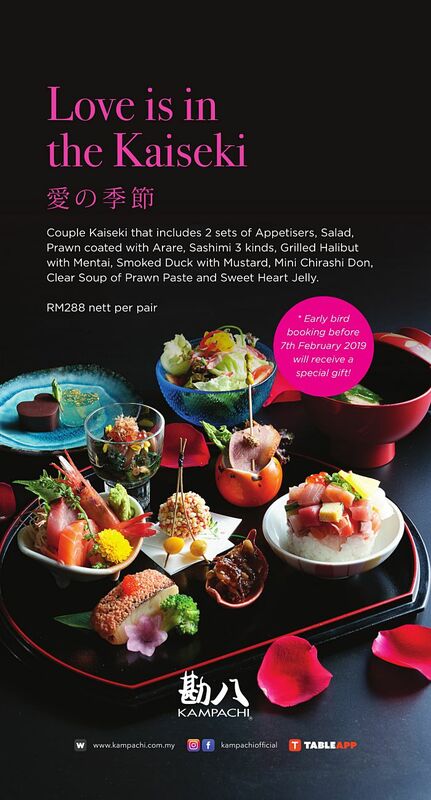 Price: From RM1136++ per couple. 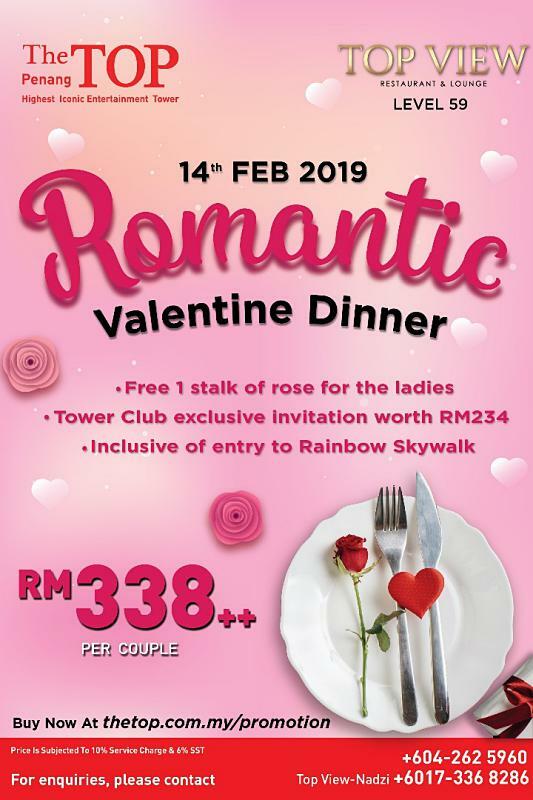 Highlight: A romantic dinner on the 38th floor relishing 360-degree city view and specialties like Smoked Salmon Tartar, Crustacean’s Bisque, Australian Black Angus Beef Tenderloin and other delights. 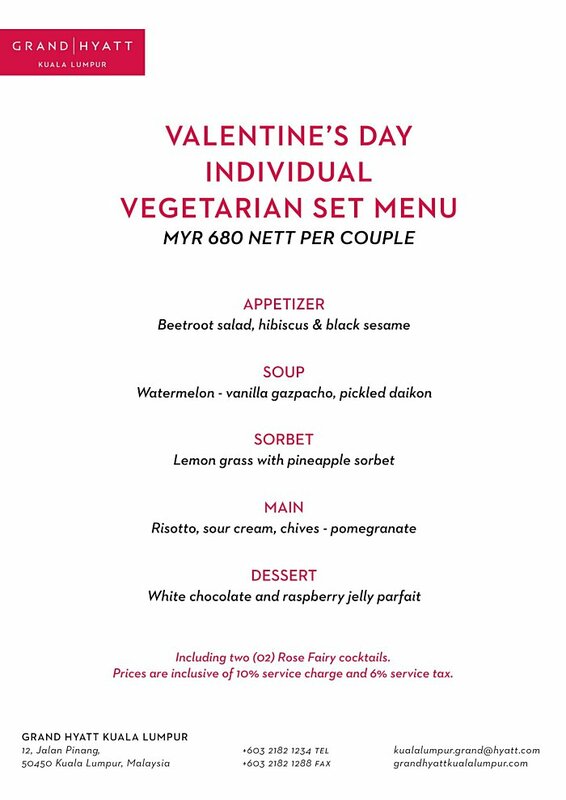 Price: RM680 nett per couple. 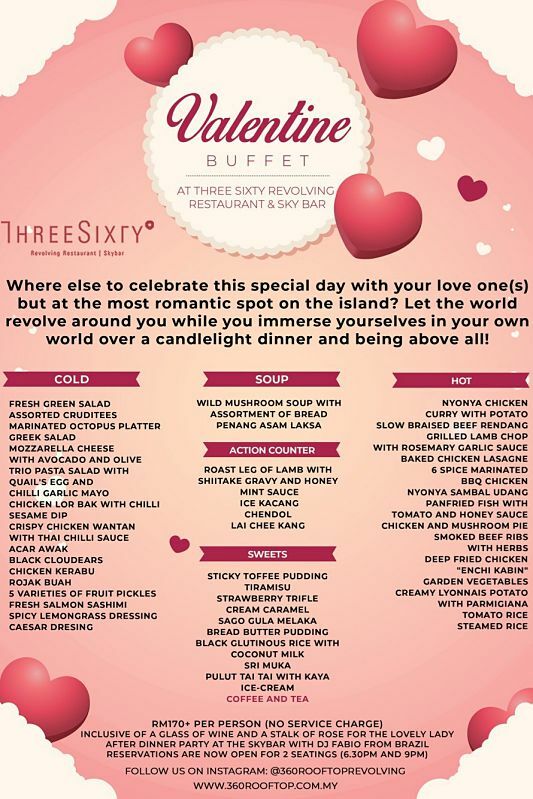 Highlight: Taking in the 360-degree city view on the 38th floor and relish specialties like Beetroot Salad, Lemongrass with Pineapple Sorbet, Risotto, Sour Cream, White Chocolate and more. 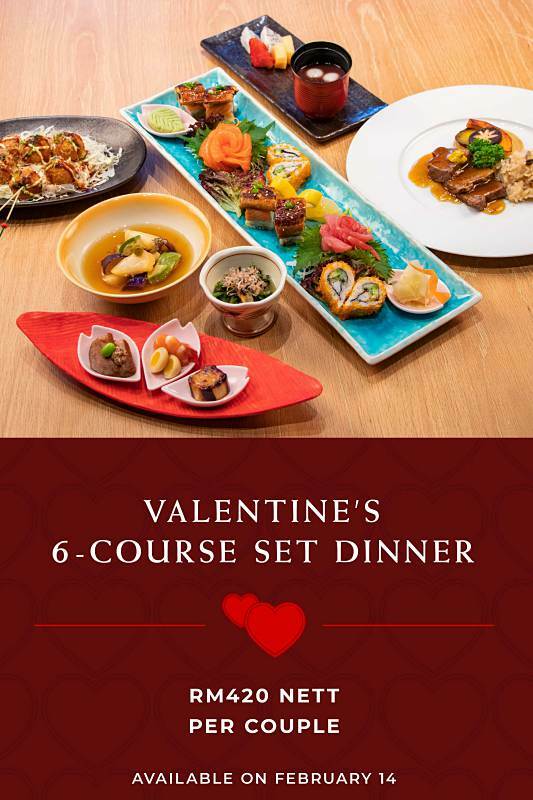 Highlight: Treat your loved one to a unparalleled view of the city by night and sumptuous Uni and King Crab Meringue, Amaebi Prawn, Ootoro Spring Roll, Oyster Ice Cream and more. 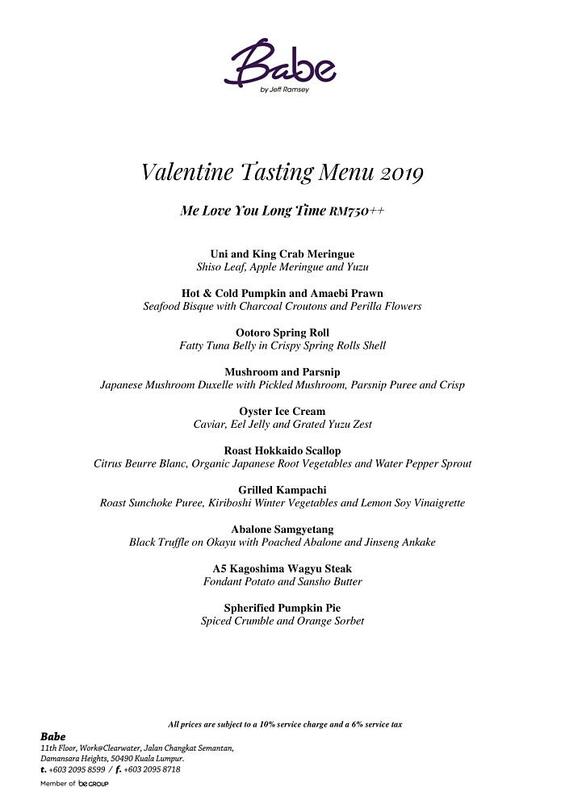 Highlight: Have a night filled with whimsy and wonderment savoring delights such as Roast Hokkaido Scallop, Grilled Kampachi, A5 Kagoshima Wagyu Steak, Sherified Pumpkin Pie and more refined dishes. 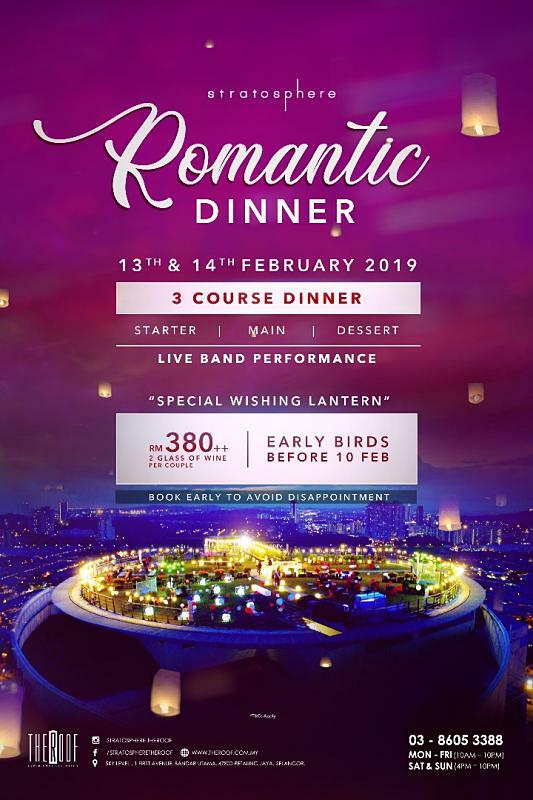 Highlight: Relish the quintessential rooftop dining experience with scenic city view and delights like Espresso Bisque, Pan Seared Foie Gras, “Hill Side” Lamb Loin, “French” Duck Fillet and more. 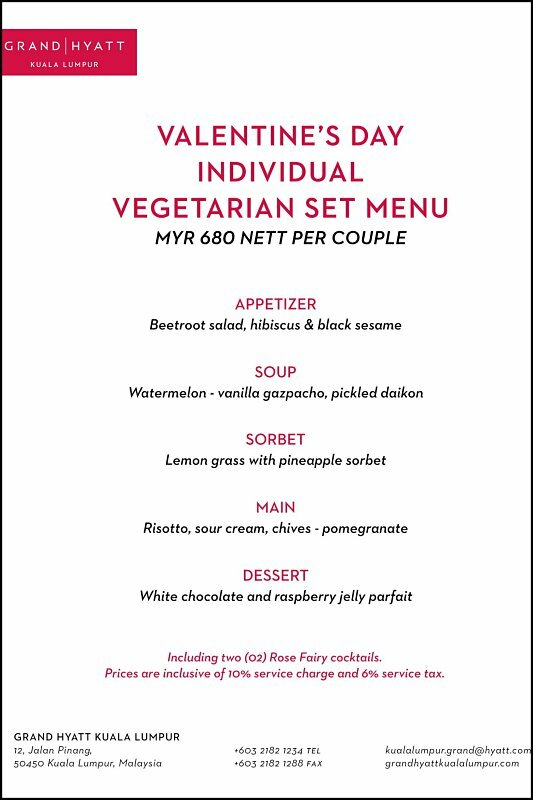 Price: RM776 nett per couple. 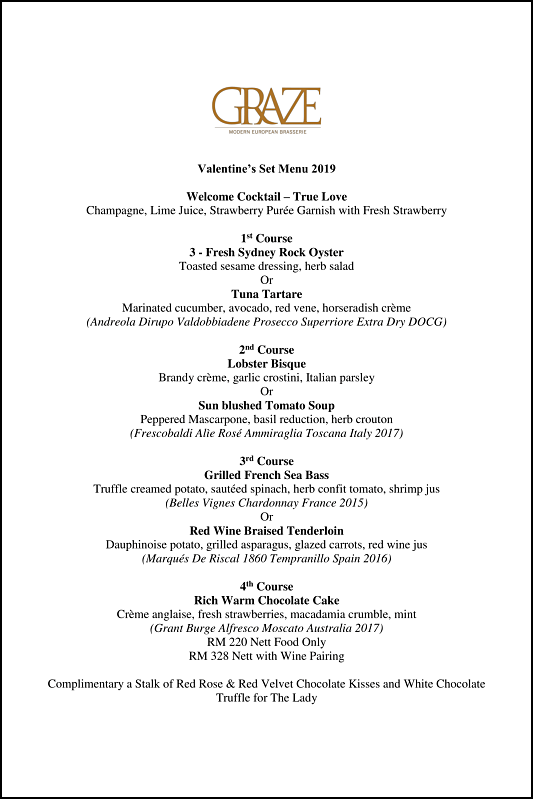 Highlight: Revel in a special night at one of the best steakhouses in town to savor Pan Seared Sea Scallops, Pan-Fried Foie Gras, Charcoal Grilled Black Angus Tenderloin and more. 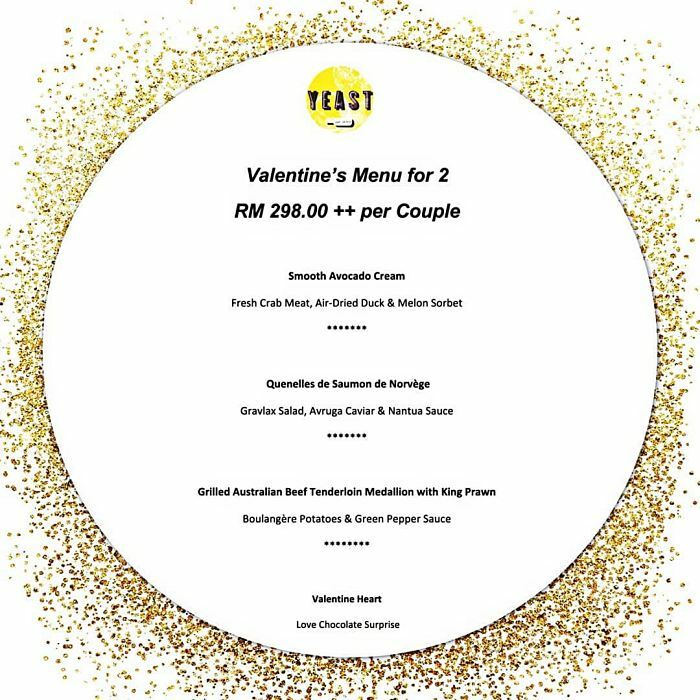 Highlight: Drift over the Bukit Bintang sky by dining under a see-through roof and savor delights such as Live Gallagher Oyster, Grilled Pure Angus Tenderloin, Chocolate Pralinosa and more. 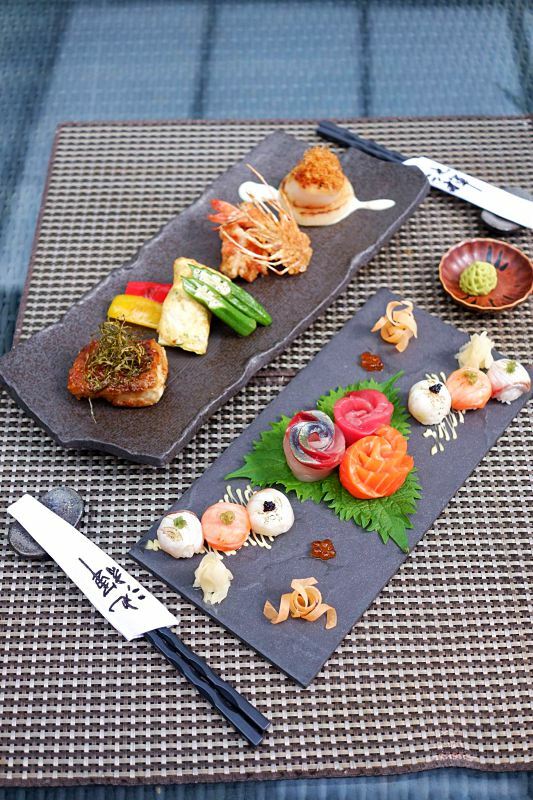 Highlight: Enjoy a perfect getaway right in the city by dining at this hilltop restaurant and revel in Sauteed Squid, Pan-Seared White Cod, Deep-Fried Lobster, Steamed Jasmine Rice and other delights. 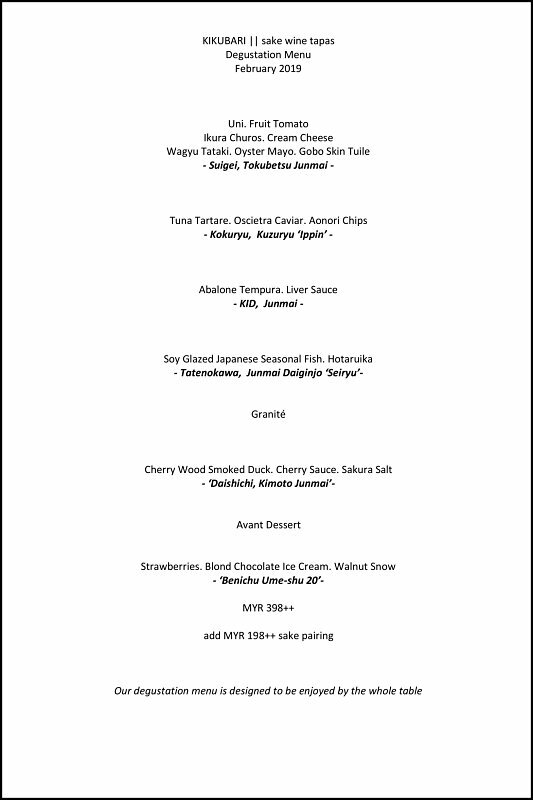 Highlight: A hearty and sensory dinner of the edge of a lush forest with delights like Fresh Salmon Roll, Deep-Fried Crab Cheese Ball, Barbeque Lamb Rack, Steamed Cod Fish and so on. 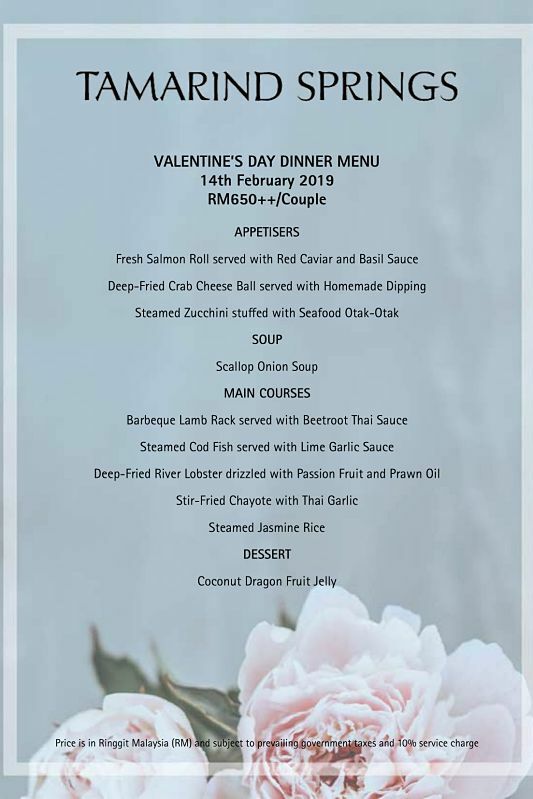 Highlight: Surprise your loved one with Asian fusion dishes such as Salmon Otak-Otak with Passion Fruit Caviar, Grilled Lobster Tail, Capsicum Bisque, Pan-Seared Scallop and other delights. 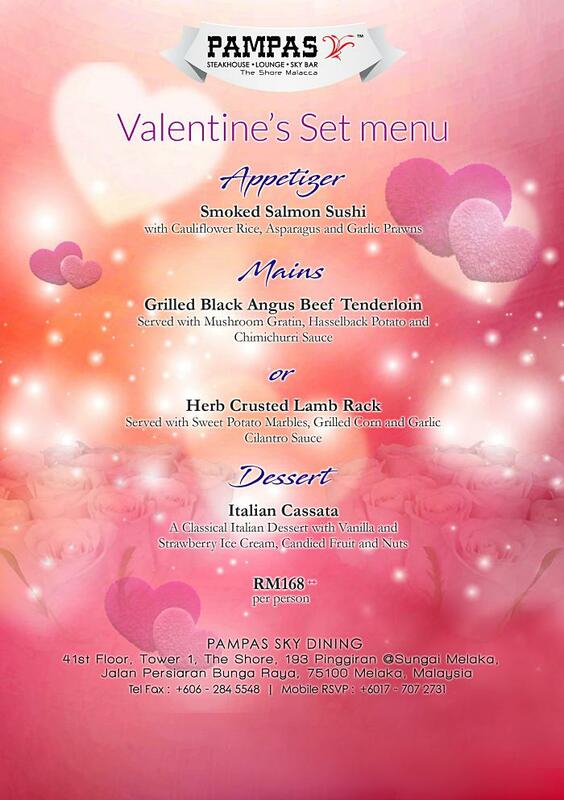 Highlight: Get delighted by celebrating love at a rooftop terrace on the 58th floor overlooking the cityscape of KL. 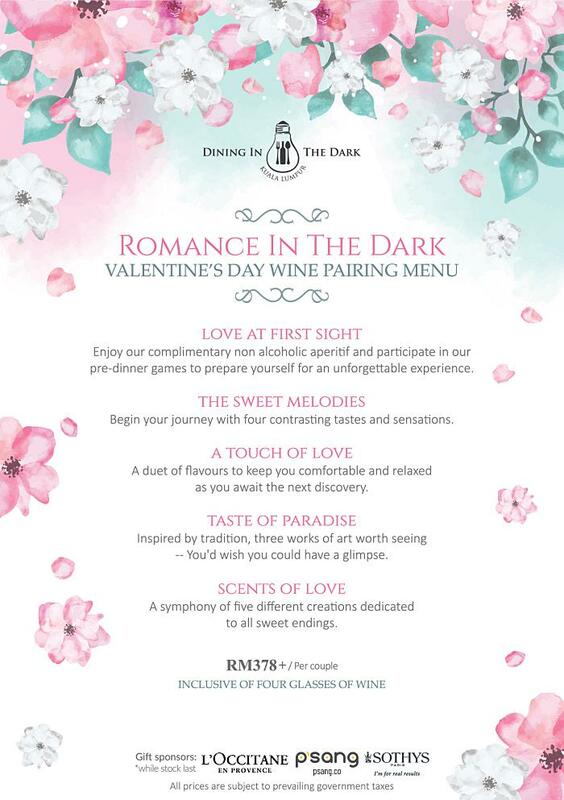 Complimentary a stalk of rose and night band music with all-time love ballads! 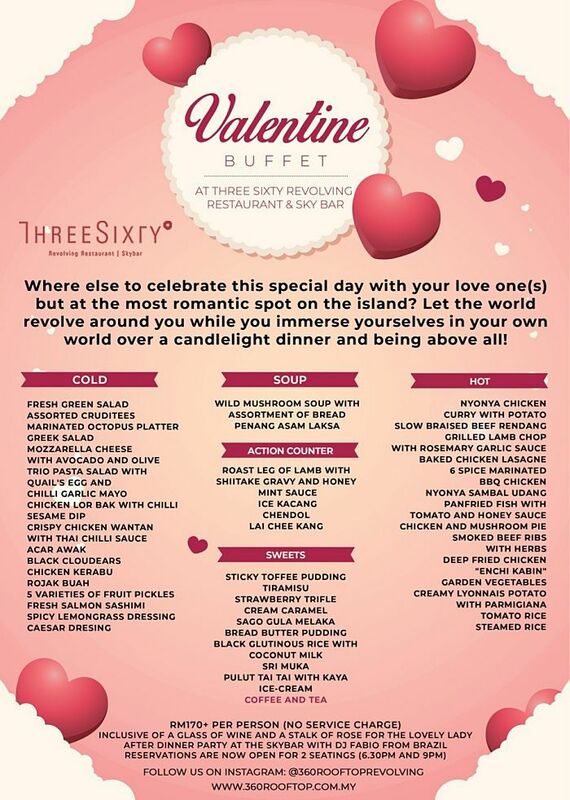 Price: From RM698 nett per couple. 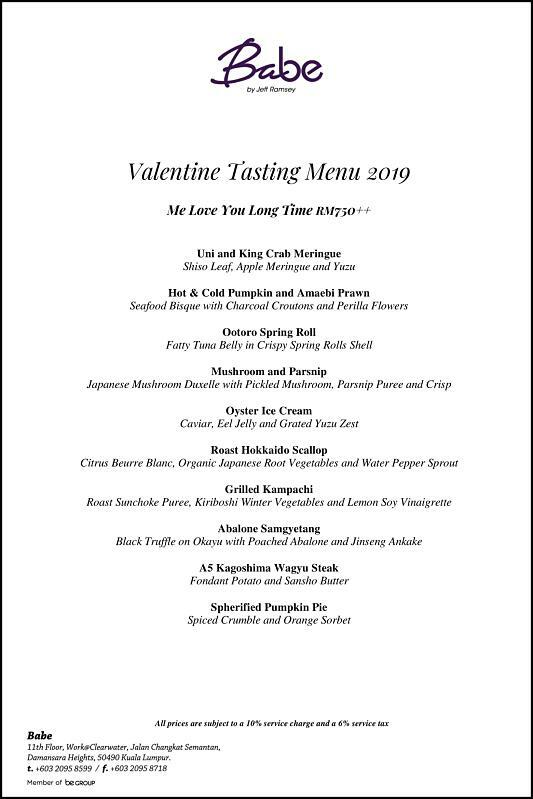 Highlight: Luxuriate in a one-of-a-kind degustation dinner with delights such as Soy Glazed Japanese Seasonal Fish, Cherry Wood Smoked Duck, Blond Chocolate Ice Cream, Abalone Tempura and so on. 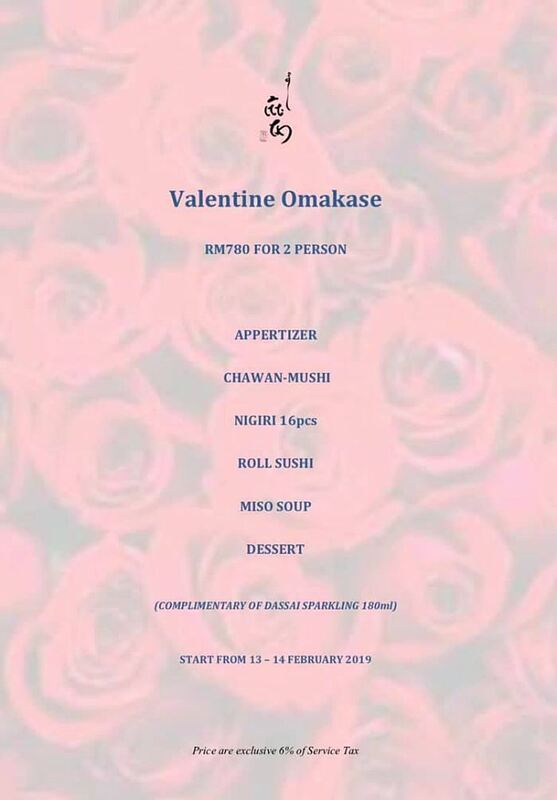 Highlight: Bask in the love season with a special Omakase course for your special Valentine’s Day featuring Chawan-Mushi, 16pcs of Nigiri, Roll Sushi, Miso Soup, complimentary Dassai Sparkling and more. 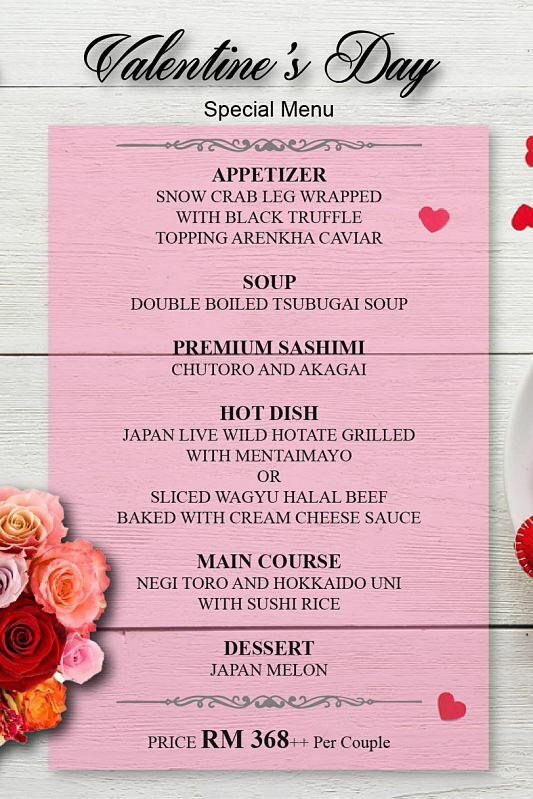 Highlight: Savor an exquisite menu of authentic Japanese cuisine curated by the top chefs at the restaurant along with a heart-shaped chocolate praline to commemorate this special occasion. 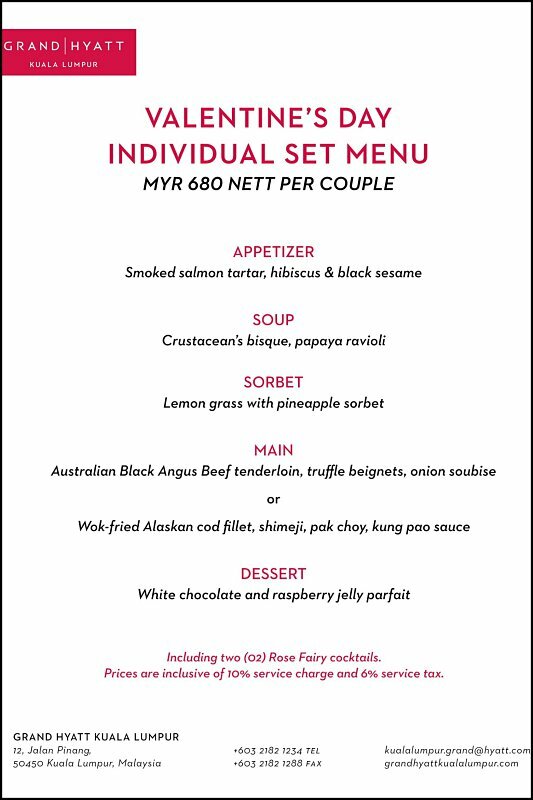 Price: RM888 nett per couple. 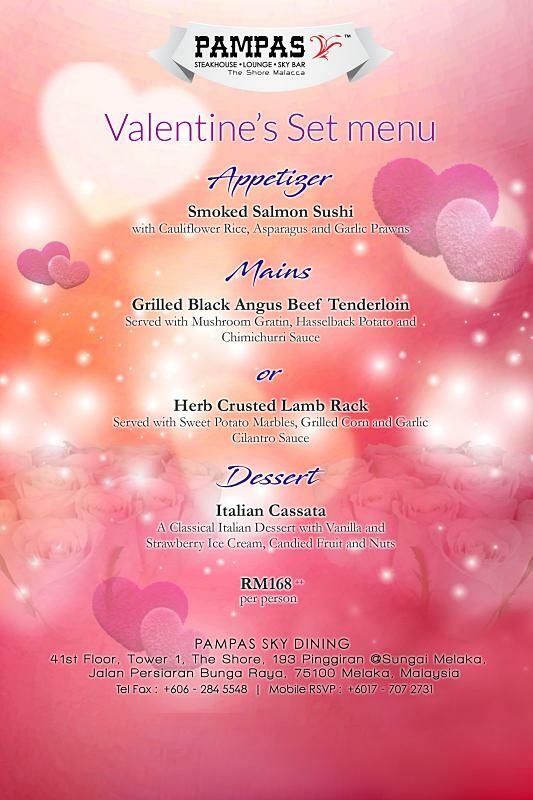 Hightlight: Immerse in a romantic night with a fantastic view of Penang and savor Rose of Smoked Salmon, Angus Tenderloin, Charred and Sous Vide Vegetable. 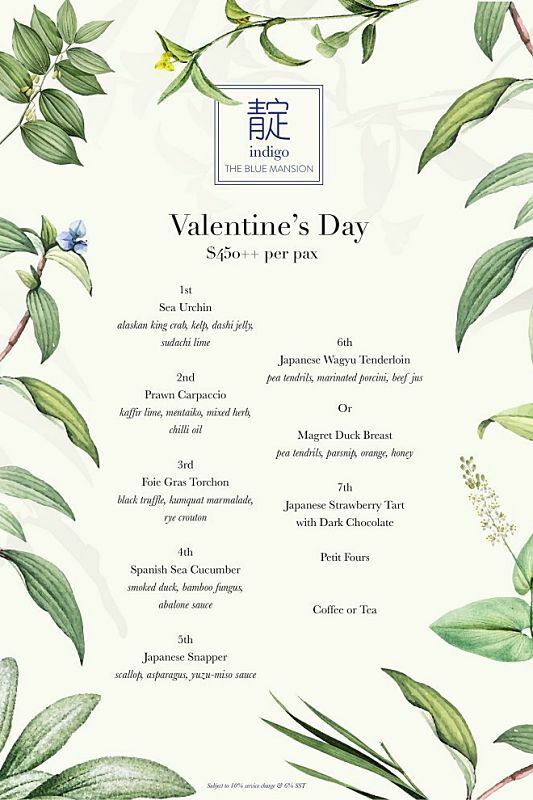 Free 1 stalk of roses and more! 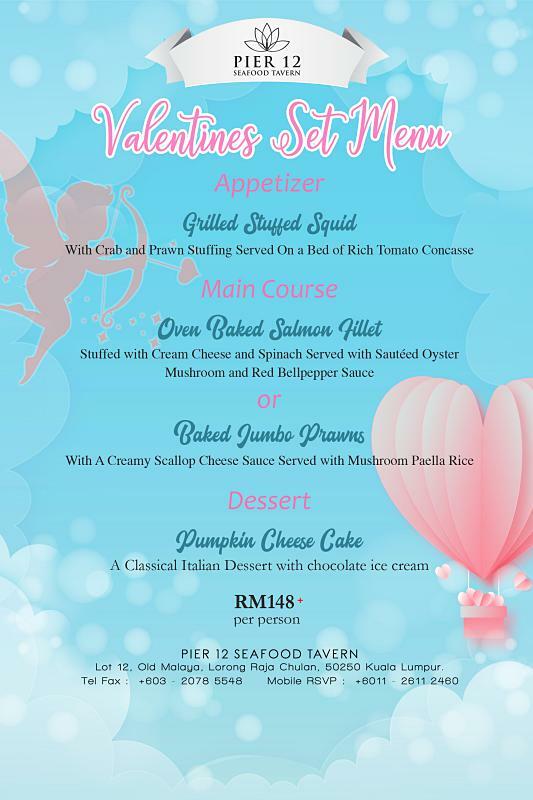 Highlight: Gratify your Valentine by taking in the magnificent view of Penang while enjoying Chilled Rock Oyster, Arancini Black Wild Rice, Herb’s Crusted Tenderloin of Angus Beef and more. 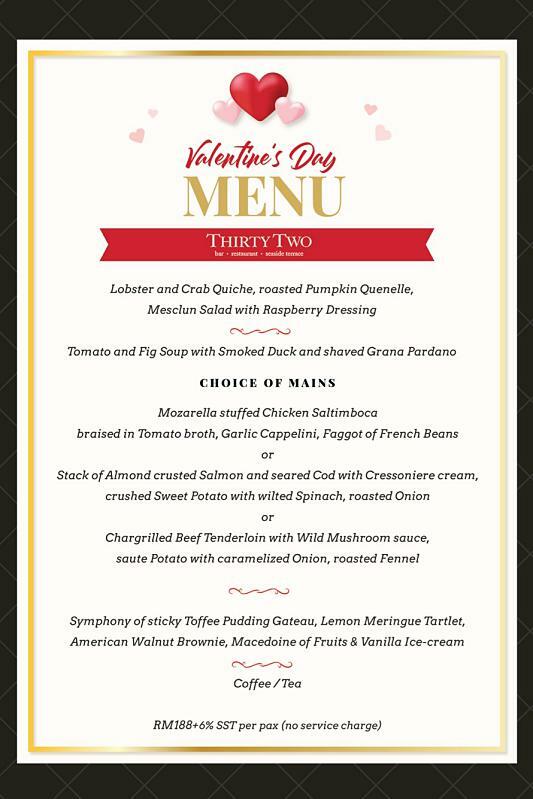 Highlight: Enjoy a dinner at a beautiful Italianate villa by the sea with delicacies like Lobster and Crab Quiche, Smoked Duck, Chargrilled Beef Tenderloin, Seared Cod, Stuffed Chicken and many others. 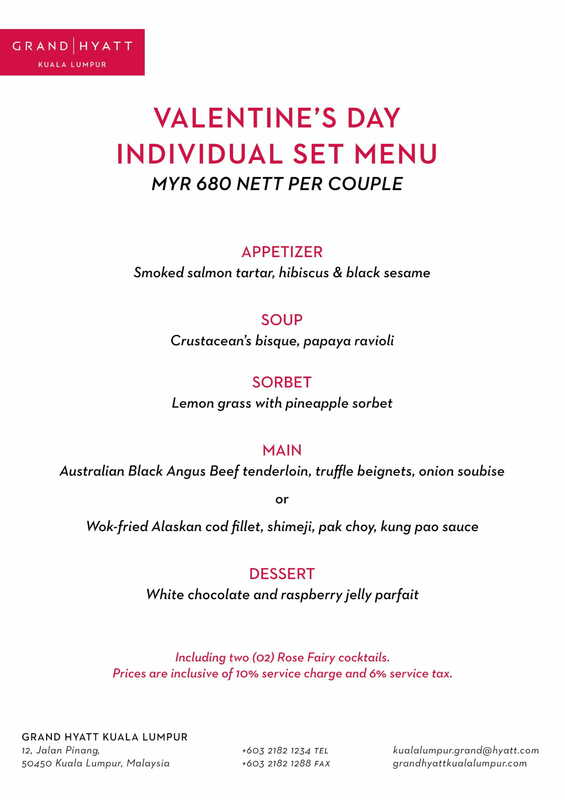 Hightlight: Gratify your other half with a candlelight dinner and a delectable buffet curated by nyonya chefs including dishes like Nyonya Chicken, Pulut Tai Tai with Kaya, Smoked Beef Ribs and more. 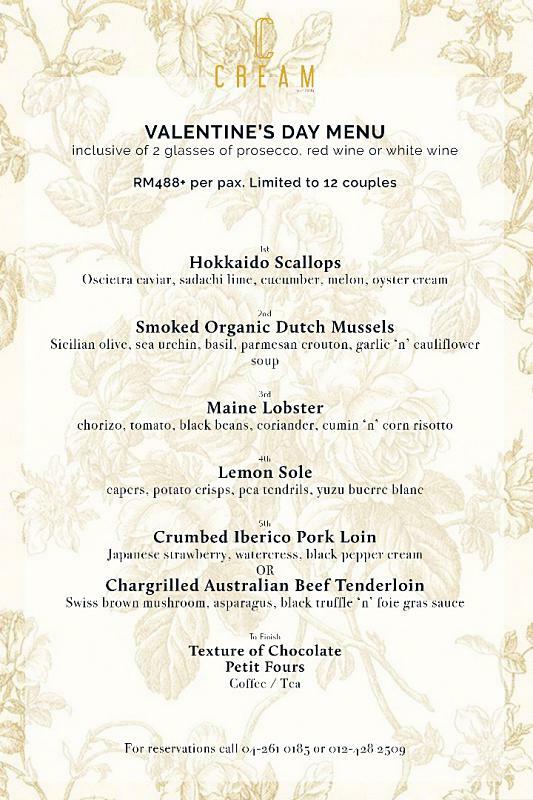 Highlight: Immerse in a romantic ambience at the mansion and relish specialties like Japanese Snapper, Foie Gras Torchon, Prawn Carpaccio, Japanese Wagyu Tenderloin and other great delights. 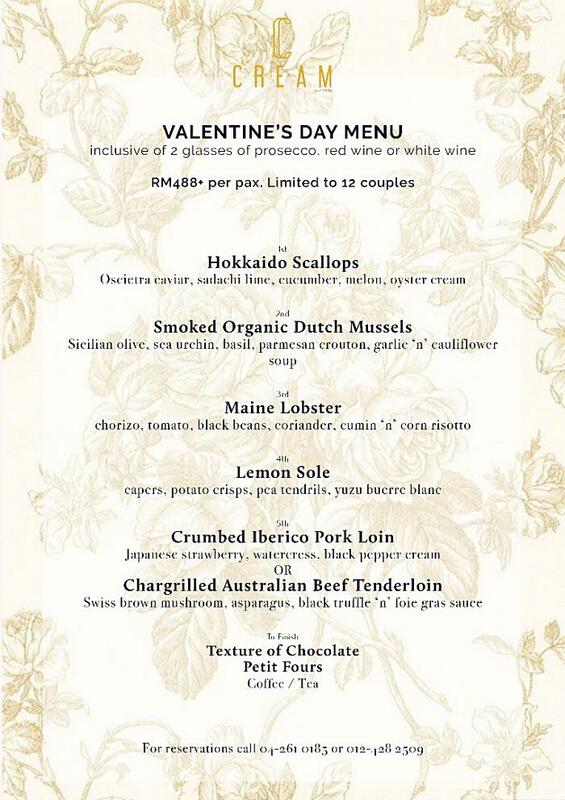 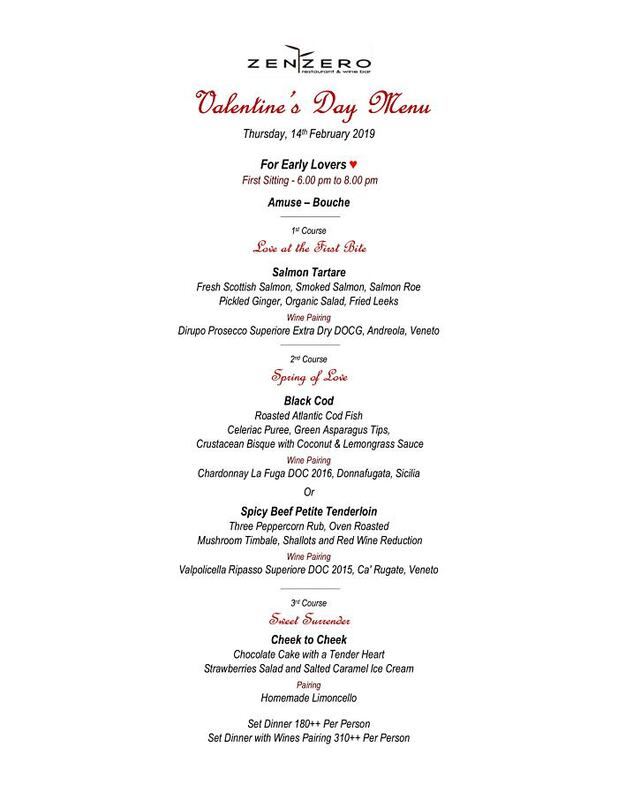 Highlight: Surprise your loved one with a romantic dinner of European delights featuring Hokkaido Scallops, Smoked Organic Dutch Mussels, Maine Lobster and many more delicacies. 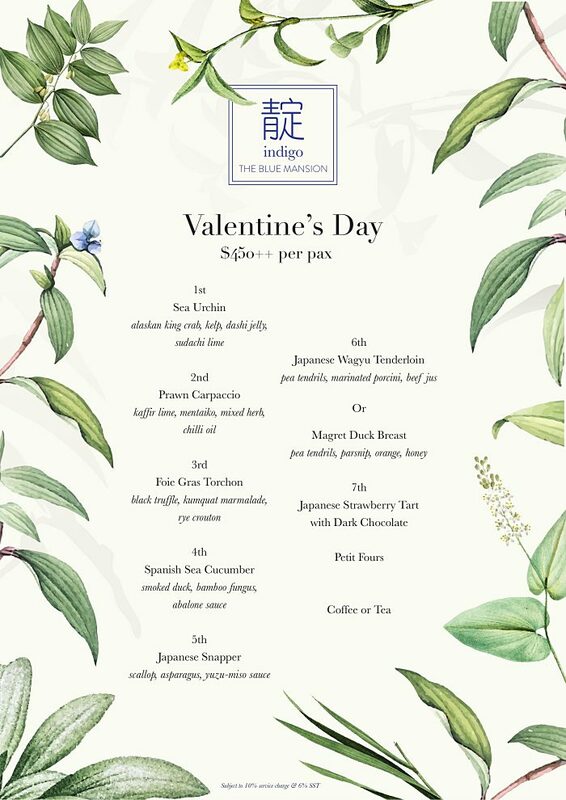 Highlight: Amaze your dearest by dining at this historical mansion of sophisticated design, craftsmanship and savor Oyster, Foie Gras, Lobster, Australian Wagyu, Tuna Hara Ichiban and other delights. 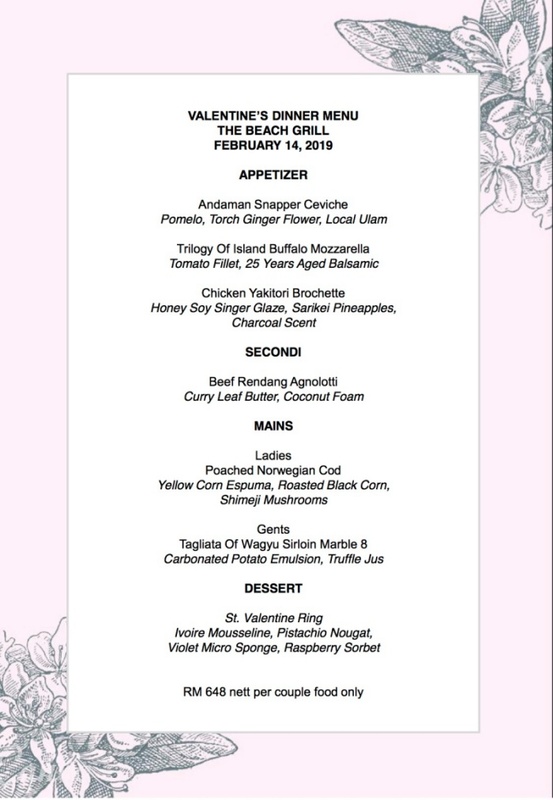 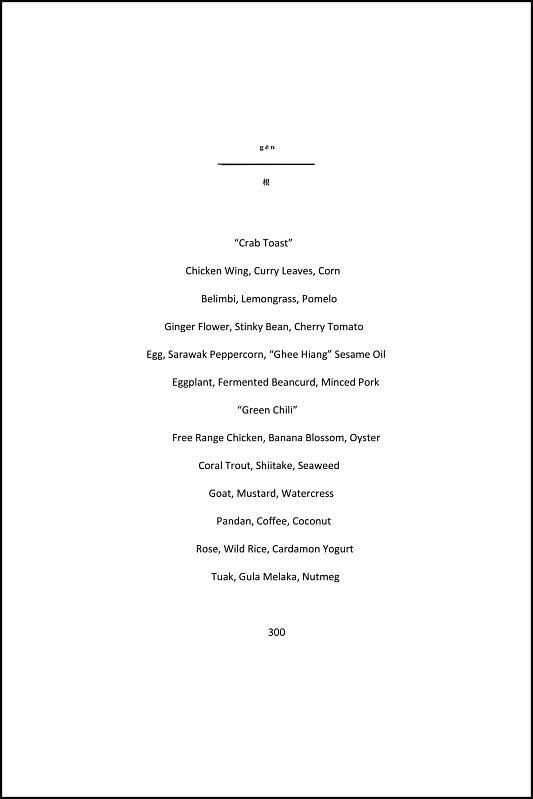 Highlight: Discover beautiful local produces and flavors with a menu of progressive cuisine featuring dishes like Coral Trout, Free Range Chicken, Got, Wild Rice, Tuak and more delicious delights. 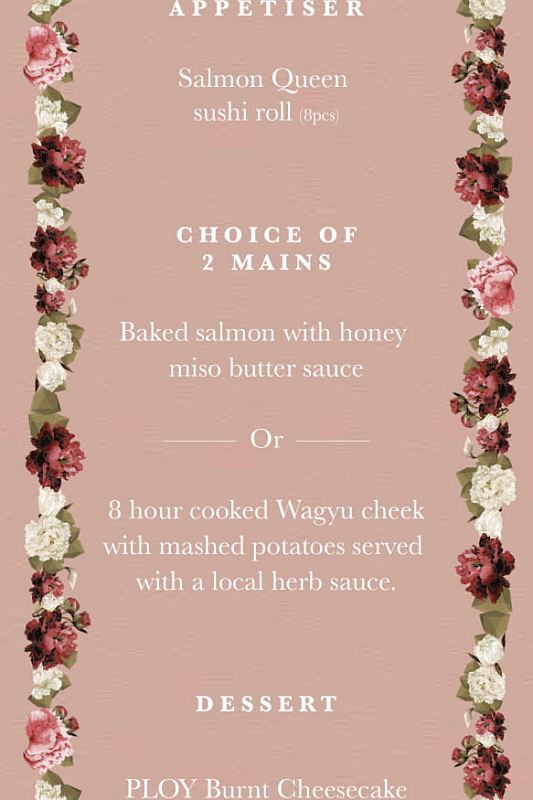 Highlight: Delve into a delightful dinner at this izakaya-style bar and restaurant with sumptuous dishes such as Wagyu Short Loin, Lobster “Ravioli”, Hokkaido Scallops and other delicacies. 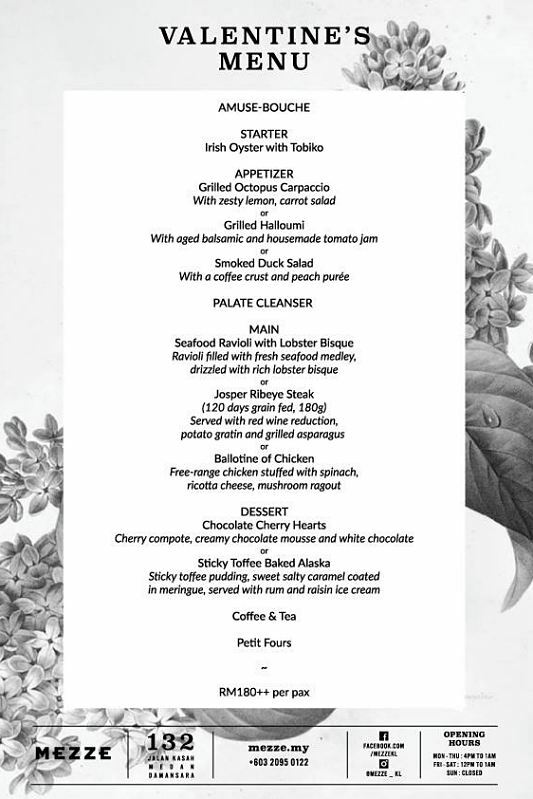 Highlight: Dine at one of the beautiful heritage mansions in town and titillate your palate with delights like Candied Tomato, Jamon Ibérico, Beef Chateaubriand, Cucumber Sorbet, Cheesecake Ice Cream and more. 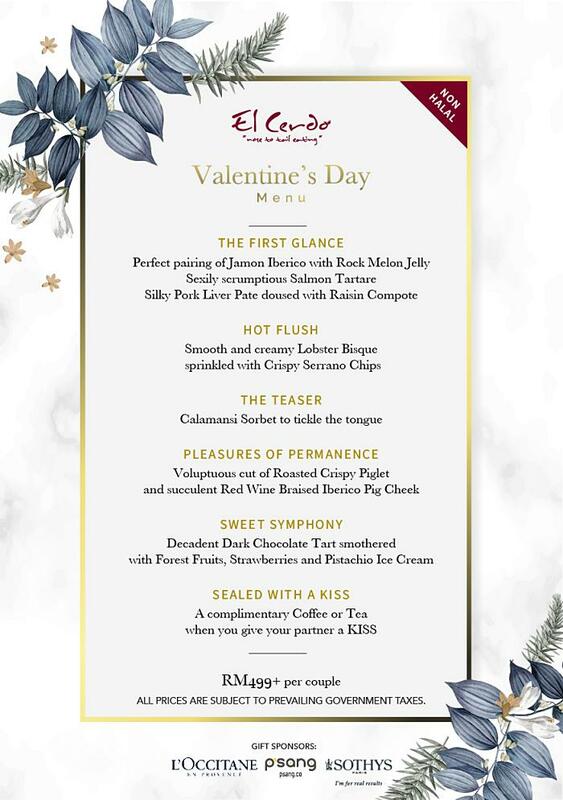 Price: RM738 nett per couple. 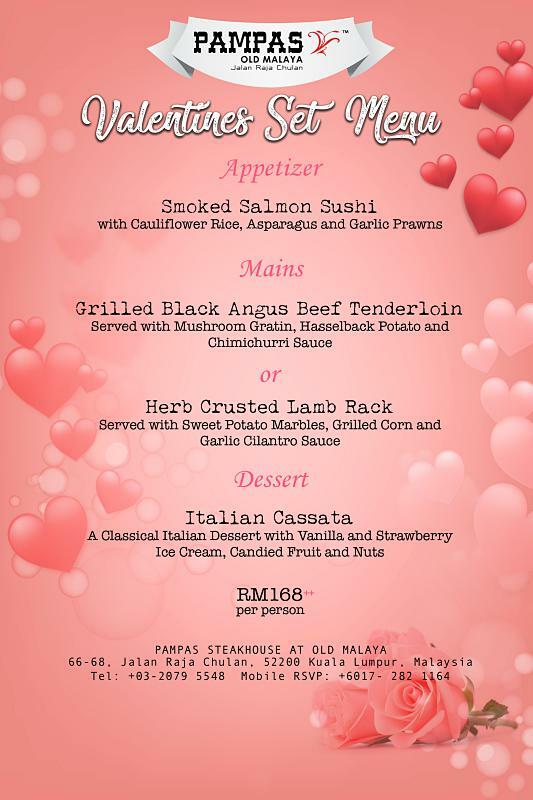 Highlight: Dine in an unassuming atmosphere with a splendid view of Melaka by night and relish Smoked Salmon Sushi, Grilled Black Angus Beef Tenderloin, Italian Cassata and more. 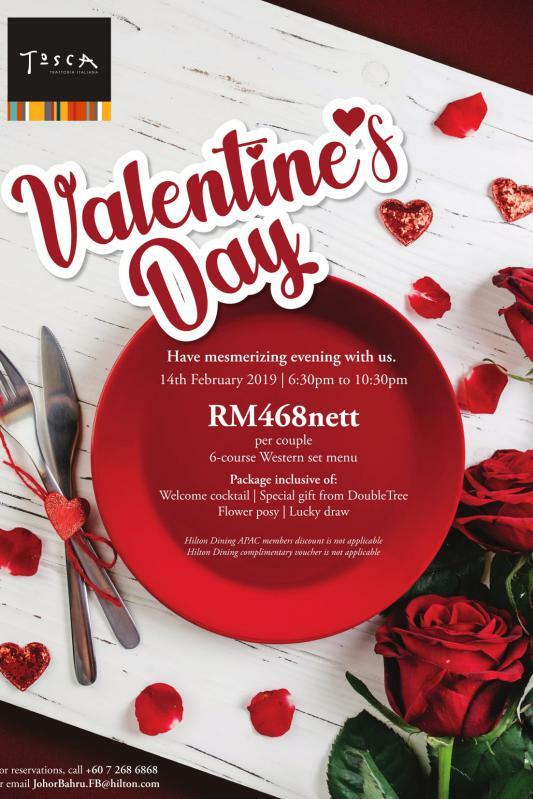 Highlight: Have a mesmerizing evening at the restaurant savoring a 6-course Western set menu featuring delectable delicacies with a welcome cocktail, flower posy, special gift and lucky draw. 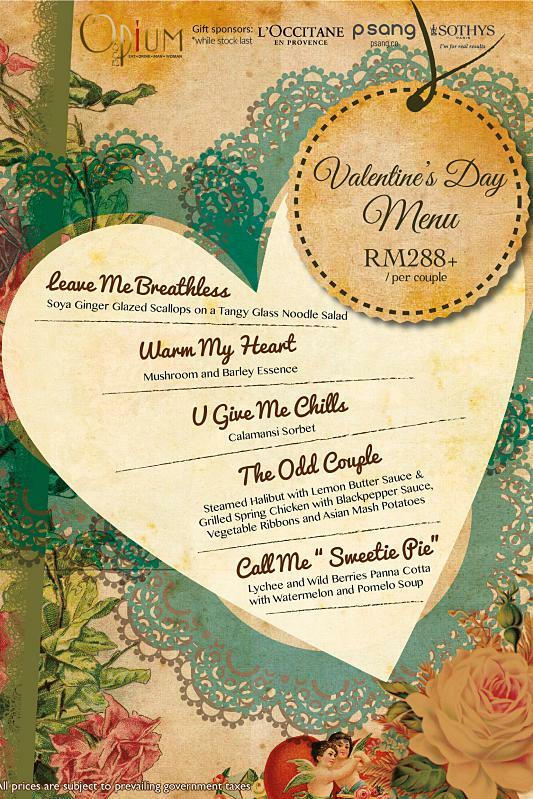 Price: RM468 nett per couple. 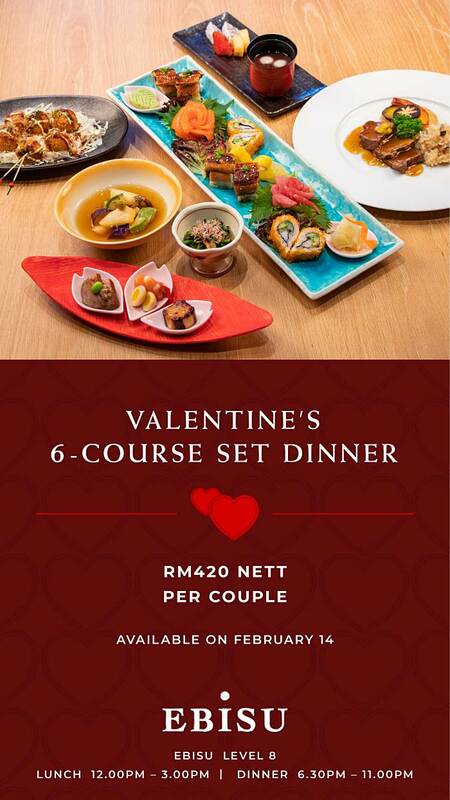 Highlight: Gratify your other half by indulging him/her in Western delights at the beach front such as Andaman Snapper Ceviche, Chicken Yakitori Brochette, Beef Rendang Agnolotti, Poached Norwegian Cod and more. 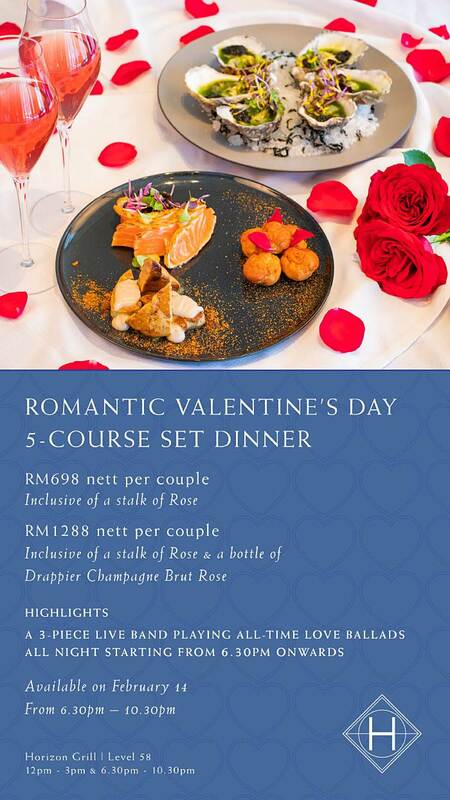 Price: From RM648 nett per couple. 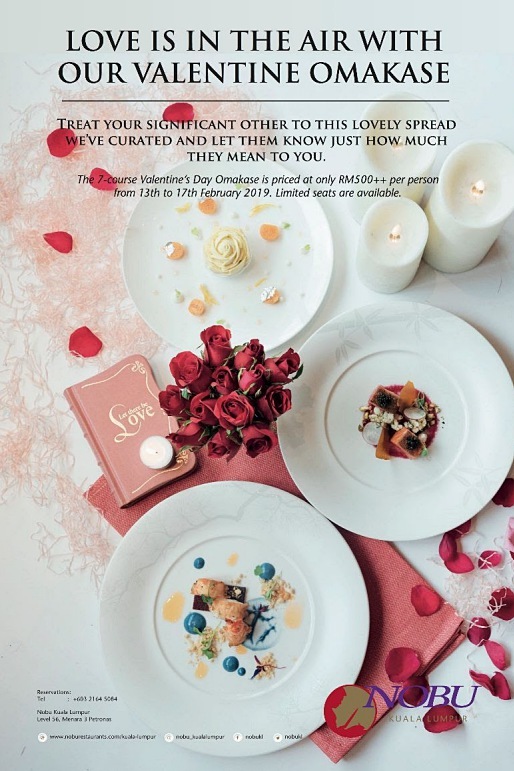 Highlight: Get delighted by incredible local flavors in a relaxed chic atmosphere with delicacies like Heart-Shaped Walnut Beetroot Scones, Opalys Cake, Caraibe Crunch, Lovely Macaroon, Barbecue Chicken and so on. 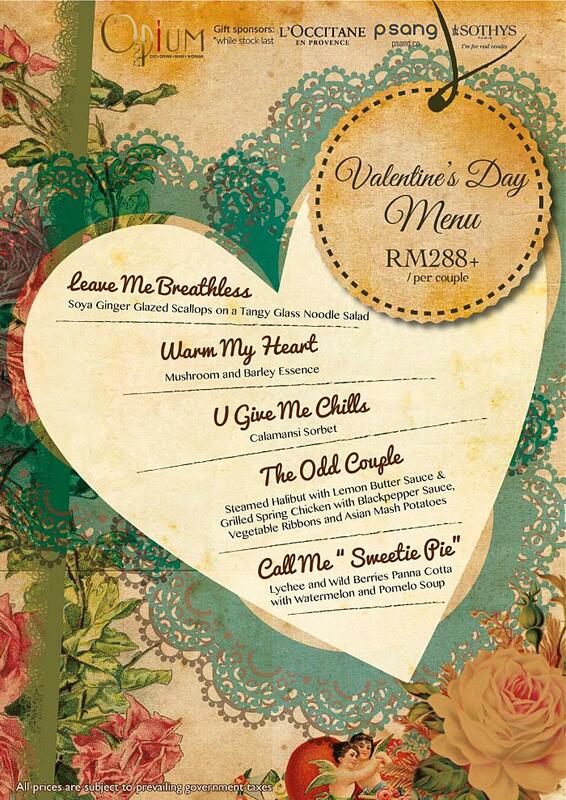 Price: From RM350 nett per couple. 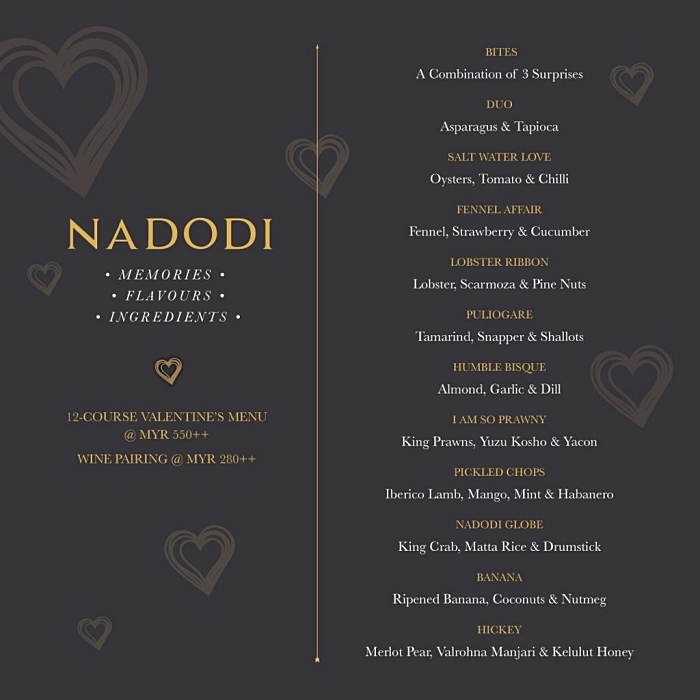 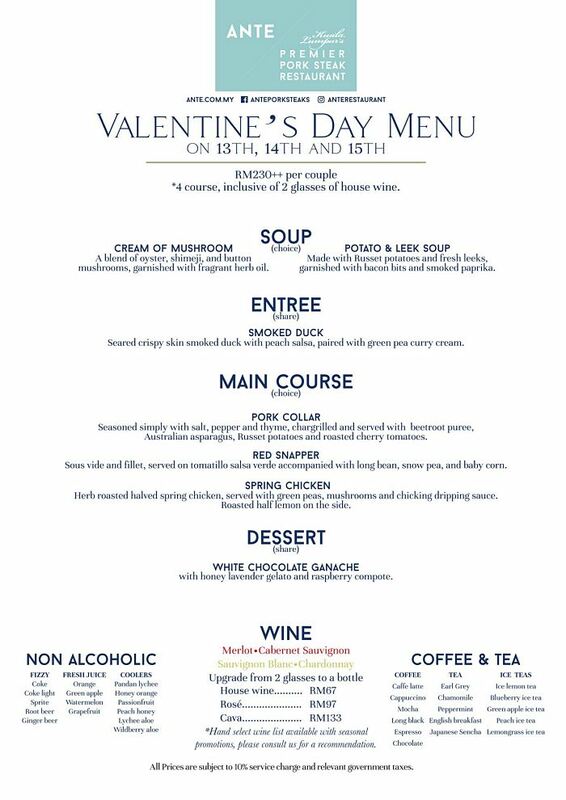 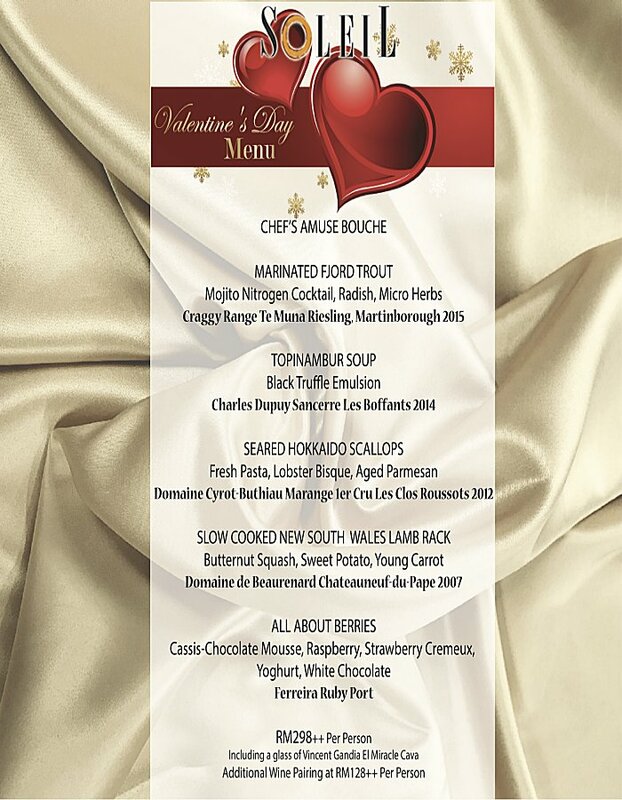 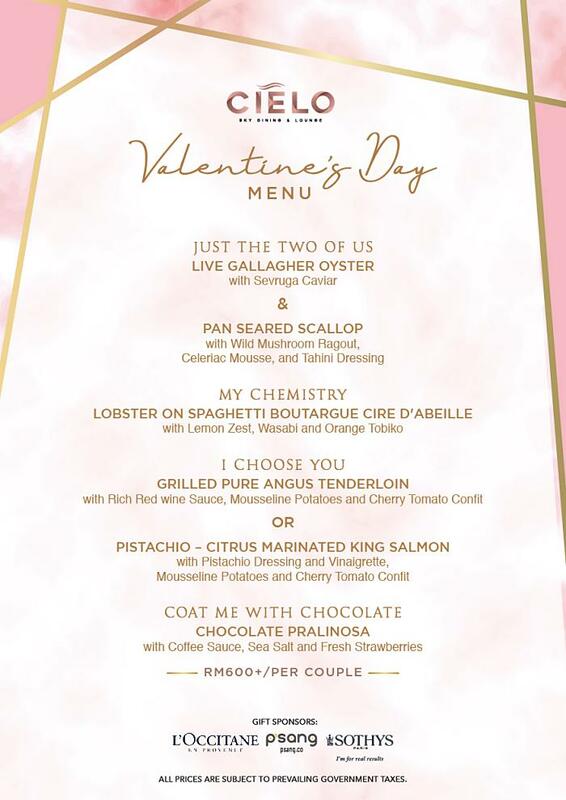 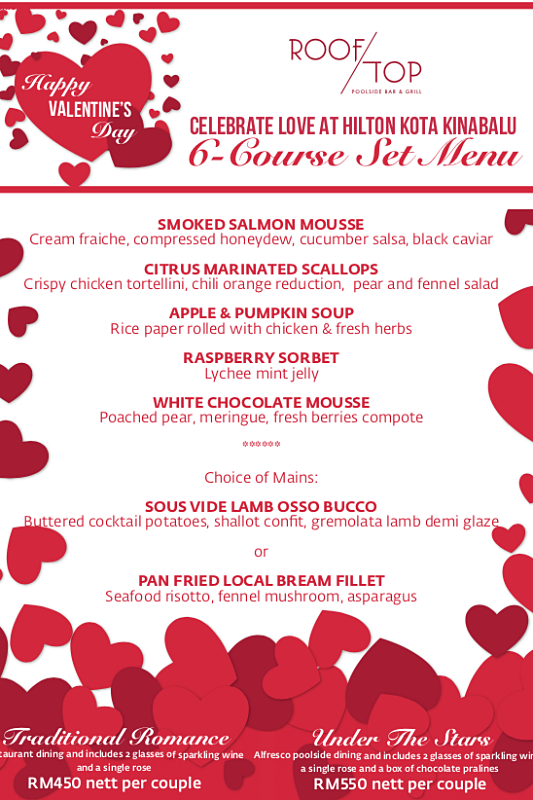 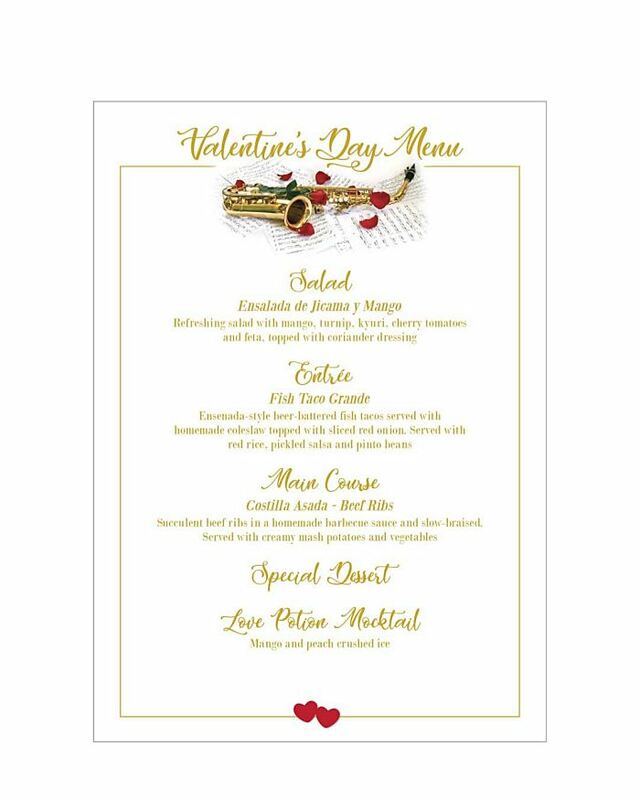 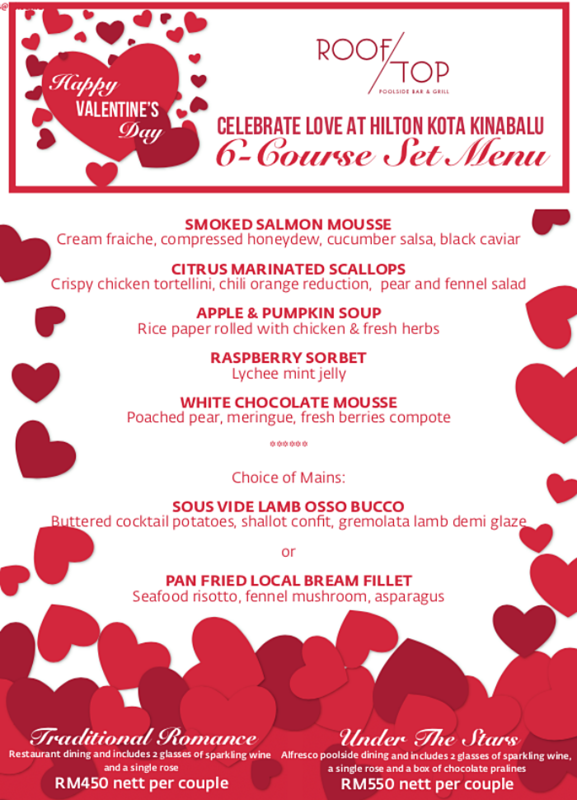 Highlight: Celebrate love with an incredible 6-course set menu featuring Smoked Salmon Mousse, Raspberry Sorbet, White Chocolate Mousse, Sous Vide Lamb Osso Bucco or Pan Fried Local Bream Fillet and more. 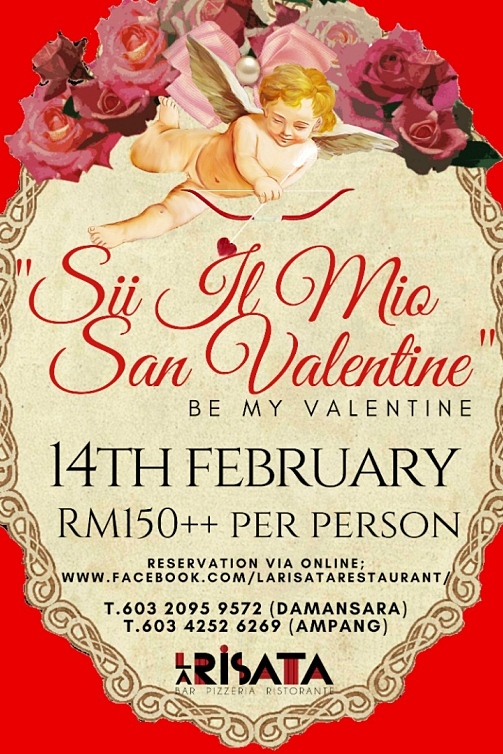 Price: From RM450 nett per couple.